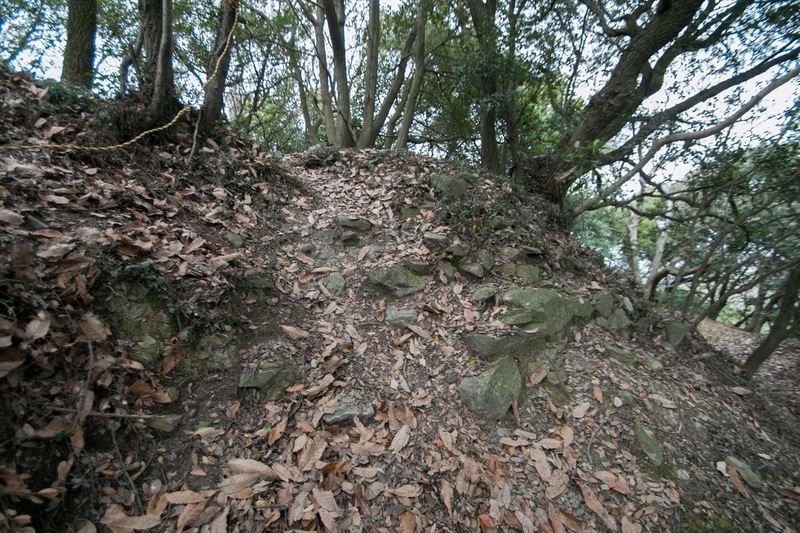 Amagiri castle (天霧城) is built over Amagiri-yama mountain, one of about 350 meter height from hillside at 5 kilometer west of current Marugame city central. 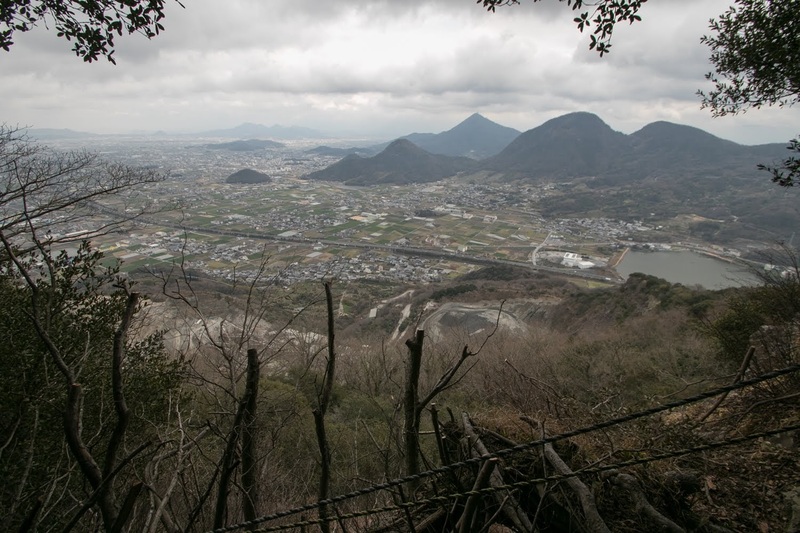 Amagiri-yama mountain exists at the coastal edge of line of mountains which separates western half of Sanuki province (Kagawa prefecture) into Marugame area and Kannonji area. 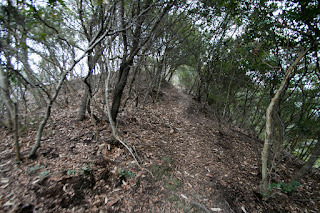 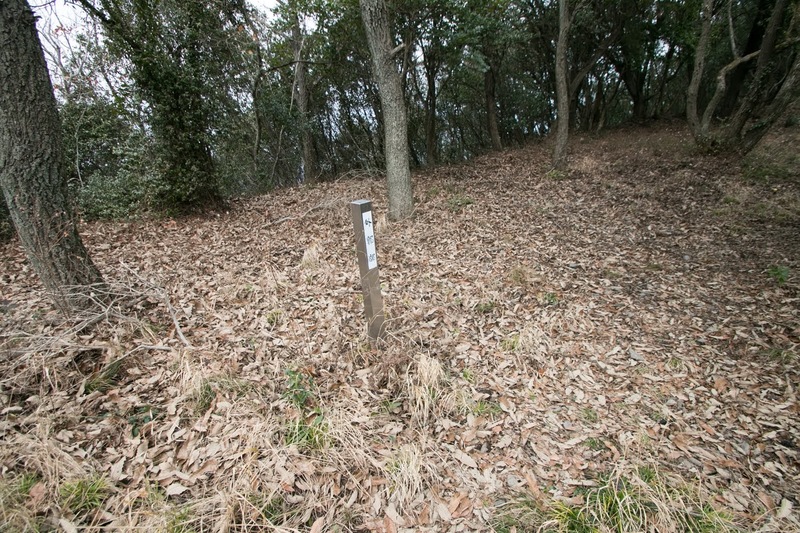 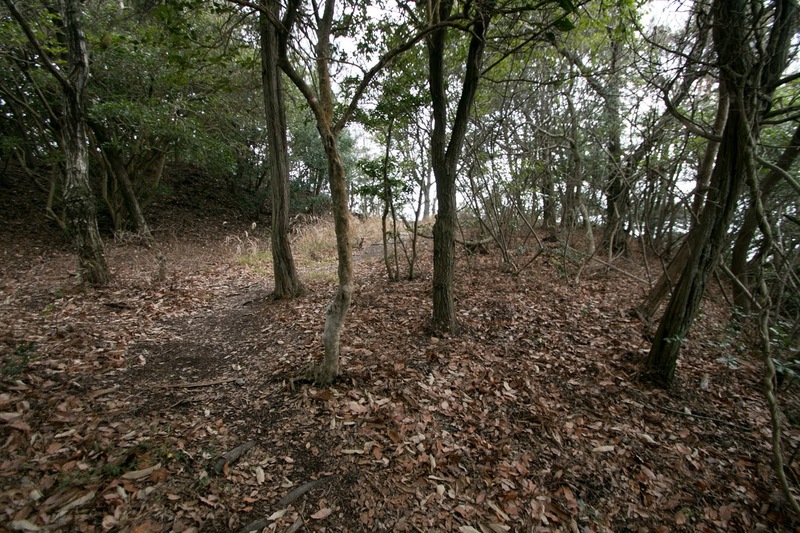 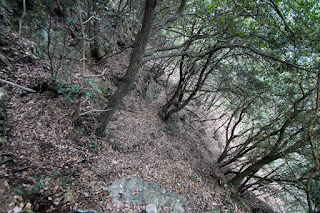 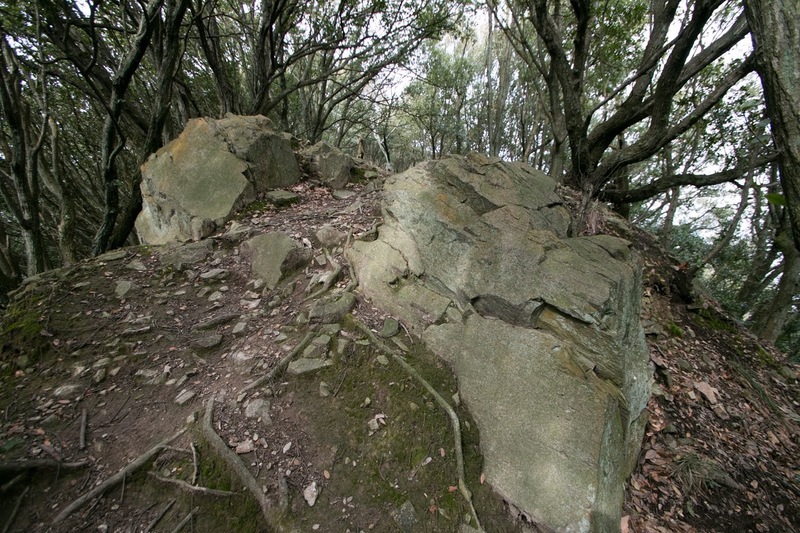 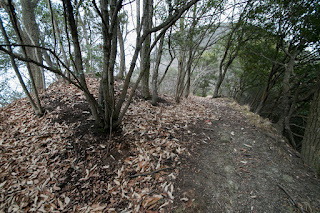 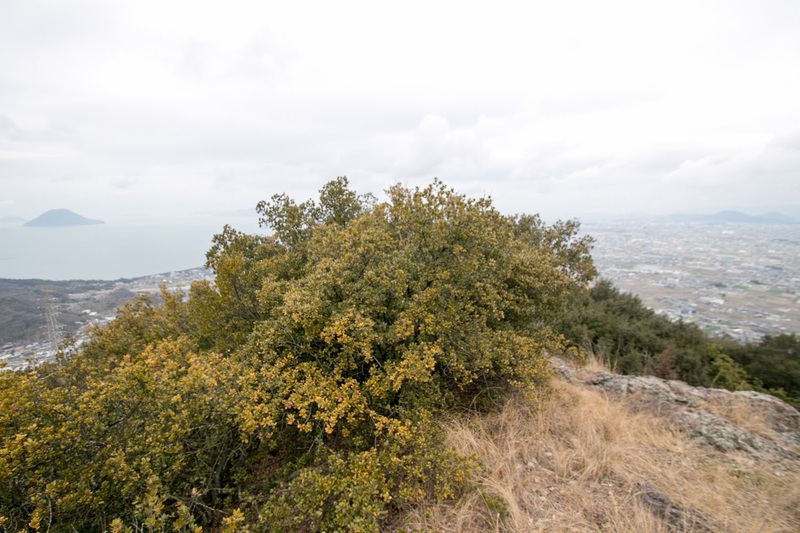 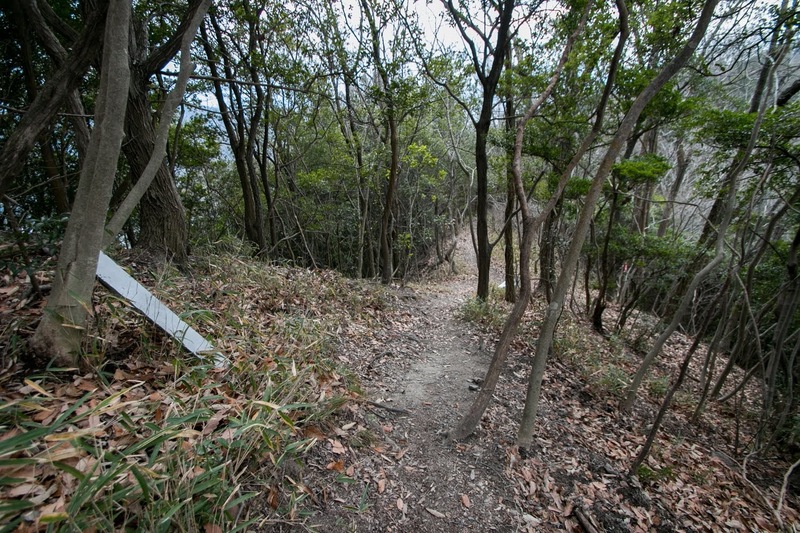 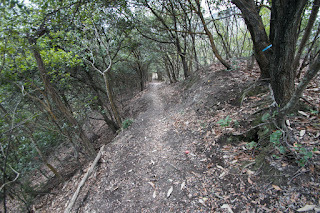 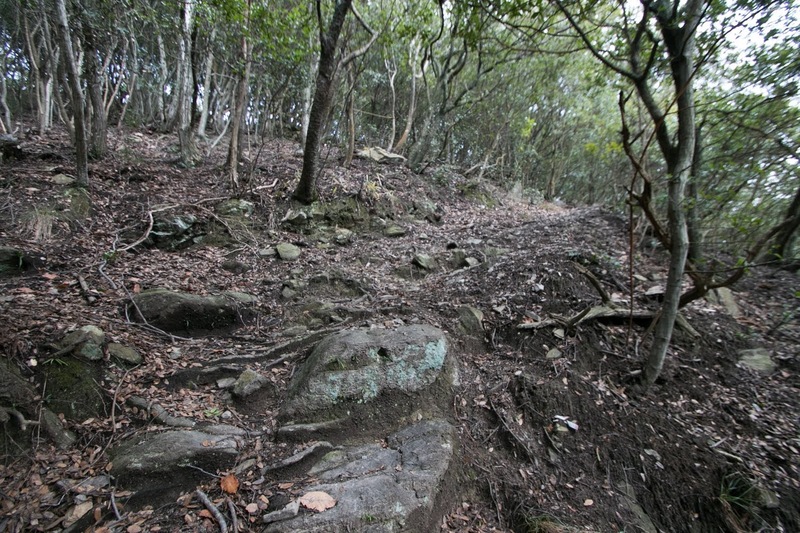 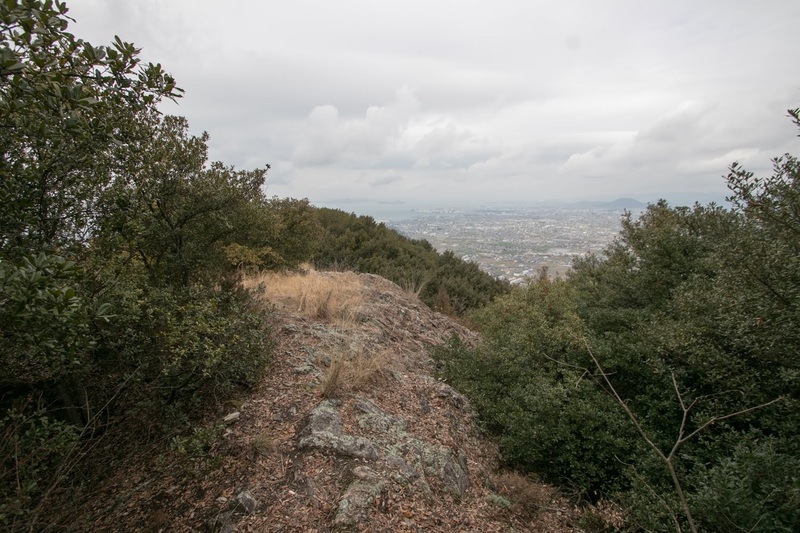 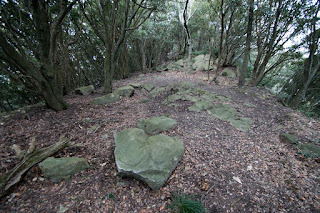 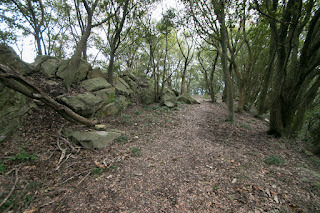 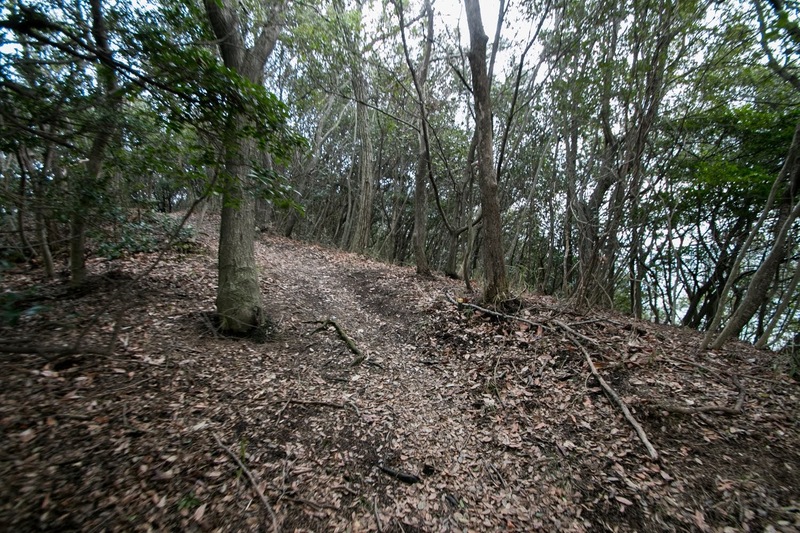 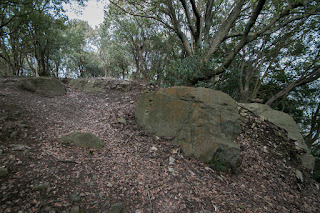 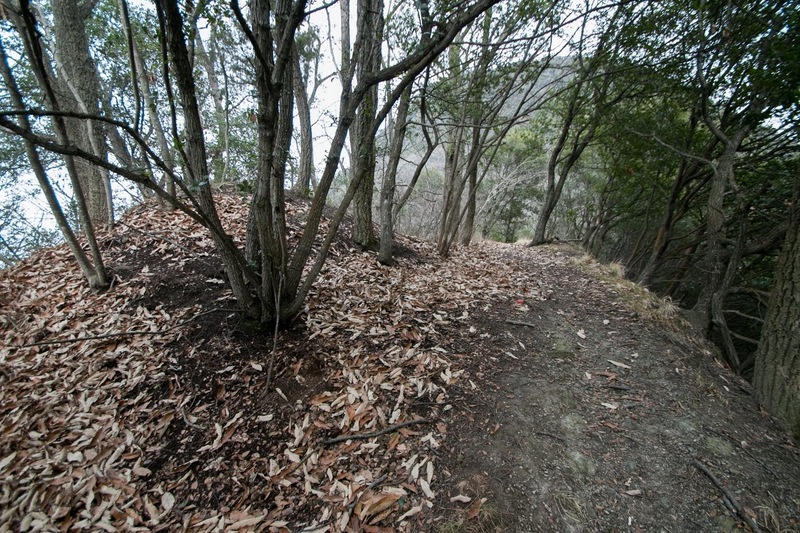 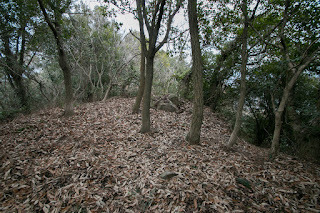 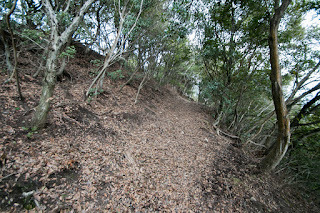 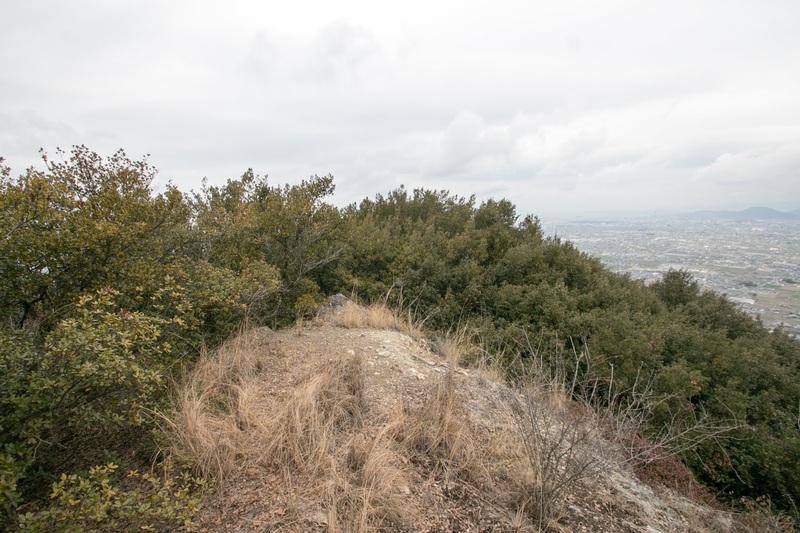 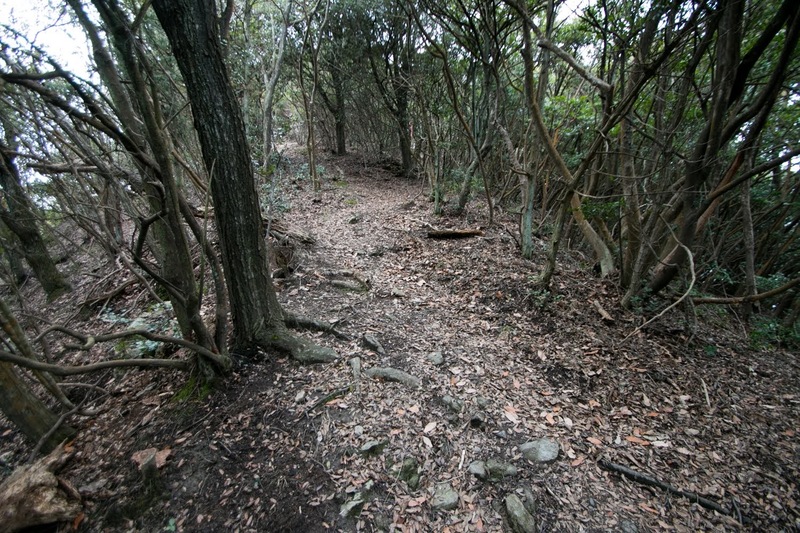 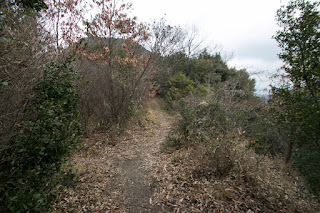 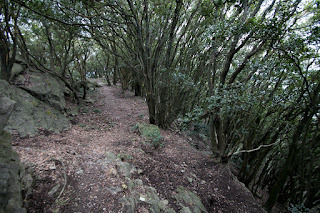 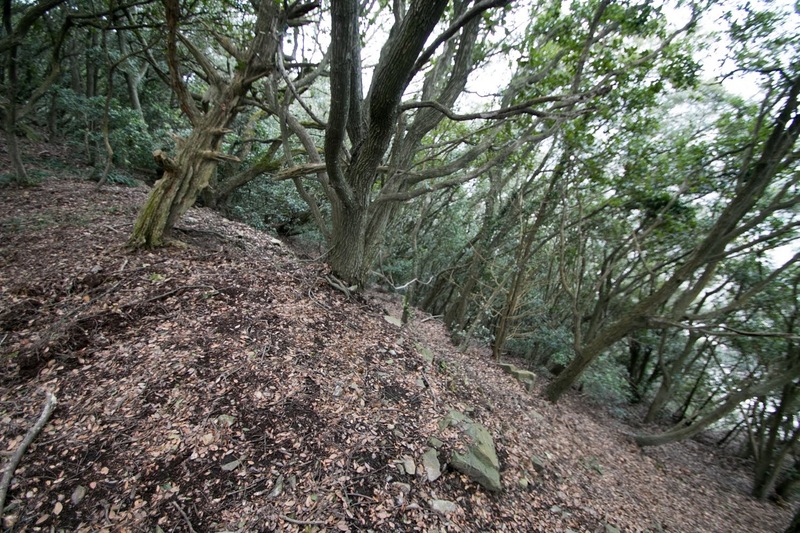 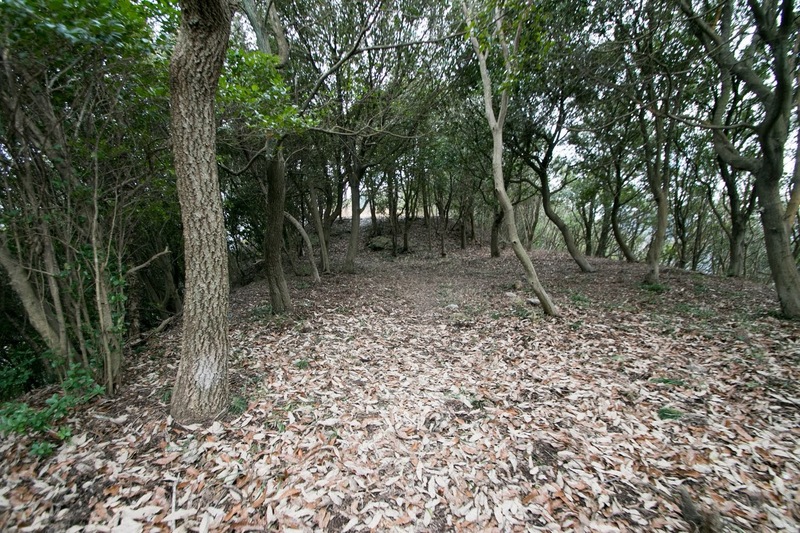 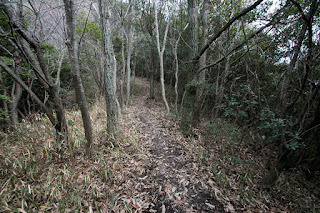 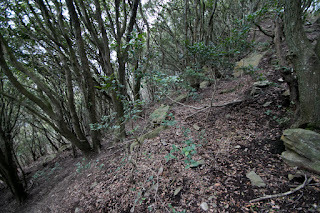 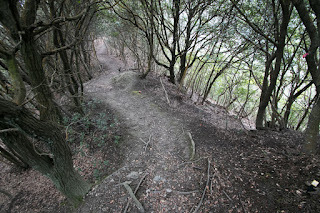 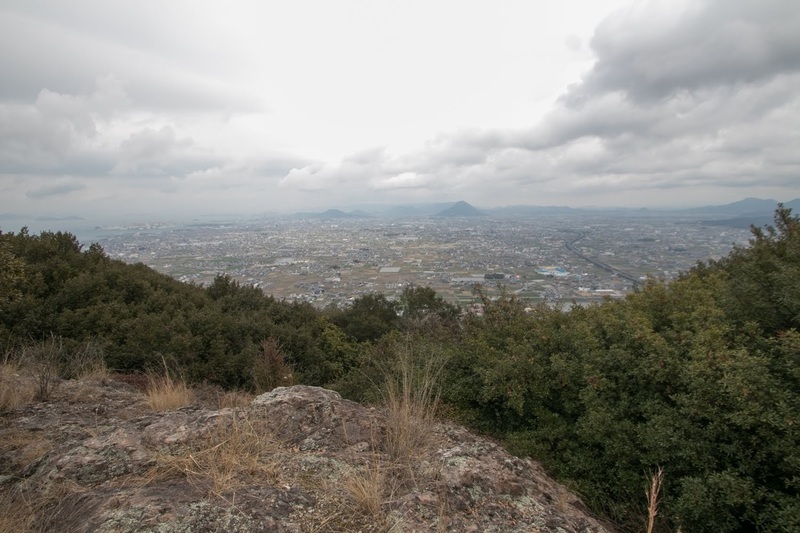 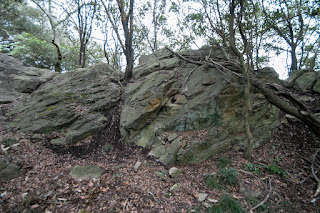 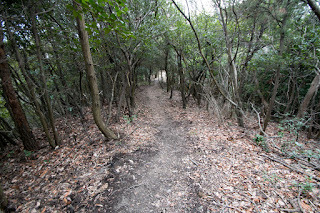 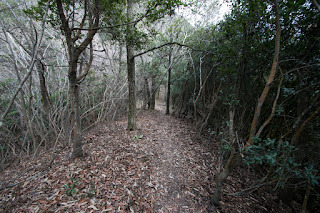 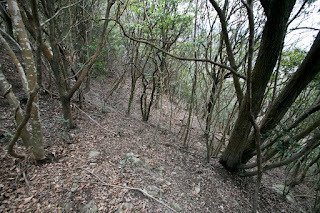 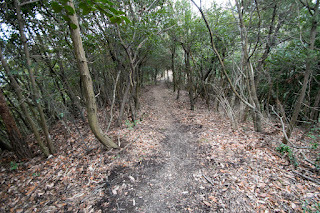 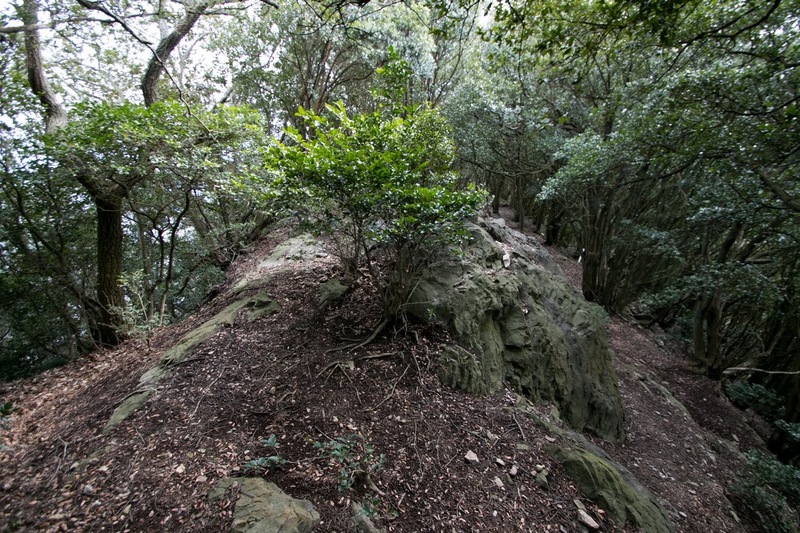 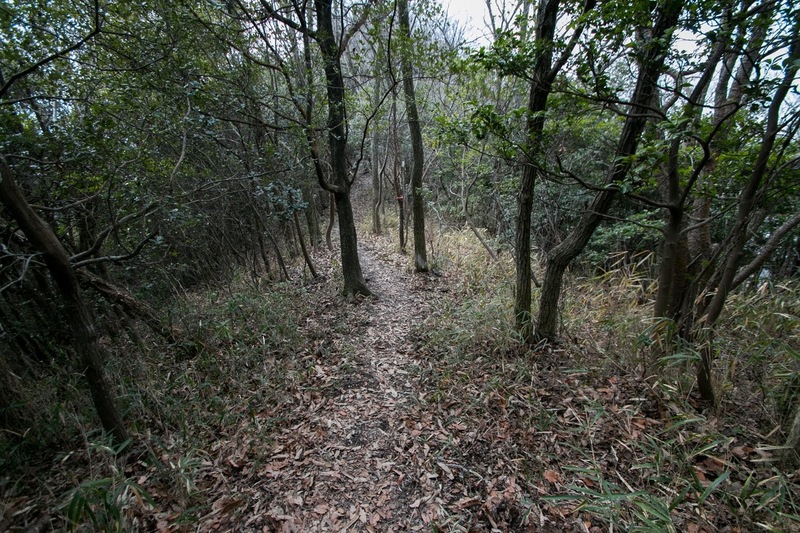 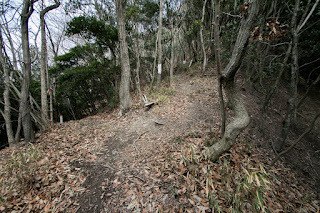 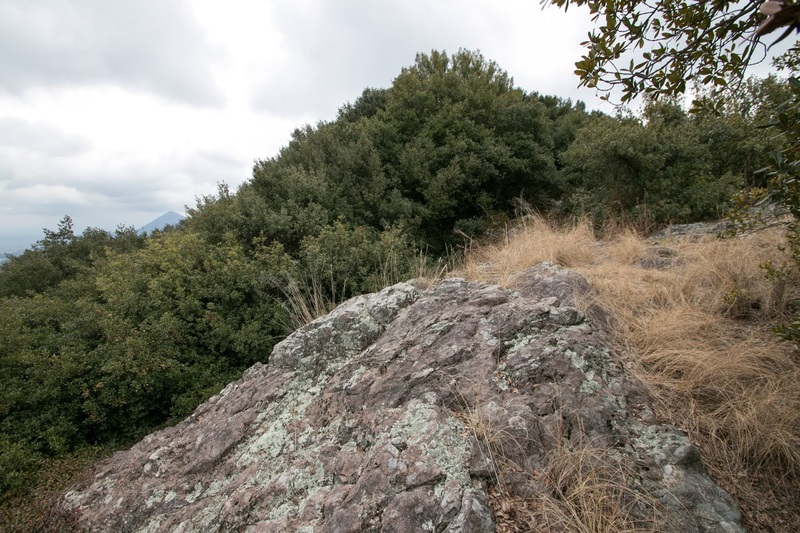 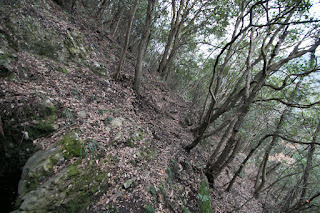 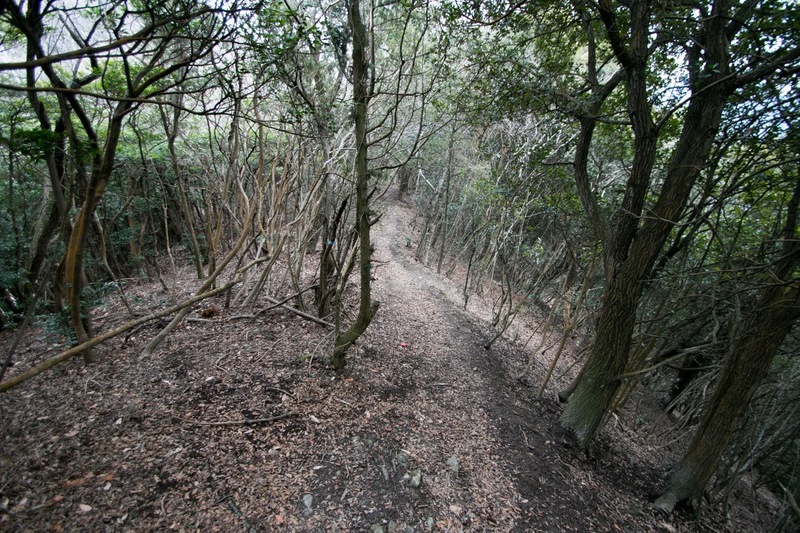 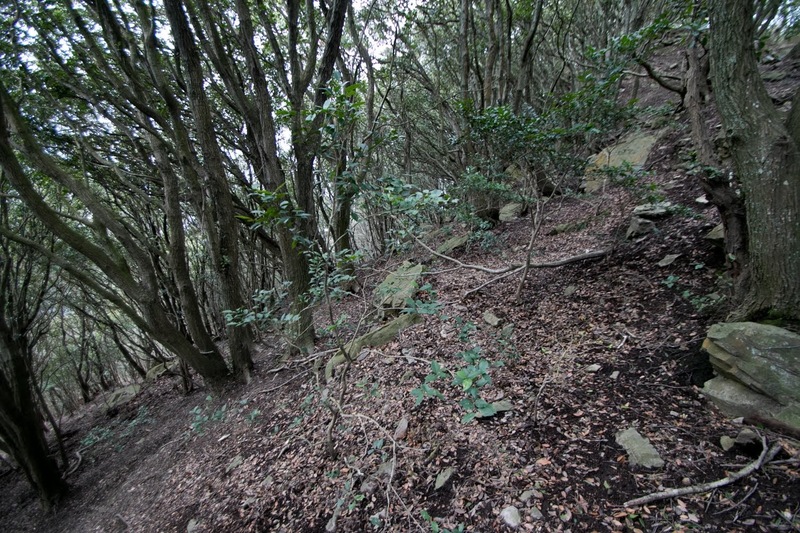 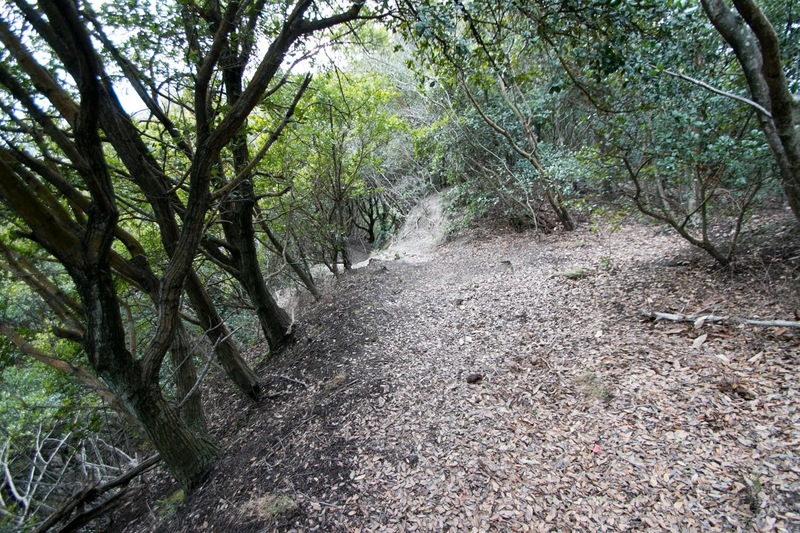 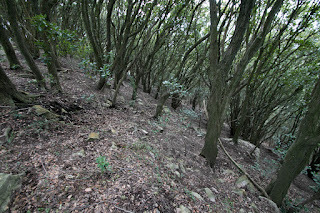 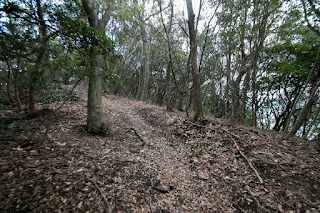 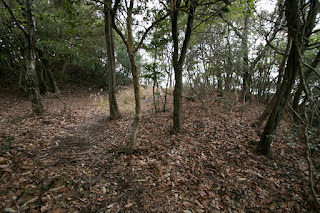 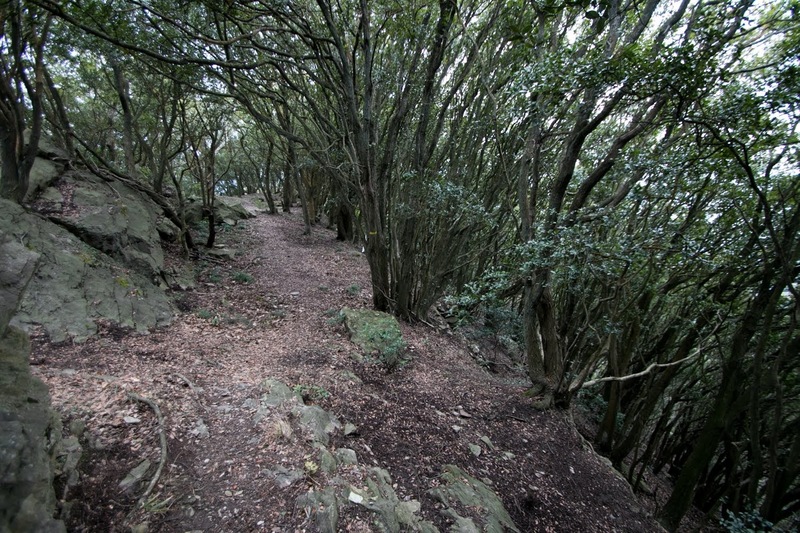 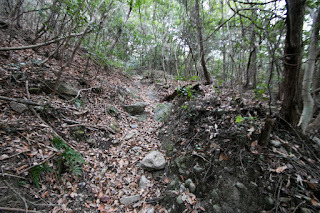 In addition to the geographical condition at the middle of Marugame and Kannonji area, now hided by trees but it prominent view from independent peak of the mountain over the province and Seto-Naikai sea is quite suitable for main base of western half of the province. 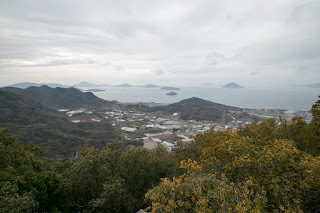 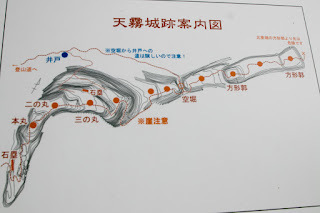 Moreover, it is close to Utazu area, where is an important port of Setonaikai sea also connected to Honshu main land through Shiaku islands. 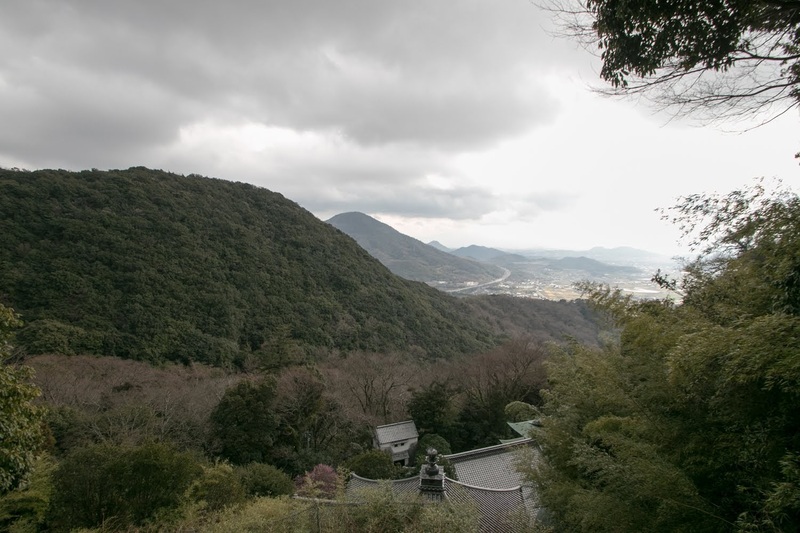 Amagiri-yama mountain is a twin mountain along with Iyadani-yama mountain has the same height peak as Amagiri-yama mountain. 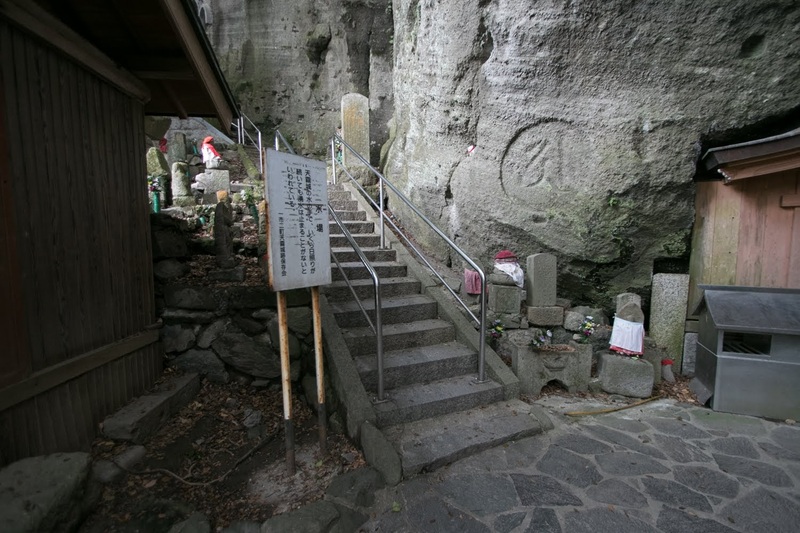 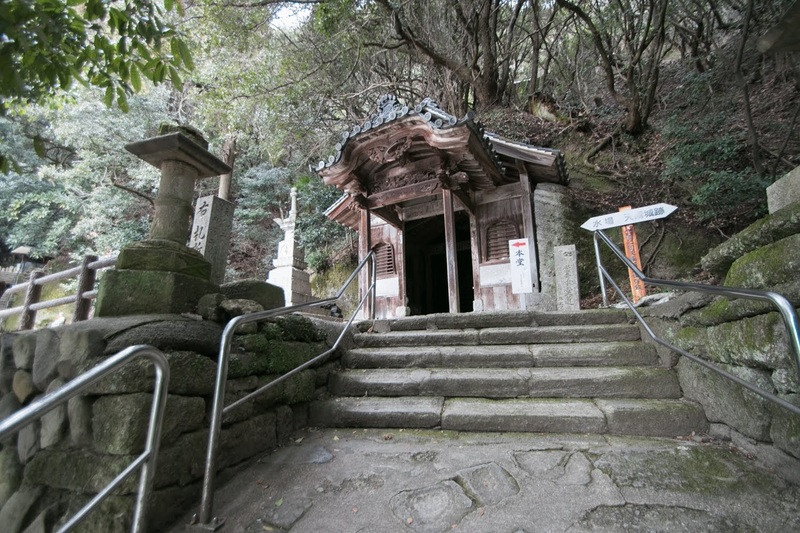 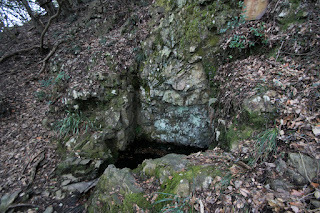 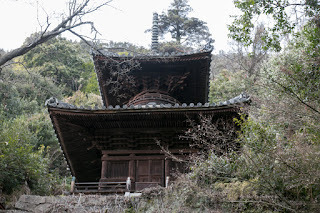 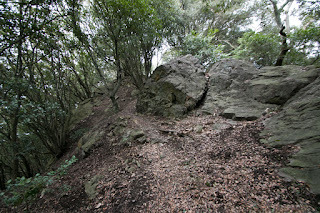 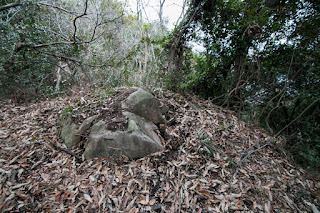 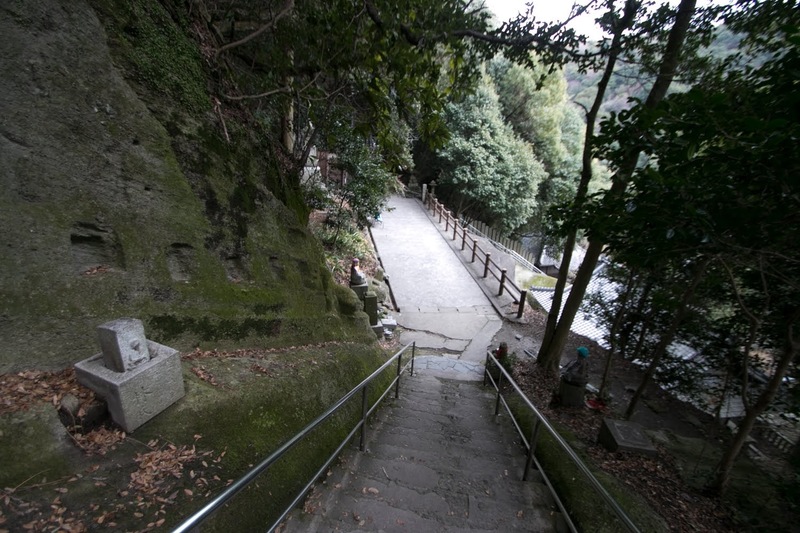 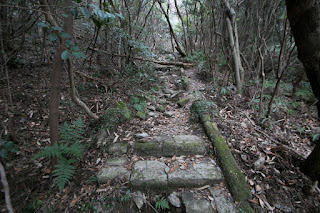 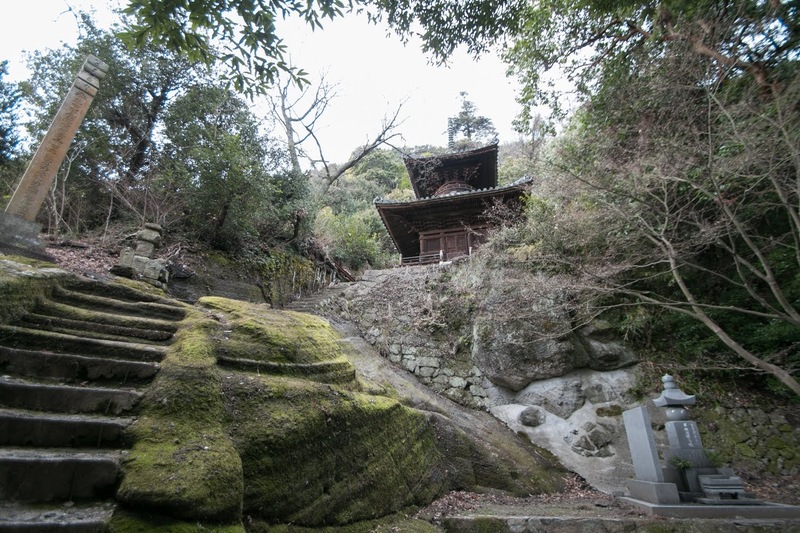 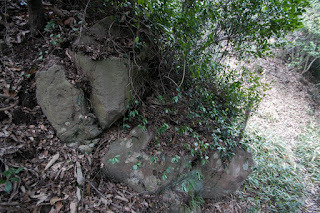 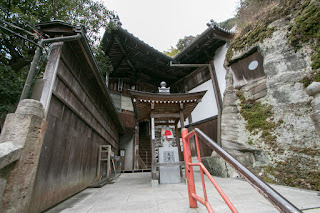 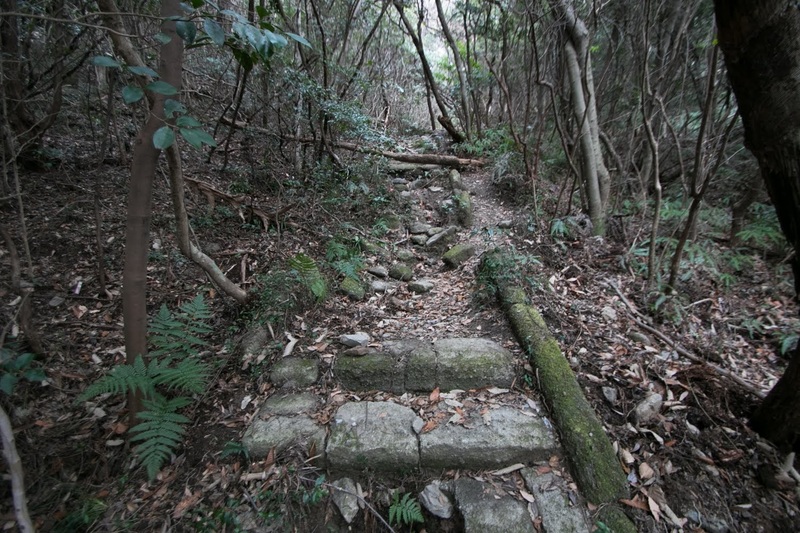 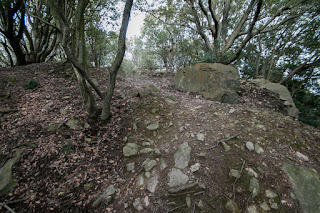 From ancient period Iyadani-yama mountain had been worshiped and used for religious practice, and it is said that Kukai (774-835), the founder of Shingonshu denomination of Japanese Buddhism and worshiped as Priest “Kobo-Daishi” and born at neighbor place, trained at this mountain. 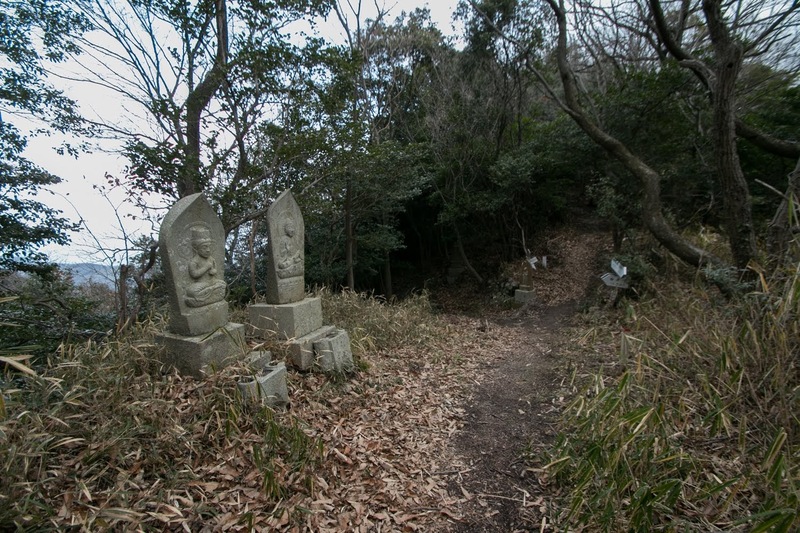 Kukai achieved various kind of knowledge through his study at China, and contributed not only in religious area, but also culture and study, Especially as Kukai as group contributed to irrigation or school to public people, later Kukai became widely worshiped by various kind of people, and mountains or temples where Kukai visited in his youth became regarded as holy place. 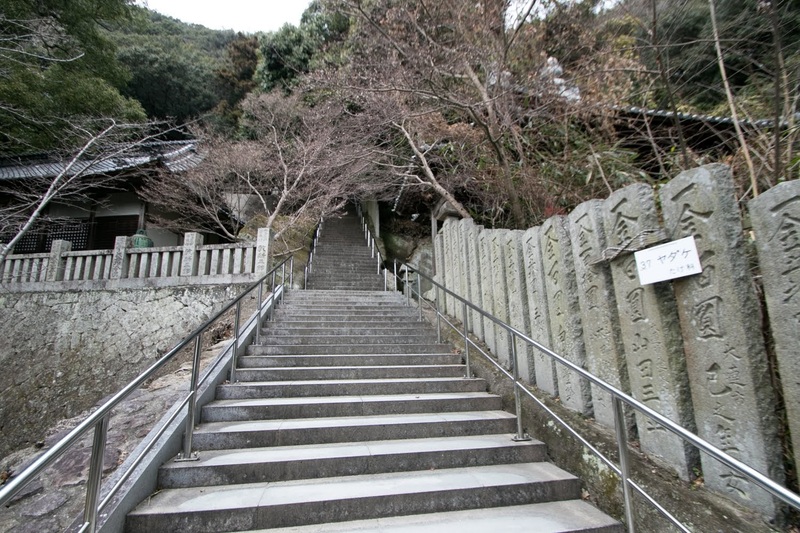 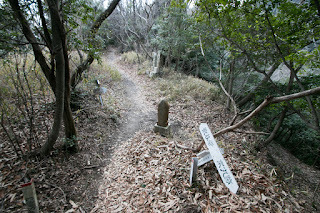 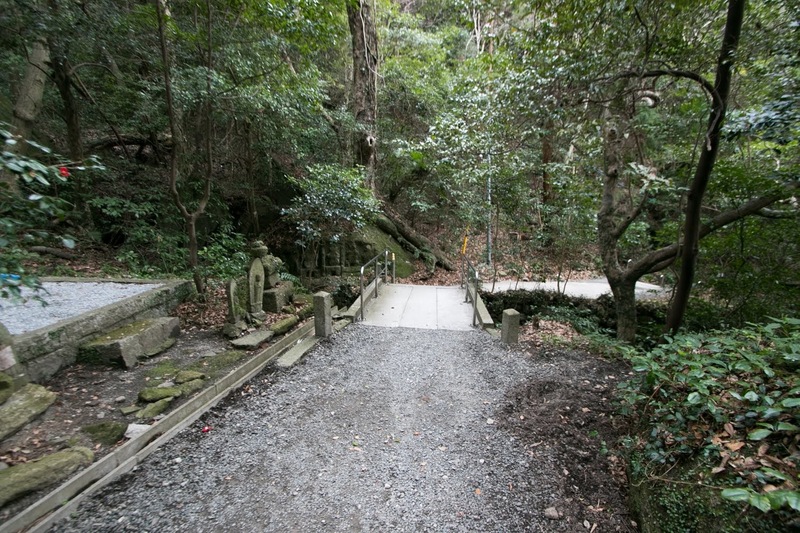 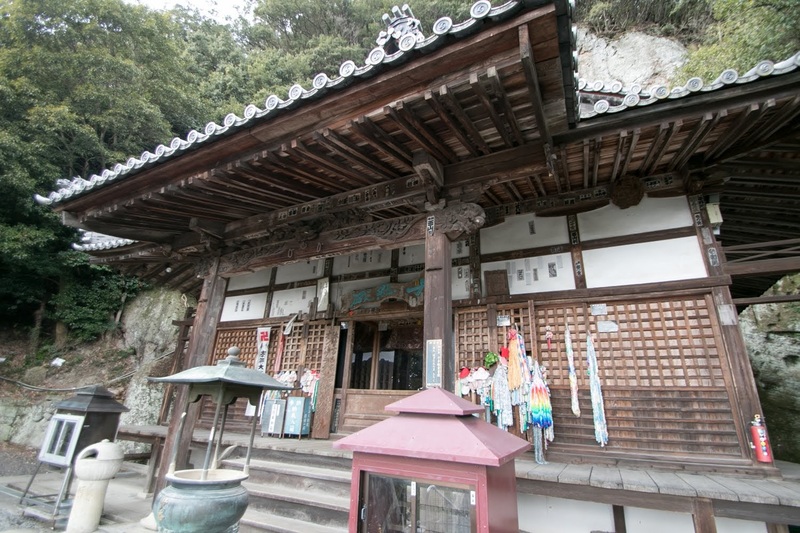 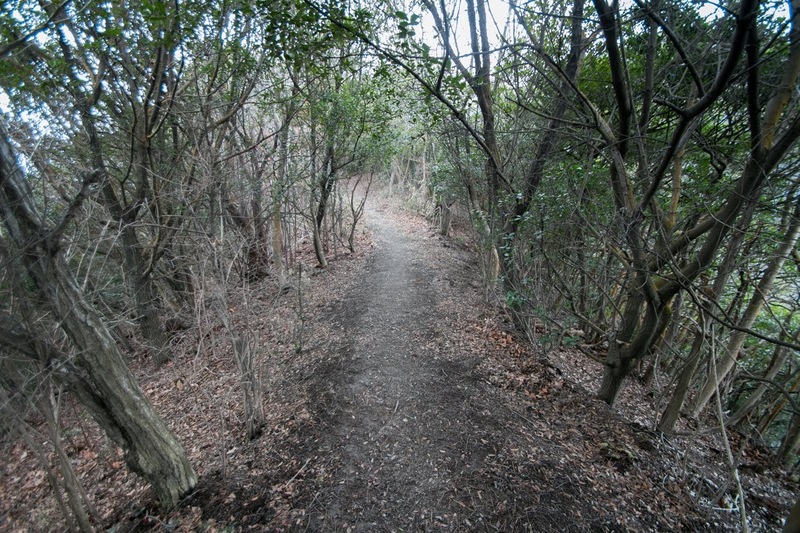 Later 88 places relate to Kukai and other religious area are gathered and established as a pilgrim road named as “Shikoku Hachijuhachi Kasho” (88 places of Shikoku 88 kasho). 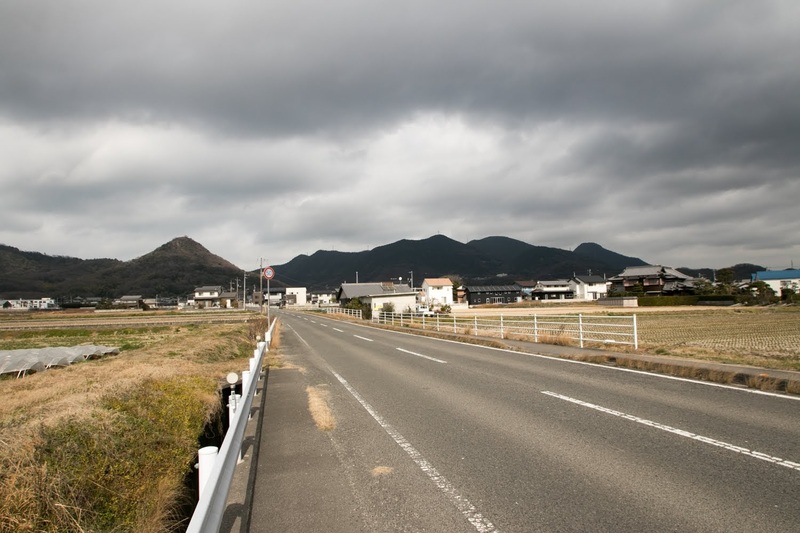 The total length of the road is over 1,000 kilometer, and it might take two months to complete at once by walk. 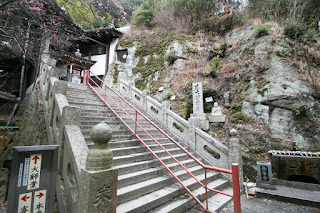 Because of its length and separation of Honshu main land as a real world, it became popular as a religious event of lifetime. 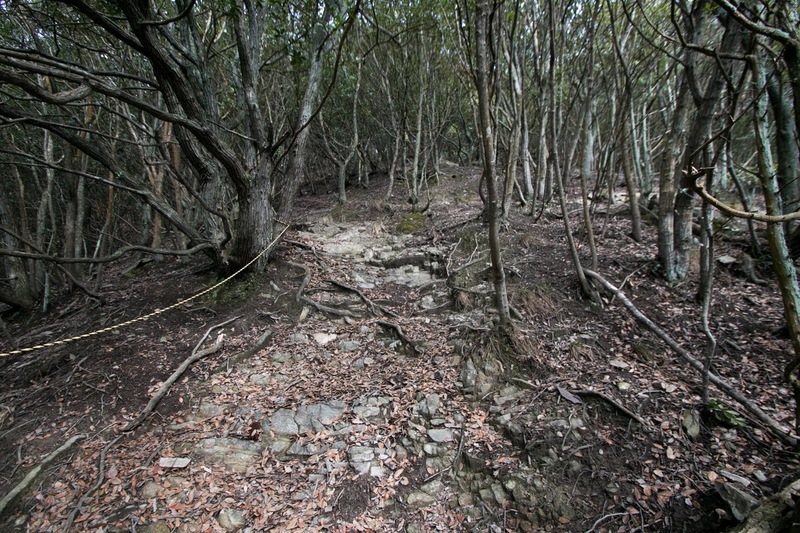 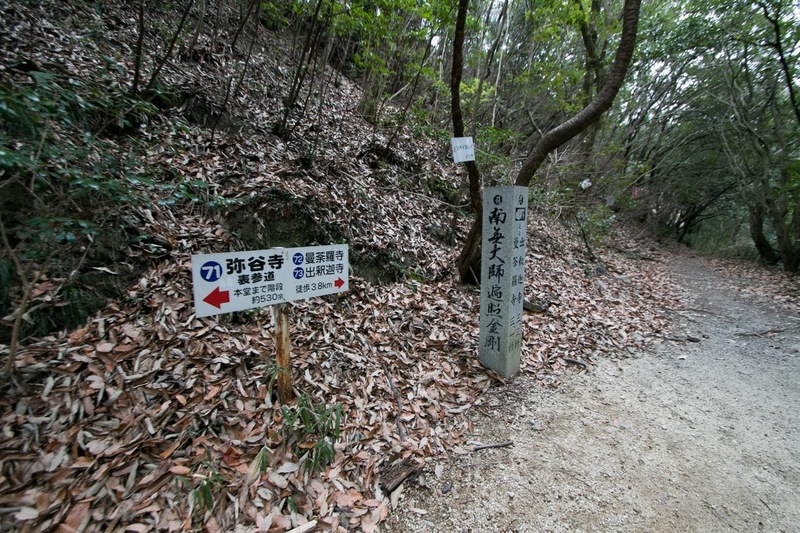 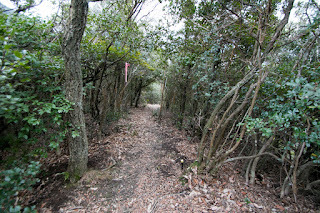 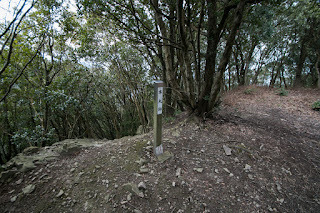 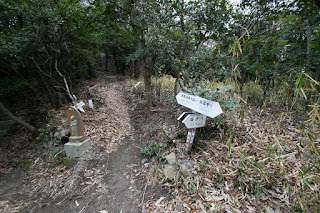 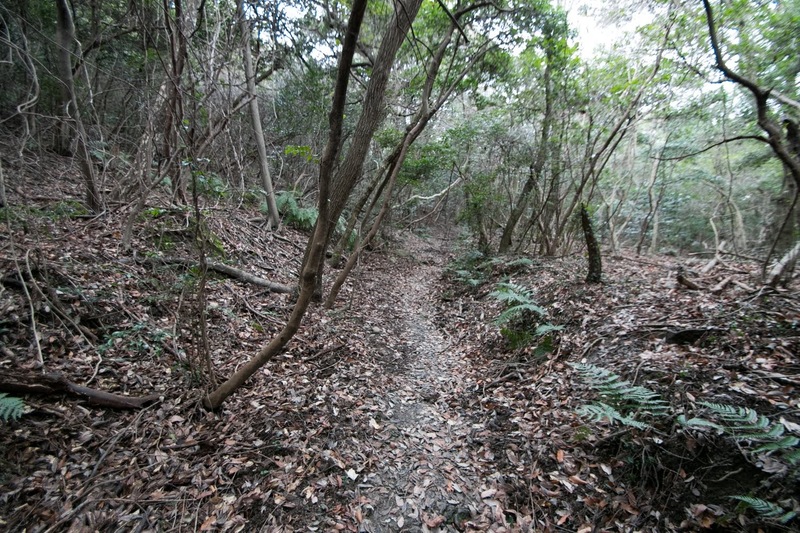 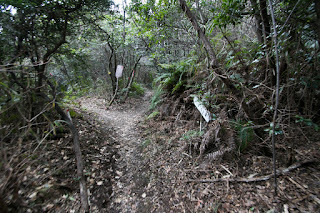 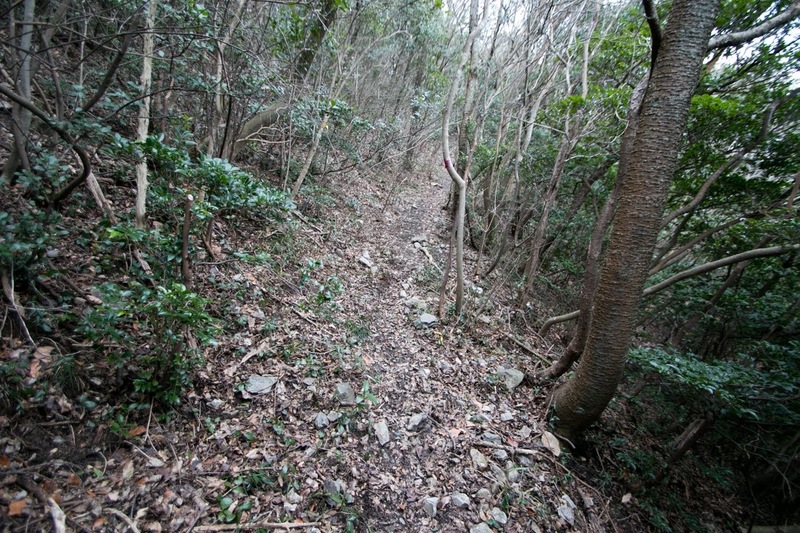 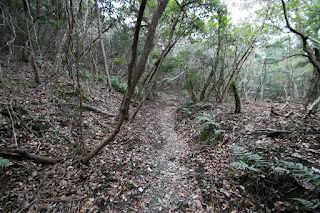 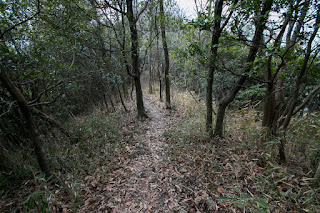 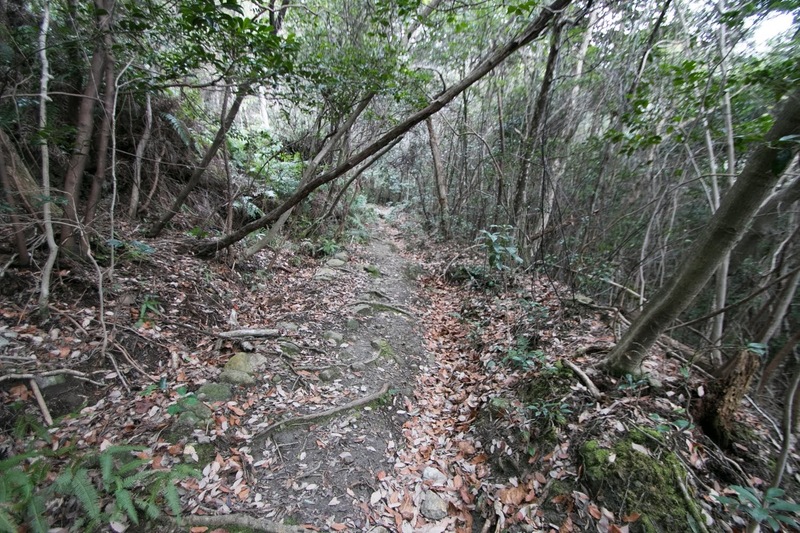 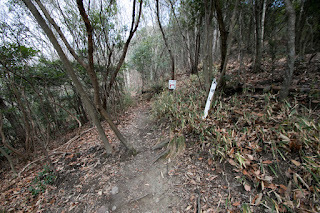 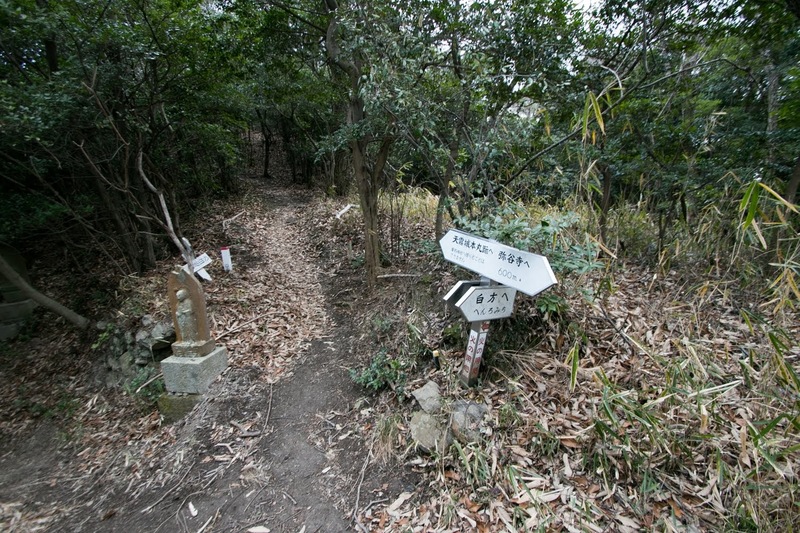 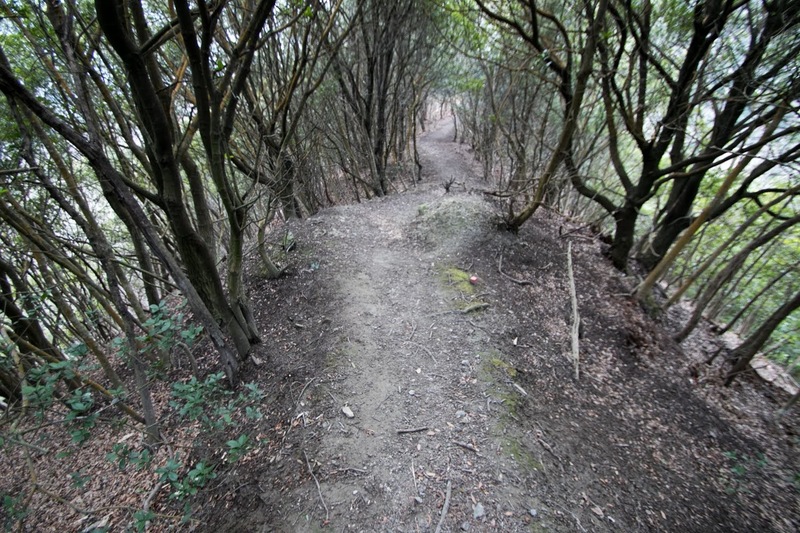 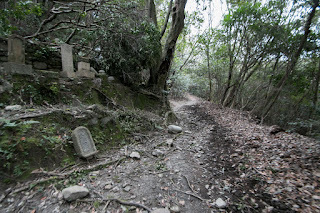 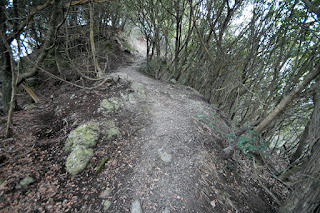 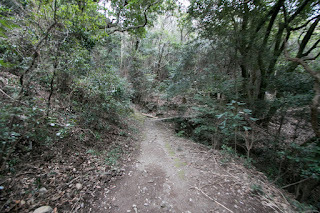 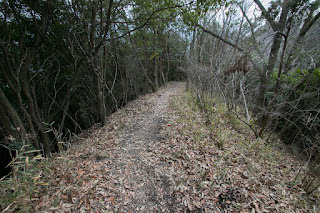 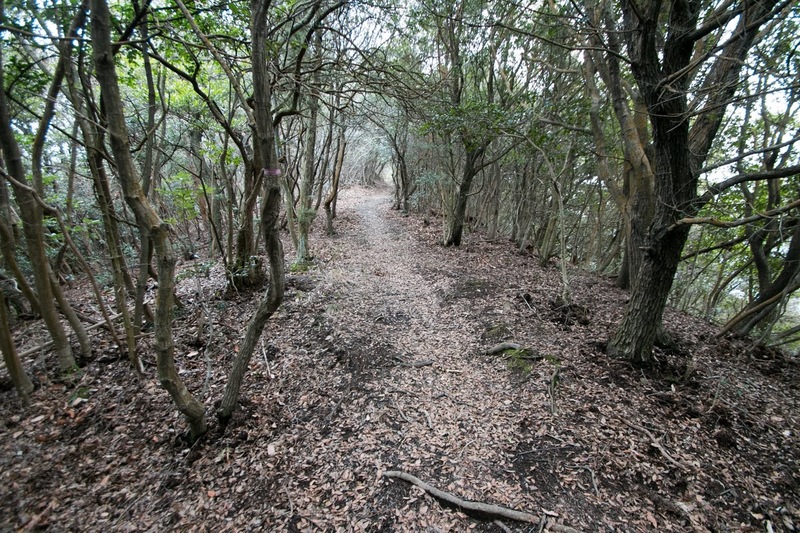 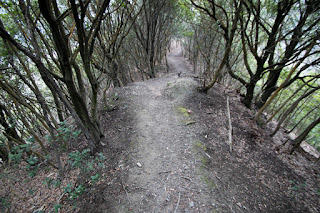 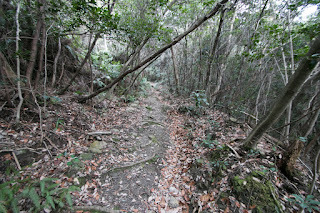 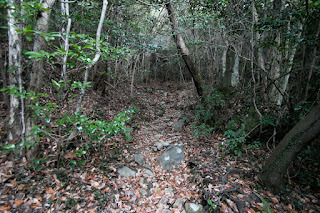 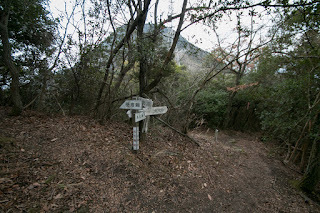 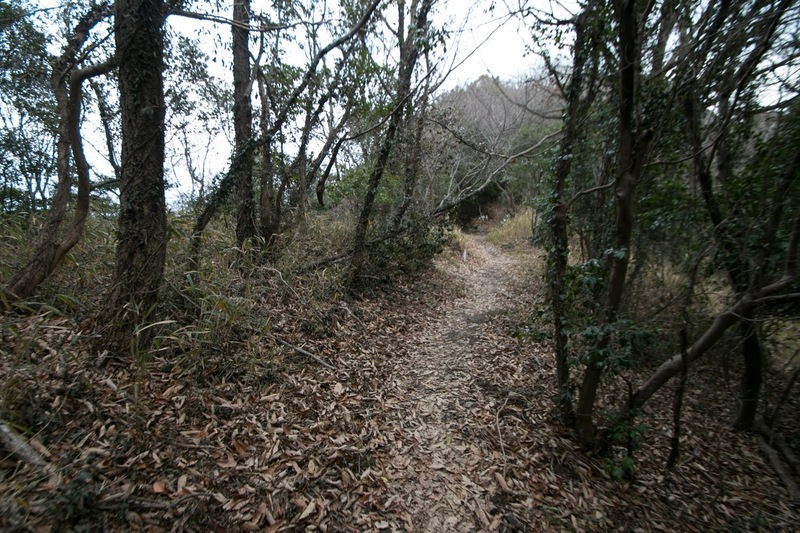 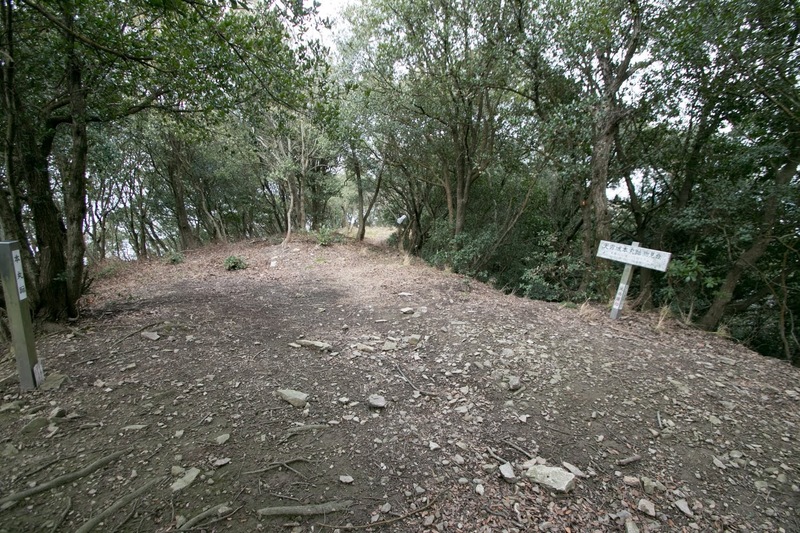 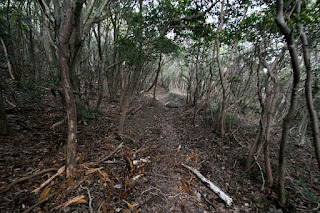 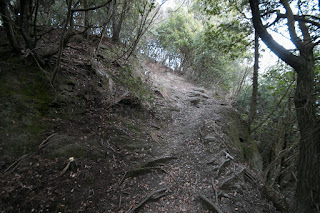 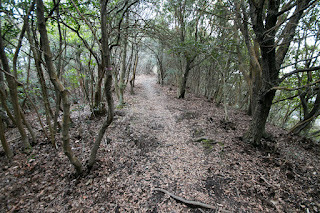 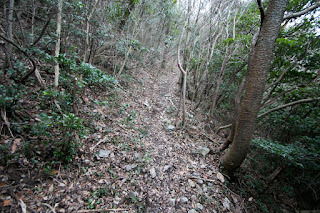 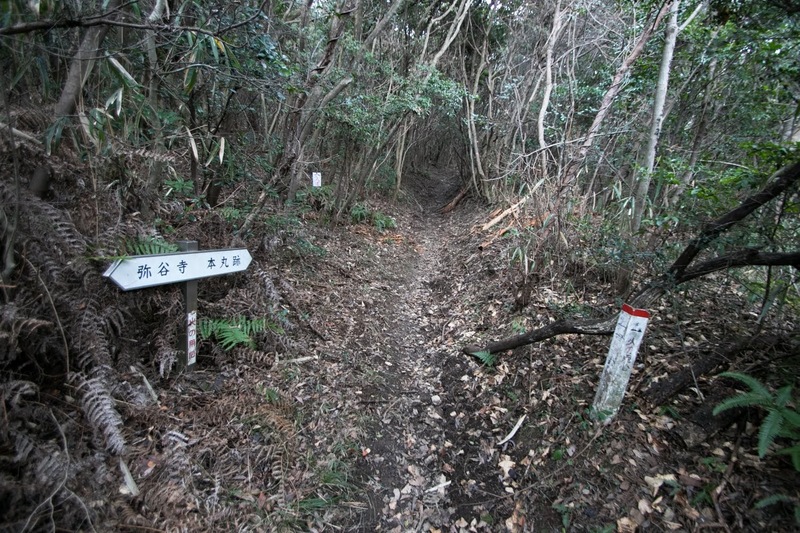 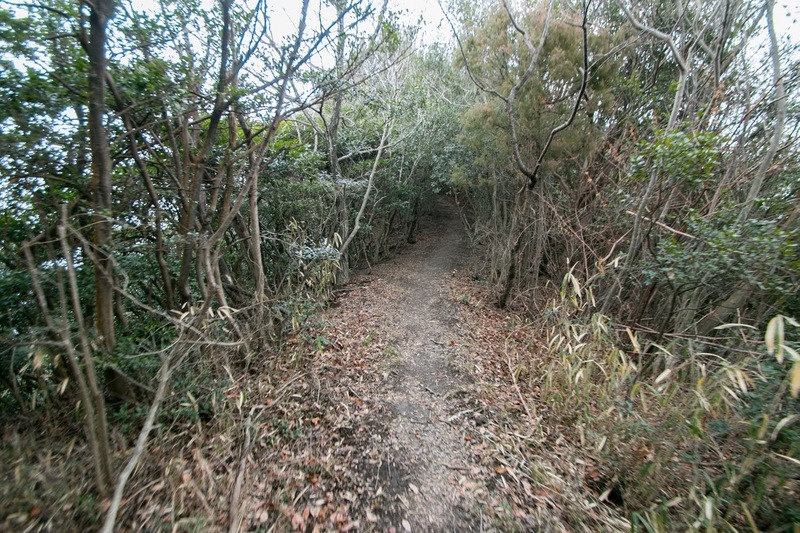 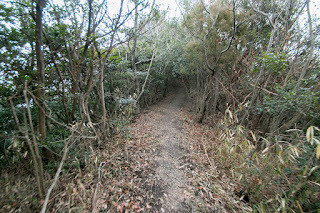 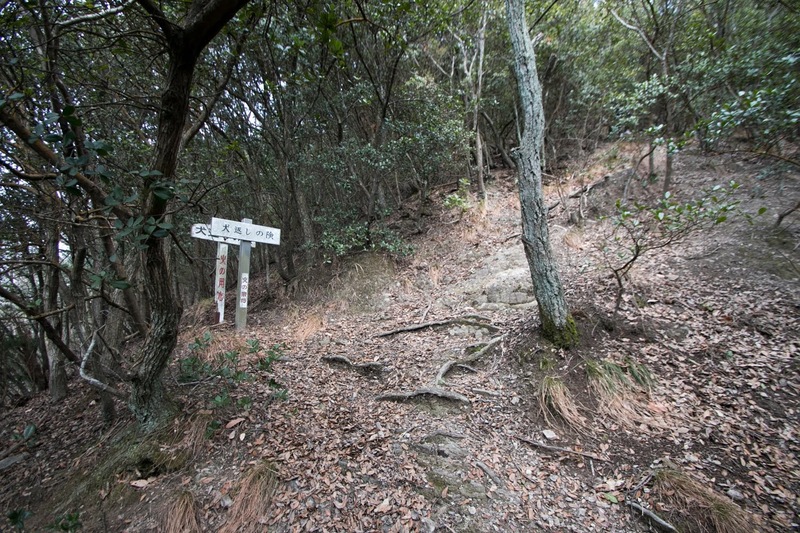 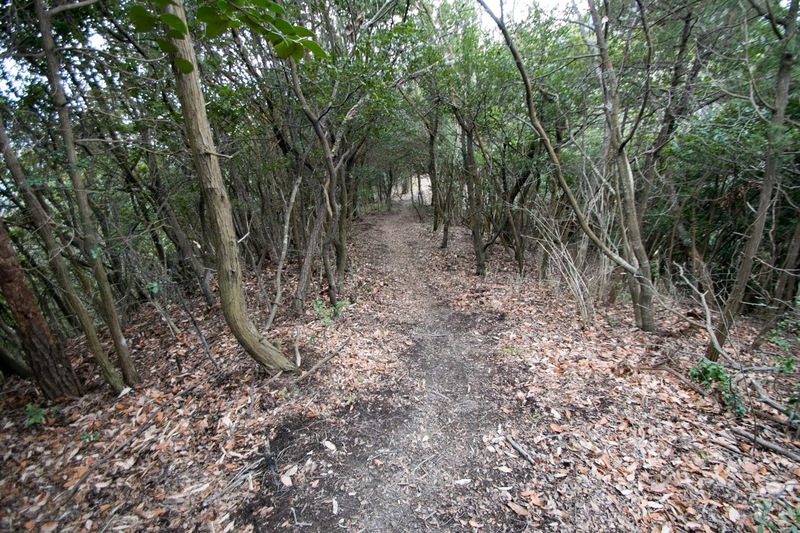 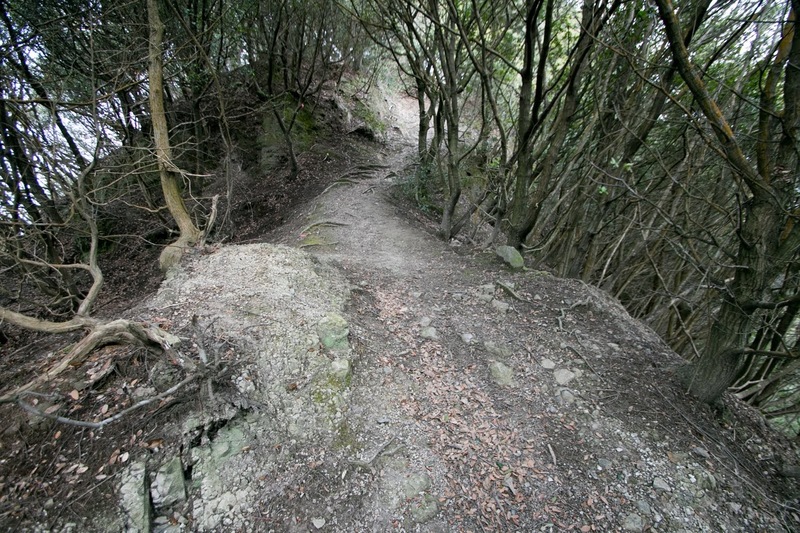 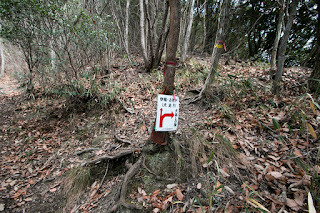 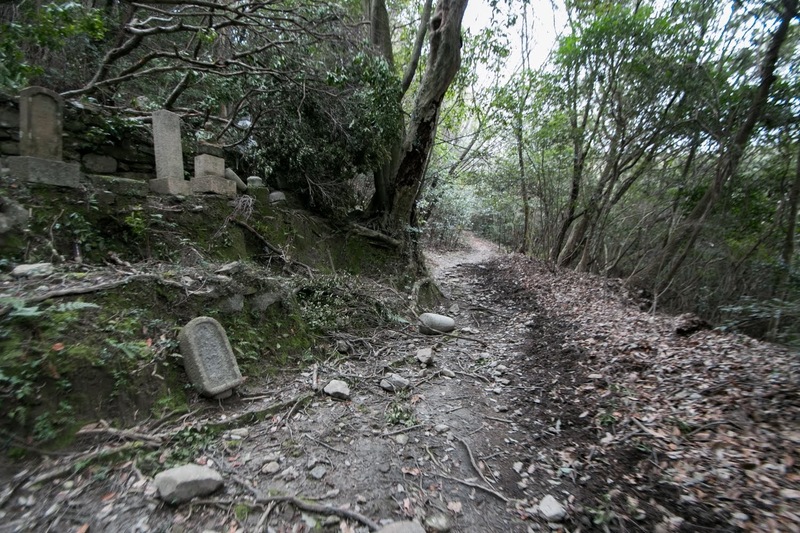 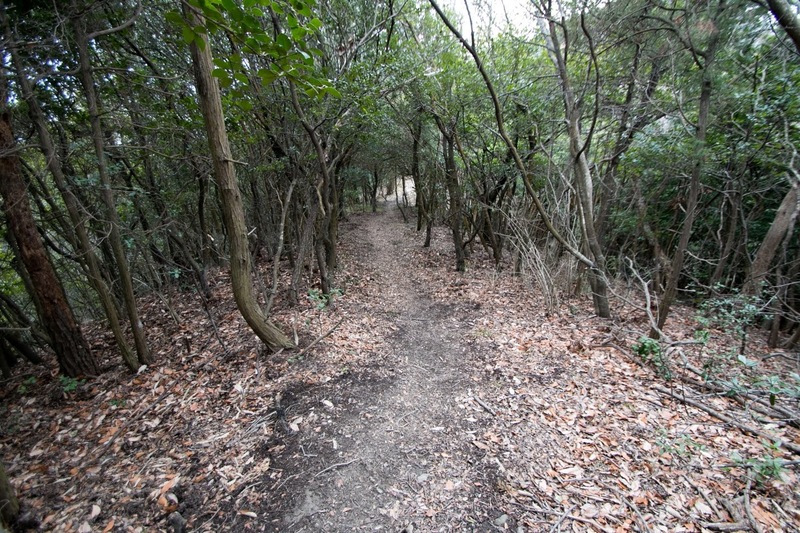 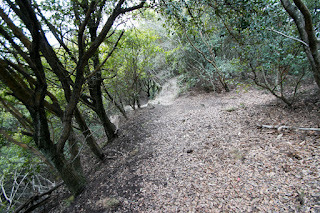 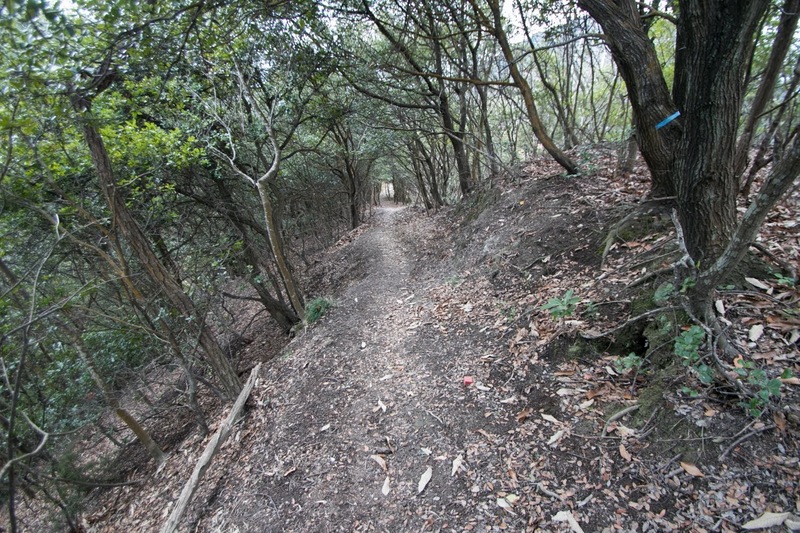 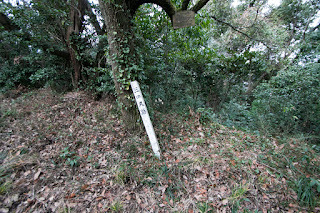 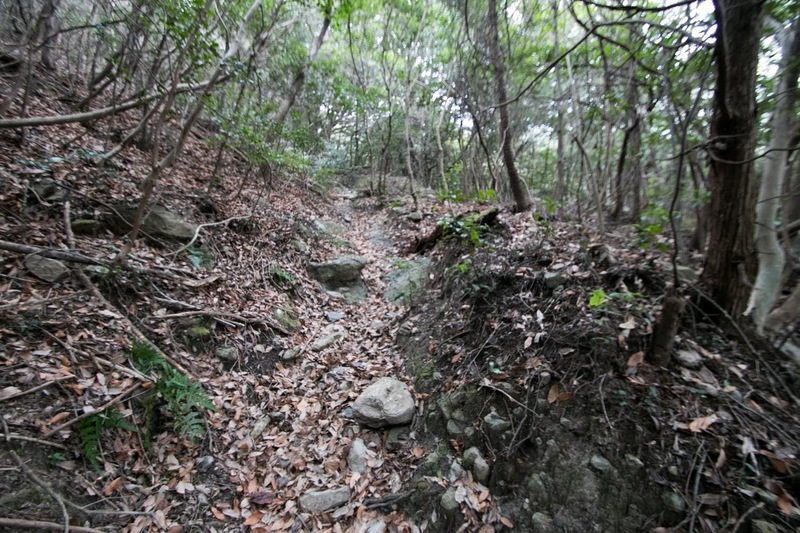 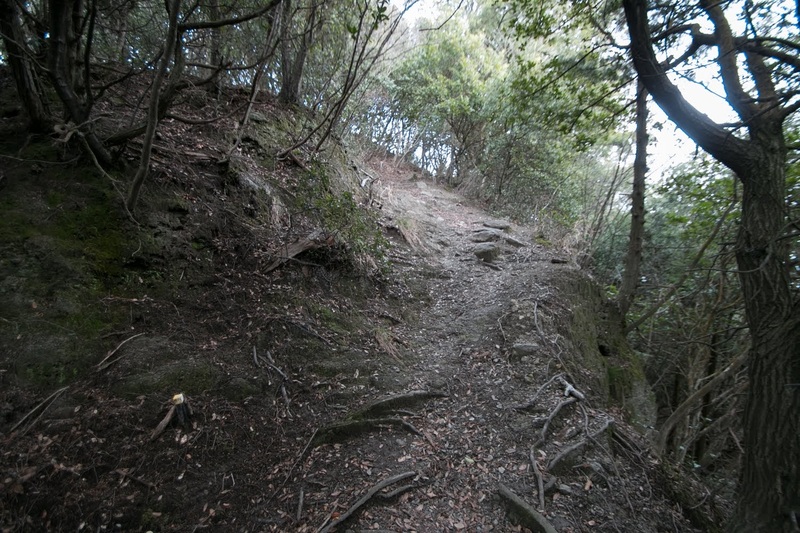 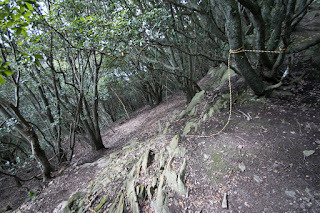 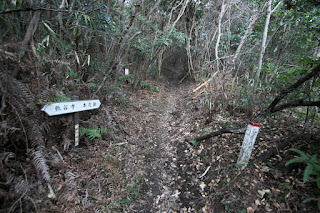 Different from the one of Western world that straightly line trip, this pilgrim road is a round trip start from Naruto area, the east edge of Shikoku island. Normally pilgrims round clockwise from Awa province (Tokushima prefecture), Tosa province (Kochi prefecture), Iyo province (Ehime prefecture) and Sanuki province (Kagawa prefecture) to the starting point. These four provinces correspond to the development of story, it mean beginning, training, enlightment, and peaceful. 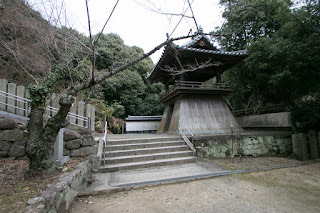 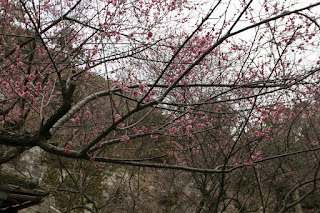 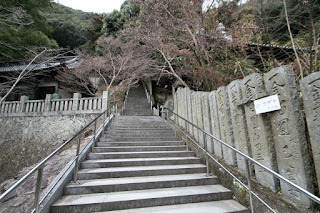 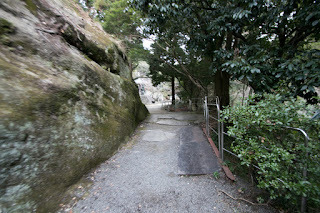 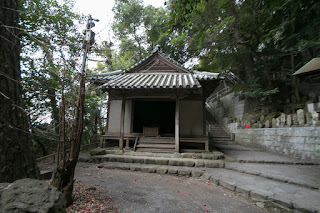 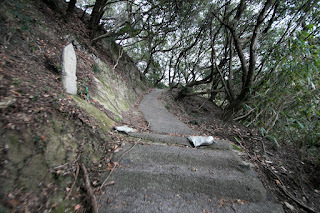 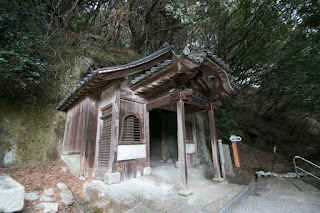 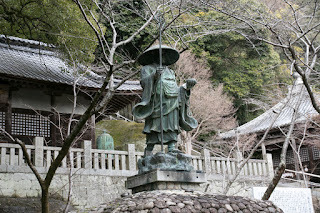 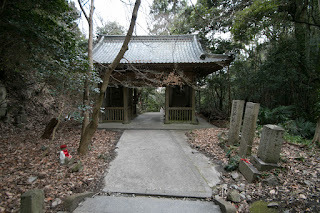 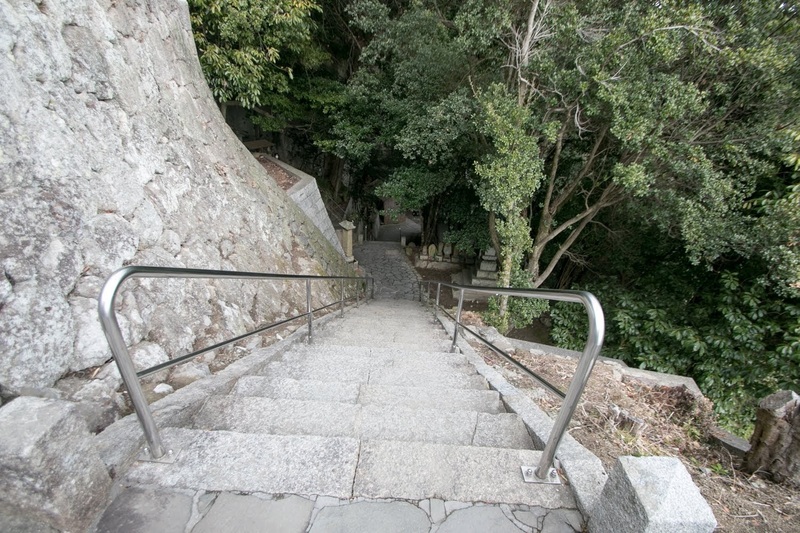 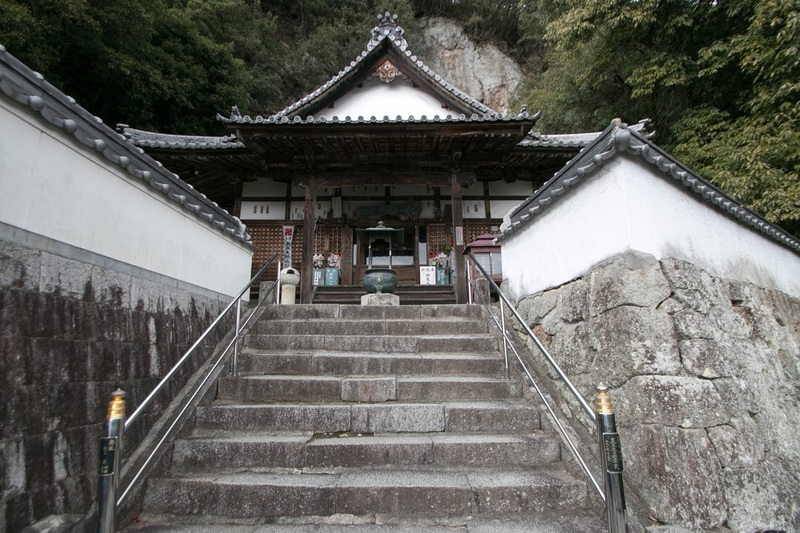 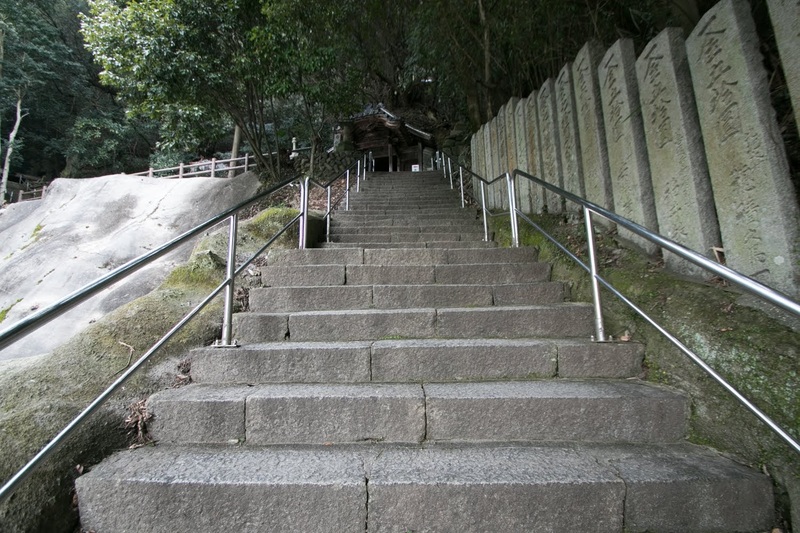 Iyadani-dera just below of Amagiri castle is 71st of 88 temples, and entrance of final stage of the pilgrim. 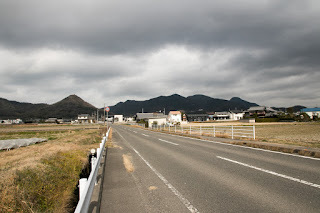 Pilgrims returns from mountainous area to coastal prosperous area might remind his trip and imagine upcoming life with renewed mind. 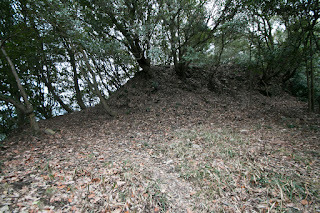 Precise year is unknown but Amagiri castle might be built by local lord Kagawa clan in 15th century. 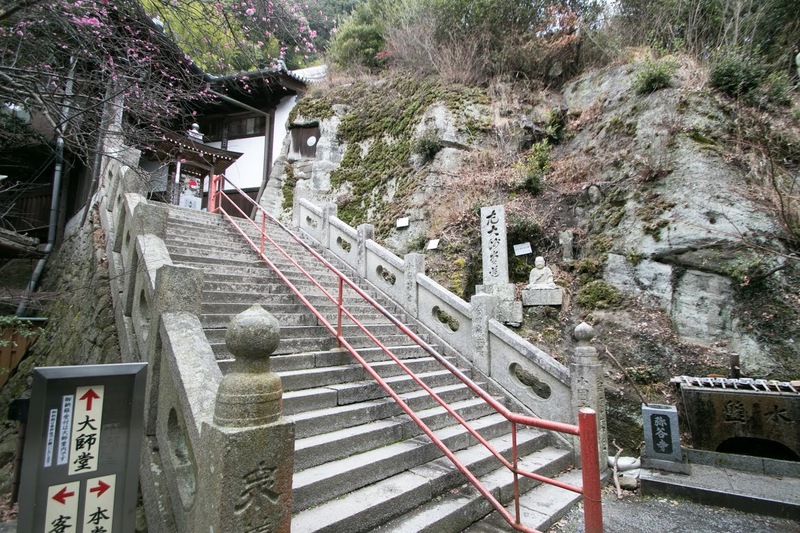 Kagawa clan was originally a descendant of Taira clan and located at the inner part of Sagami province (Kanagawa prefecture). 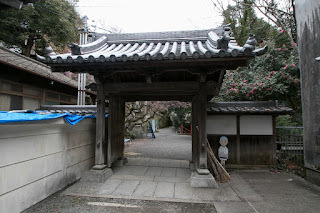 The process is not clear but later Kagawa clan served to Hosokawa clan, a manor branch family of Ashikaga clan which later became the founder of Muromachi Shogunate. 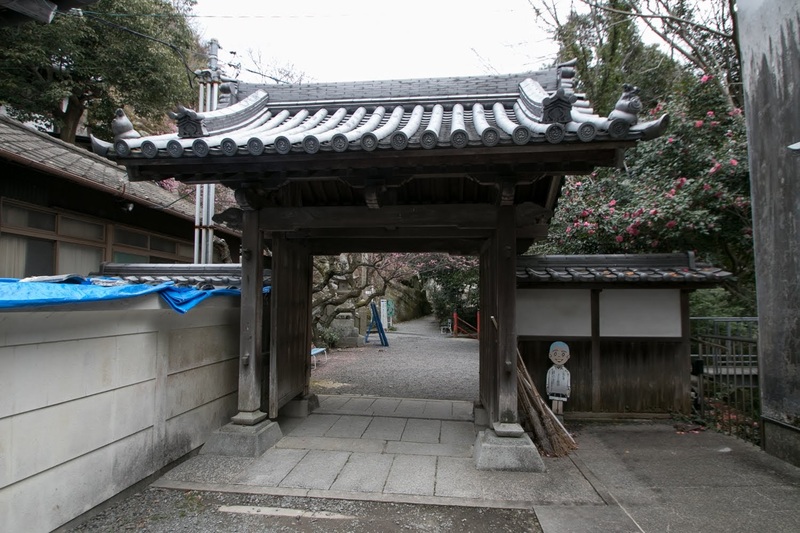 At the establishment of Muromachi Shogunate in 14th century, Hosokawa clan became its first class retainer because of the closeness of blood and contributions at battles. 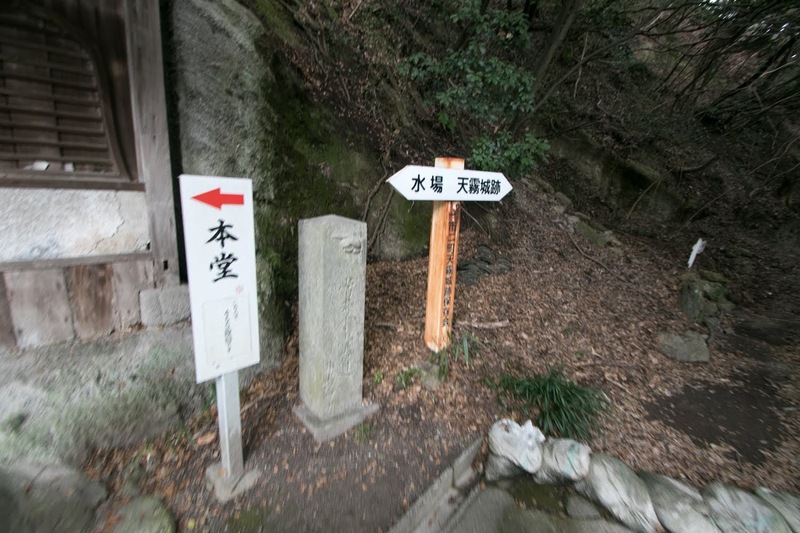 Muromachi Shogunate sent Hosokawa clan to Sanuki province where the South Court army hostile to Shogunate managed, and retainers of Hosokawa clan including Kagawa clan accompanied this campaign. 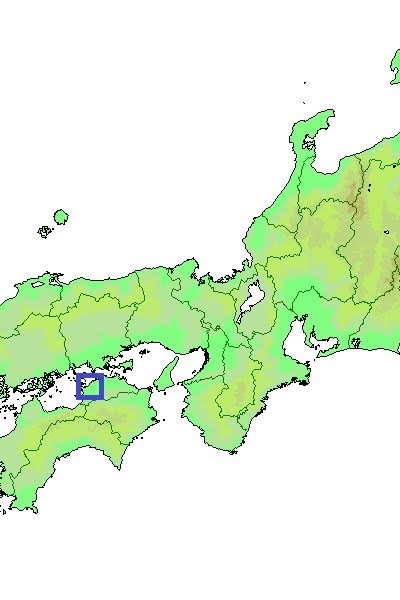 Responding to the expectation of Shogunate, Hosokawa clan could grasp Sanuki province and governed it as their major territory. To reign the province, Hosokawa clan place four major retainers around the province, it mean Yasutomi clan at Ametaki castle, Kozai clan at Katsuga castle, Nara clan at Shotsuji castle and Kagawa clan at Ametaki castle. 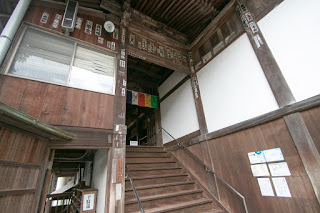 Among them, Yasutomi clan and Kagawa clan served deputy governor of east and west half of the province. 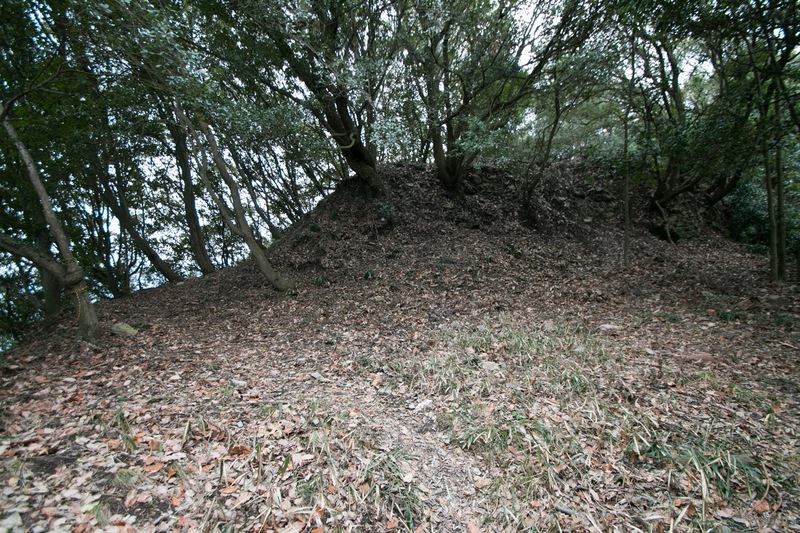 In the latter half of 15th century, Hosokawa clan kicked out its rival Yamana clan at 10 year long battle of Onin, and local lords of Sanuki province including Kagawa clan activated in this battle. 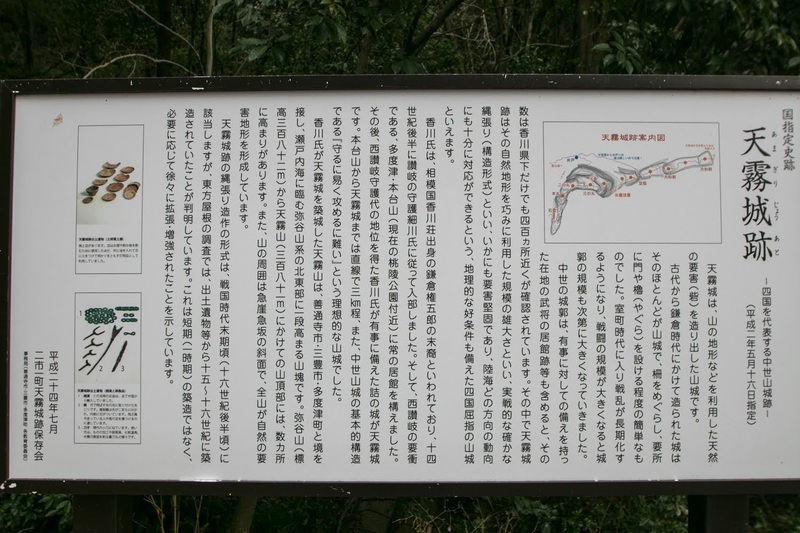 After the cease of the battle, Hosokawa clan seized the authority of Muromachi Shogunate and became its peak period. However, at the beginning of 16th century, Hosokawa clan significantly lost its power by continuous internal conflict, and Miyoshi clan which was originally a retainer of branch family of Hosokawa clan gradually rose losing leaders in the battles. In the middle of 16th century, Hosokawa army suffered severe defeat before Nagayoshi Miyoshi (1522-1564), and Hosokawa government collapsed at this time. 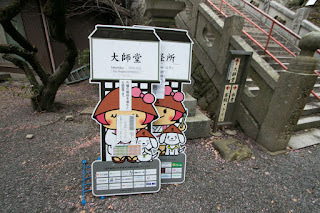 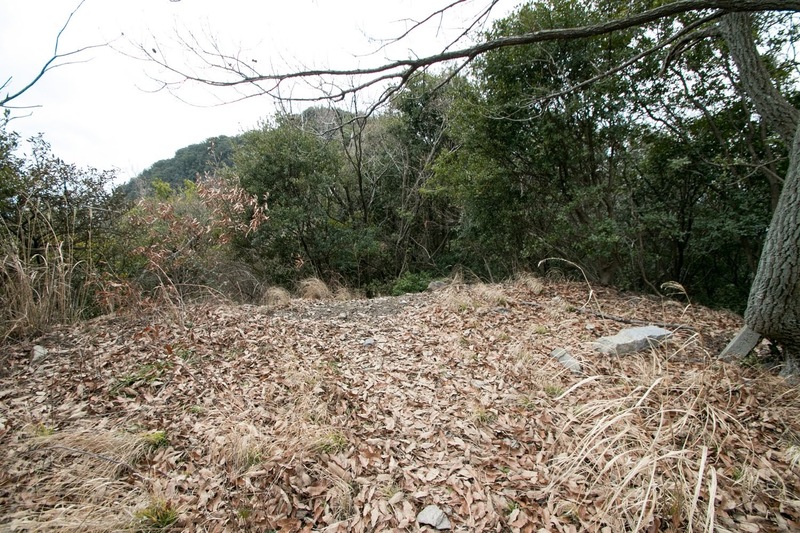 Looking at the collapse of Hosokawa clan, Sanuki province suddenly fell into confusion. 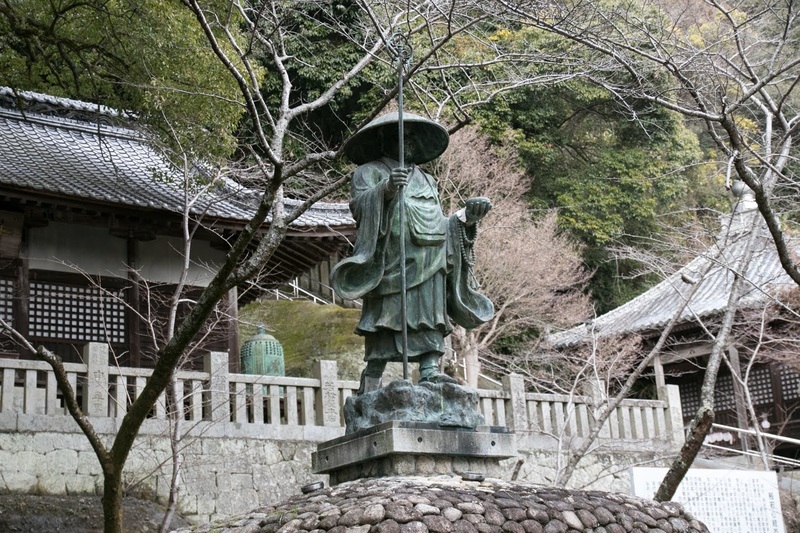 Local lord of east half such as Yasutomi clan or Kozai clan belonged to Miyoshi clan as they were close to the core area of Awa province, the main territory of Miyoshi clan. 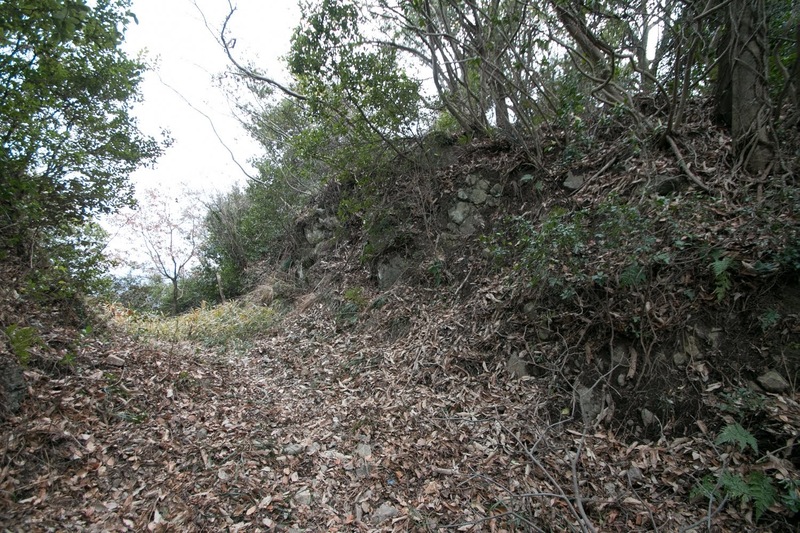 On the other hand, Kagawa clan distant from Miyoshi clan tried to become an independent warlord. 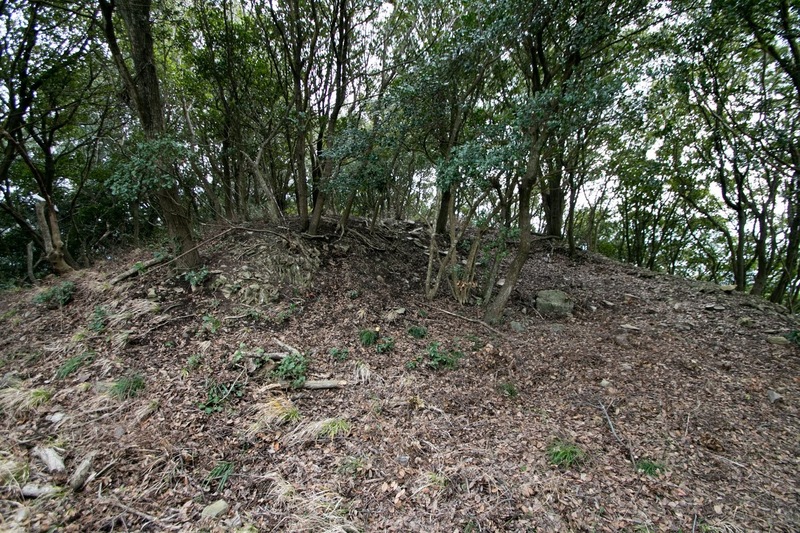 Kagawa clan at first suppressed Nara clan and captured certain part of them. Looking at the rise of Kagawa clan, Miyoshi clan sent Jikkyu Miyoshi (1527-1562), a talented younger brother of Nagayoshi Miyoshi and who reigned Awa province. 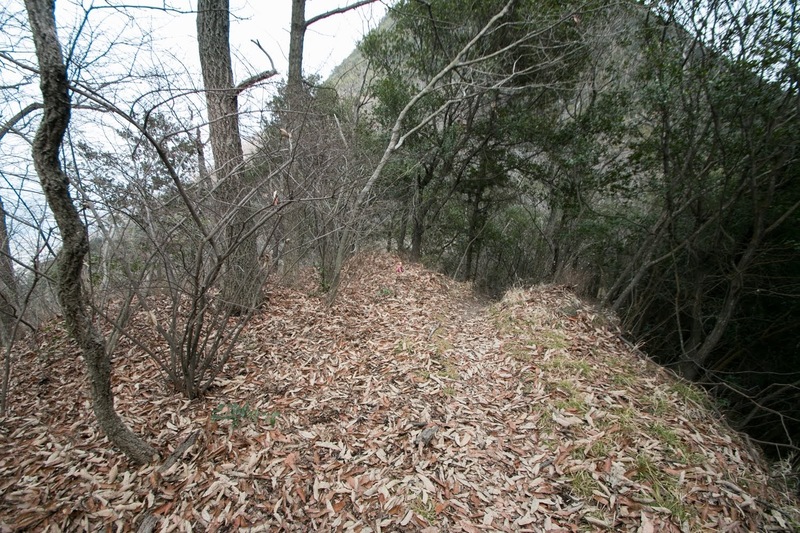 Kagawa clan well resisted against Jikkyu at Amagiri castle, and finally coordinated with Miyoshi army. 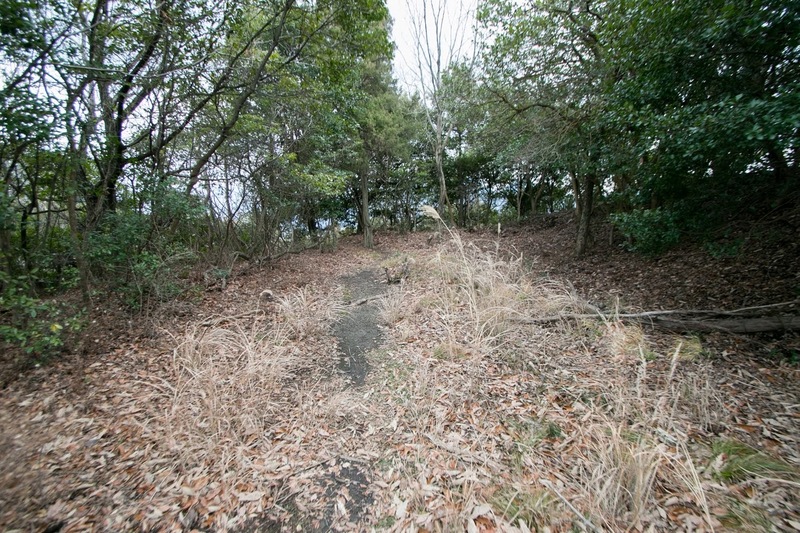 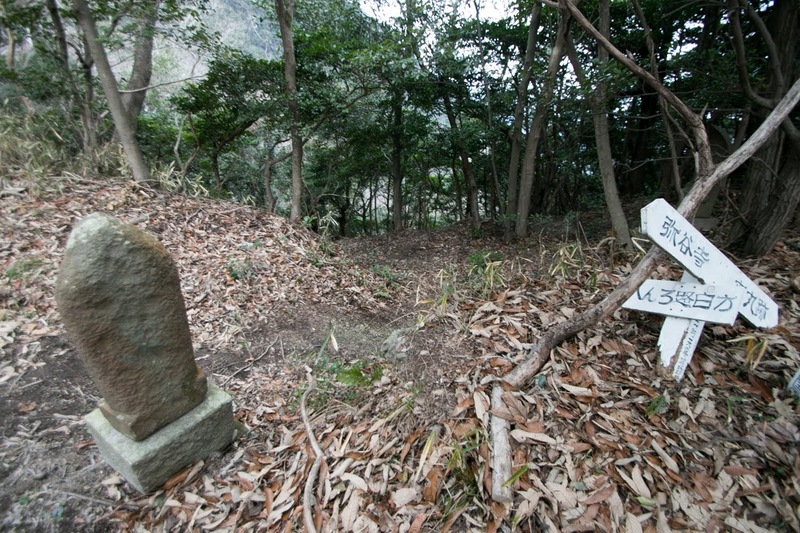 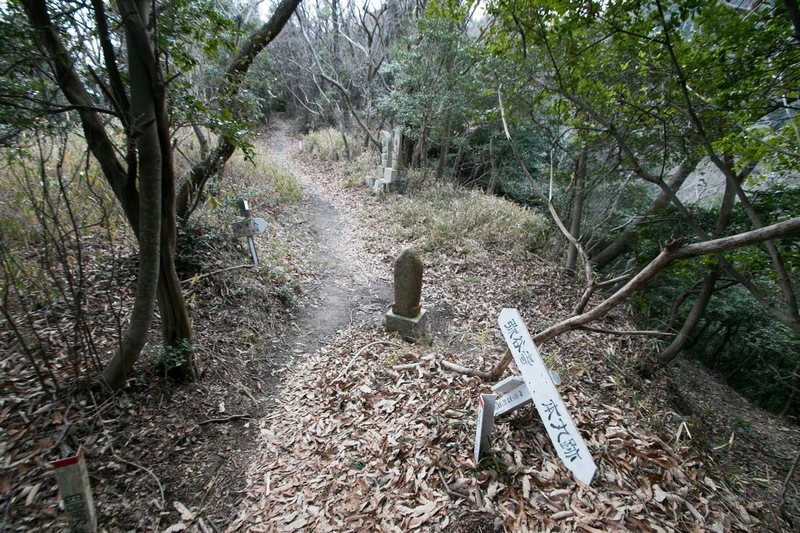 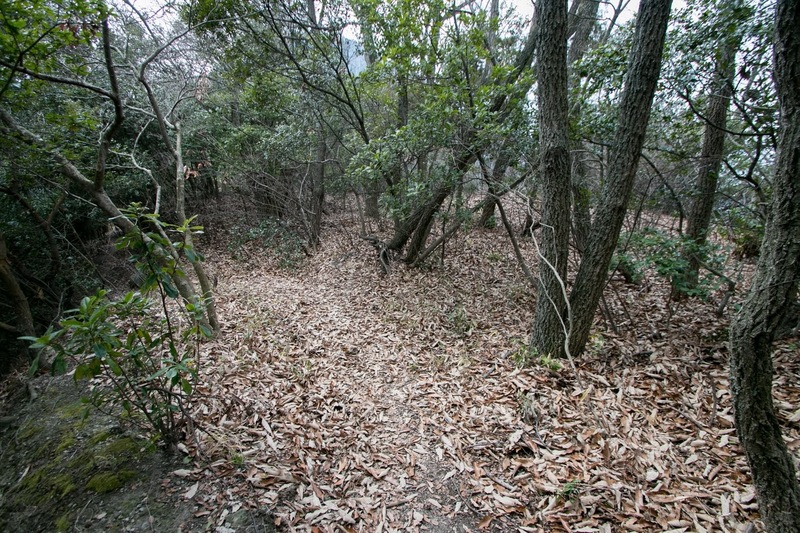 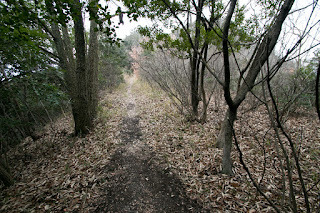 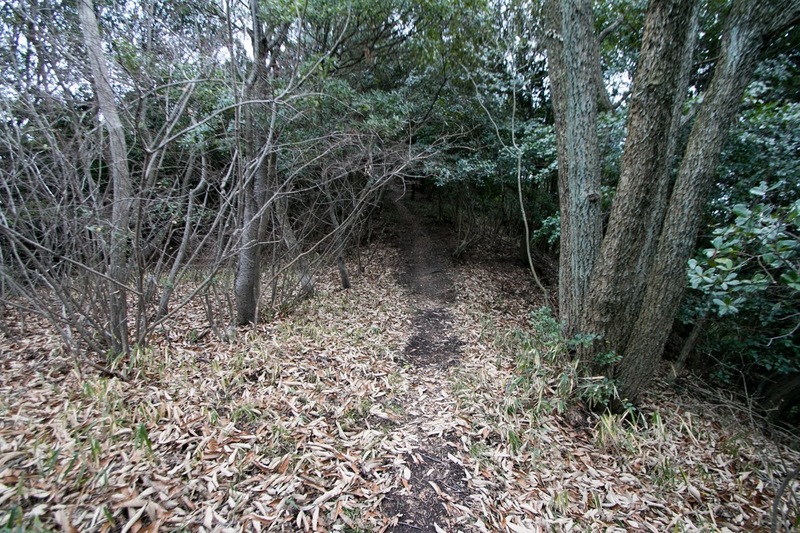 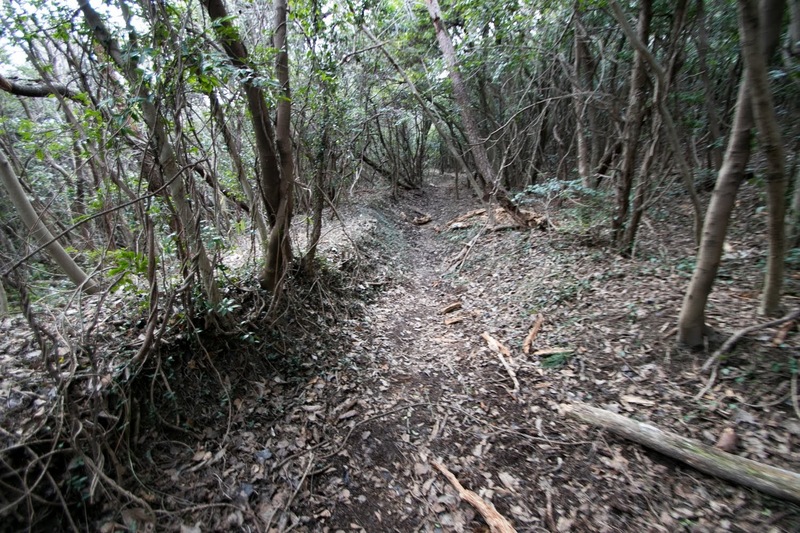 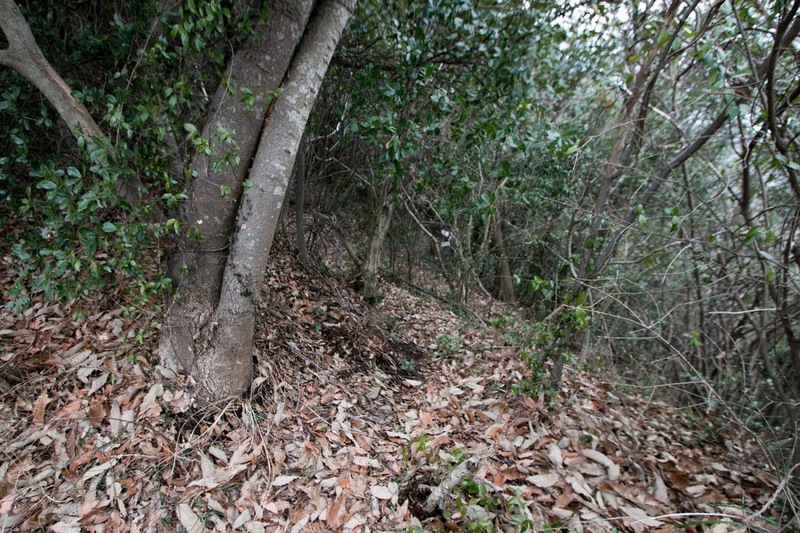 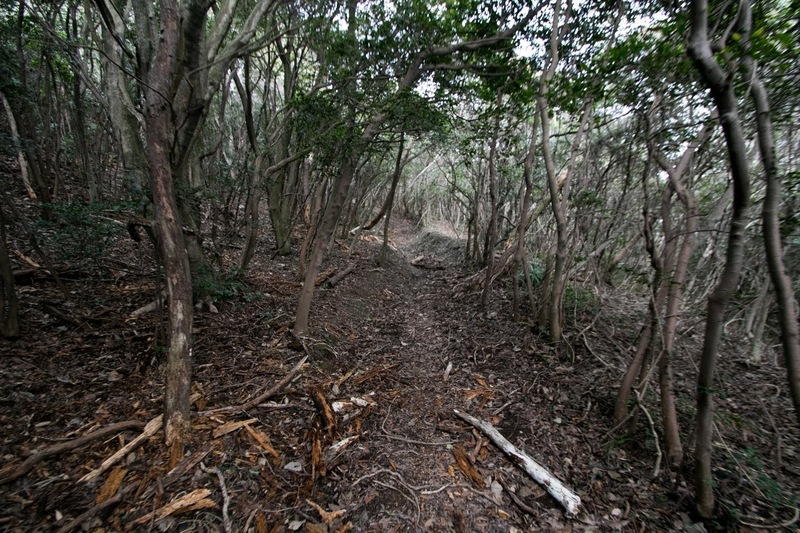 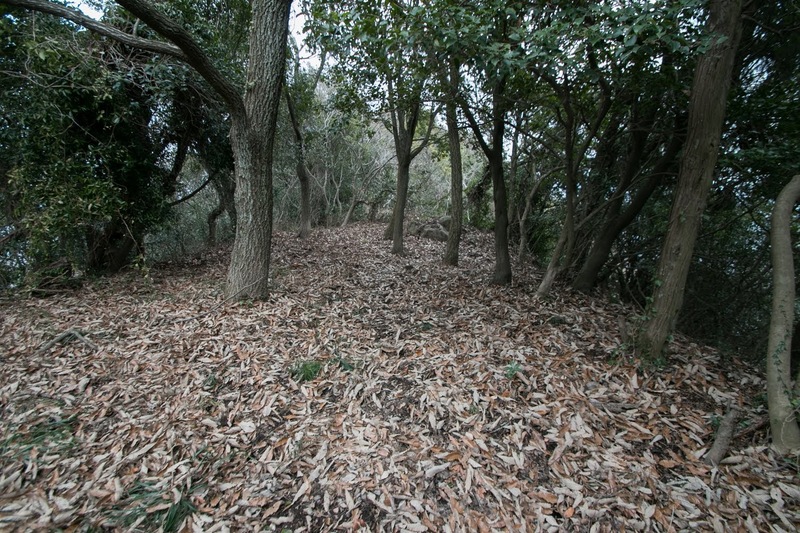 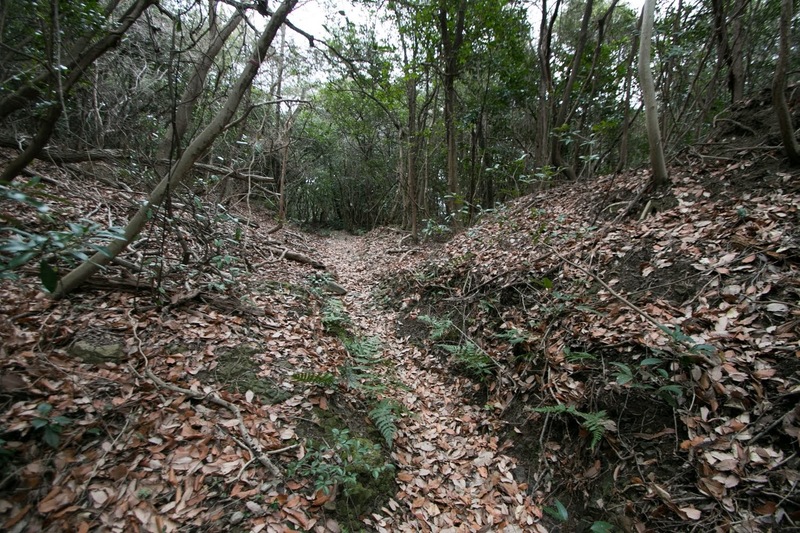 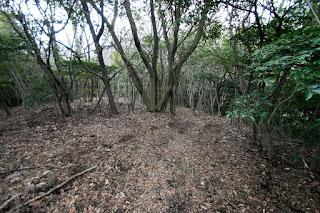 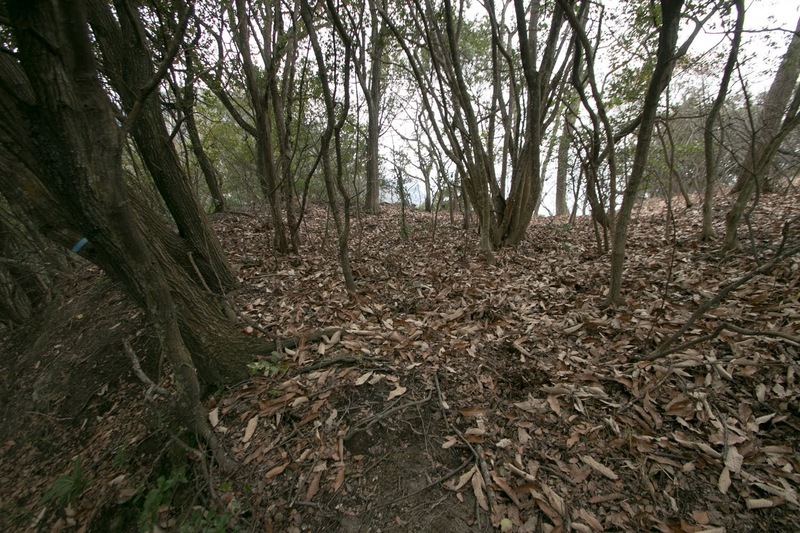 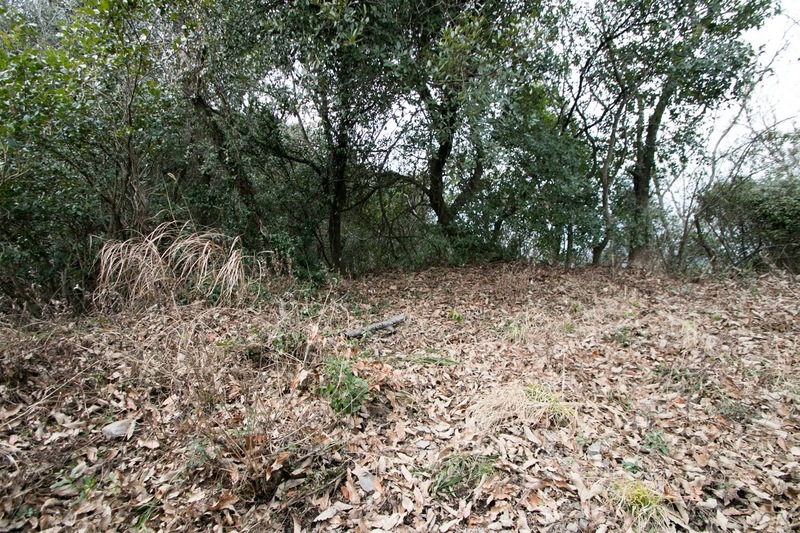 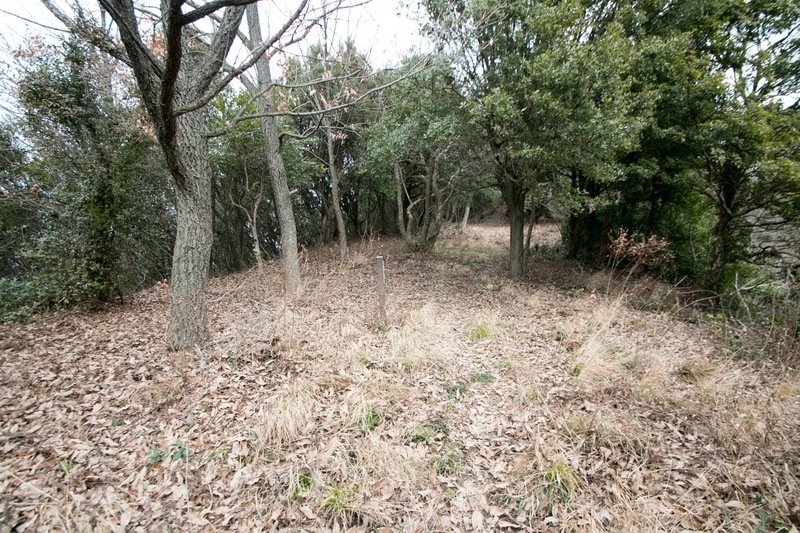 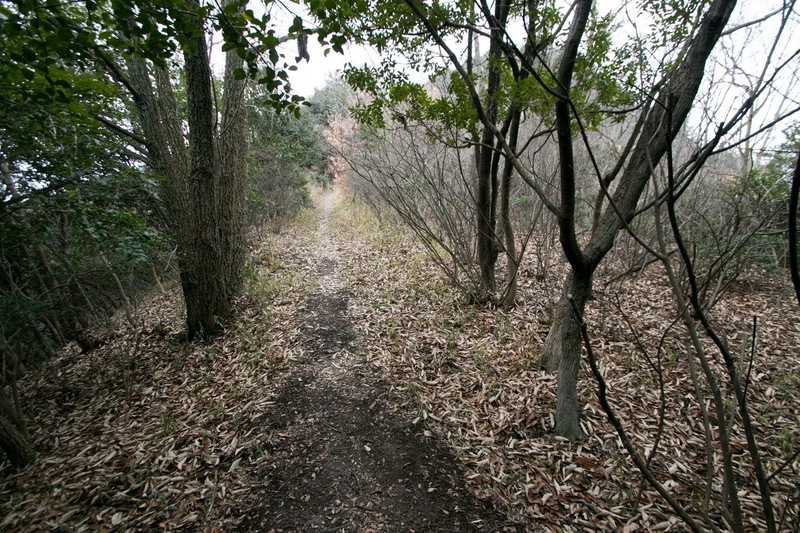 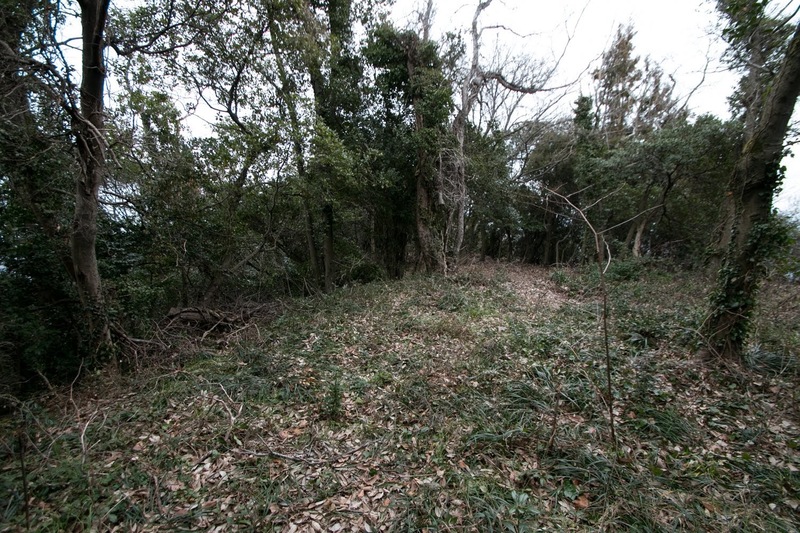 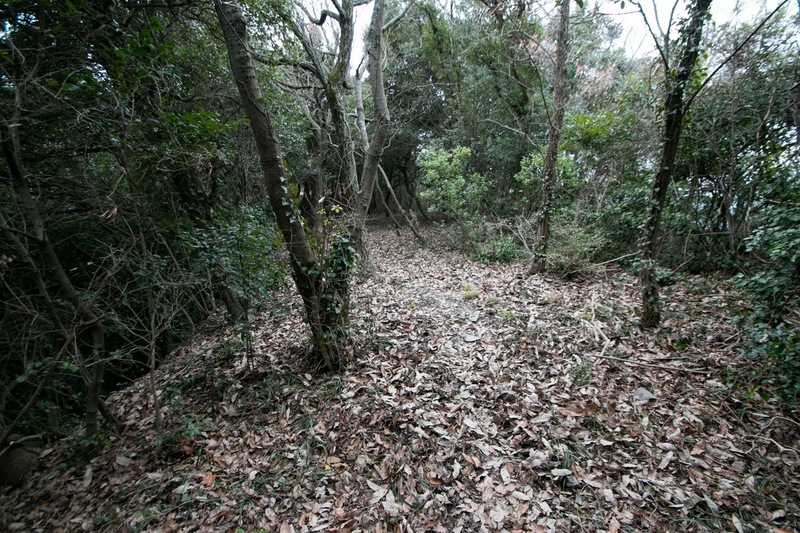 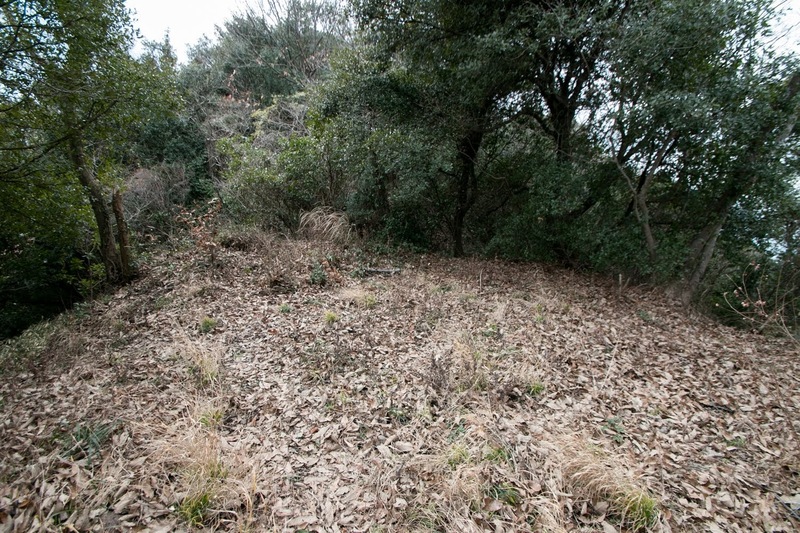 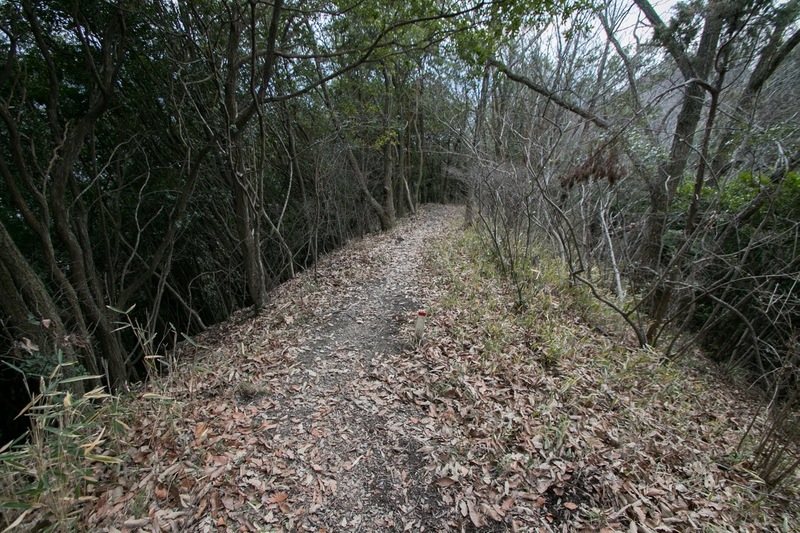 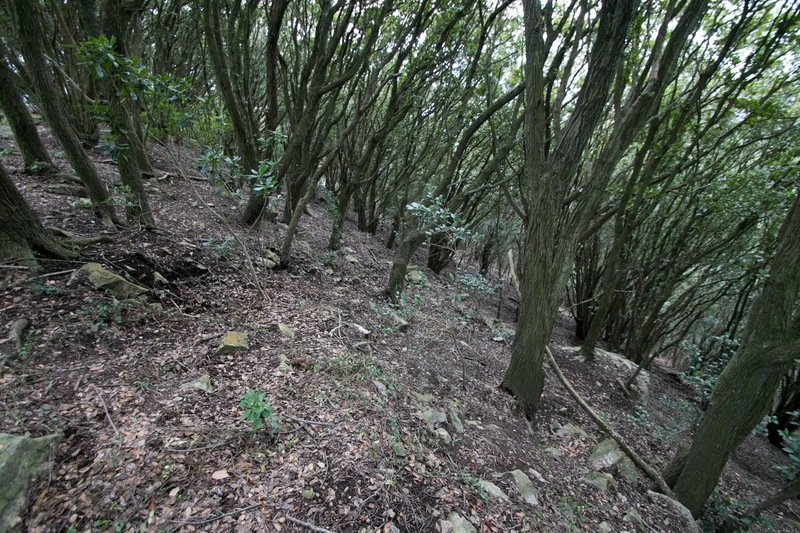 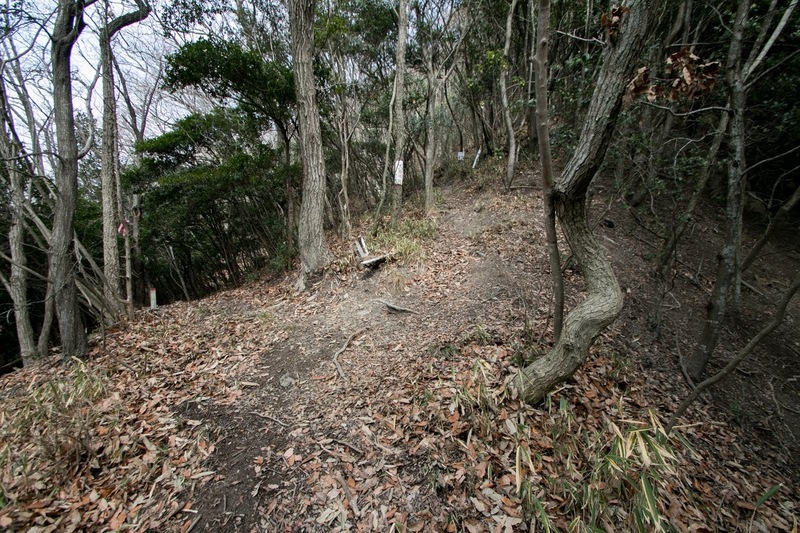 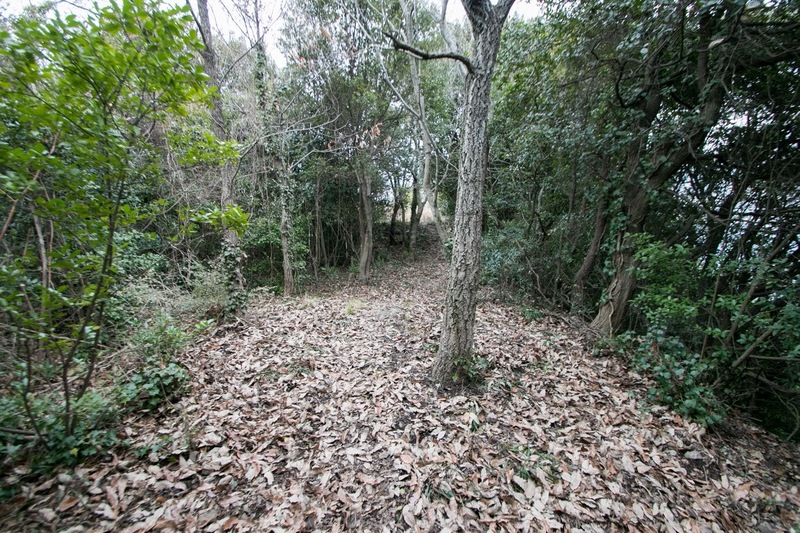 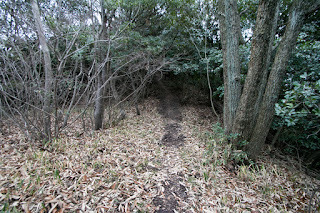 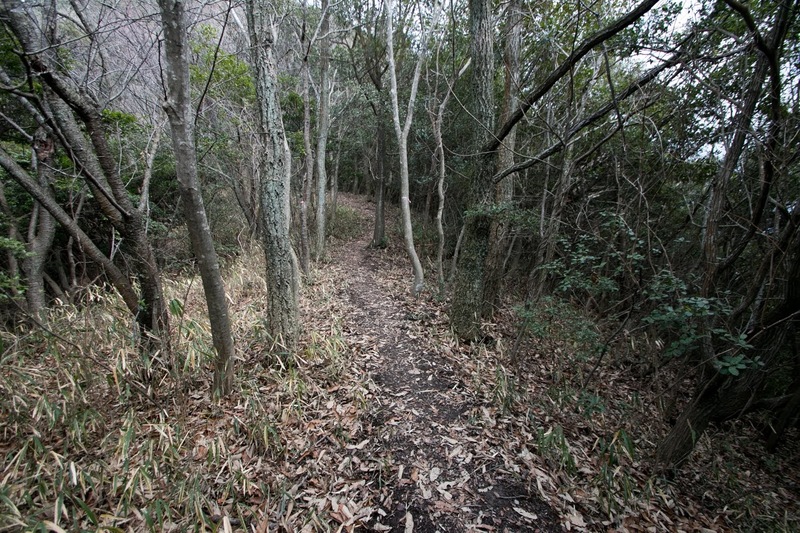 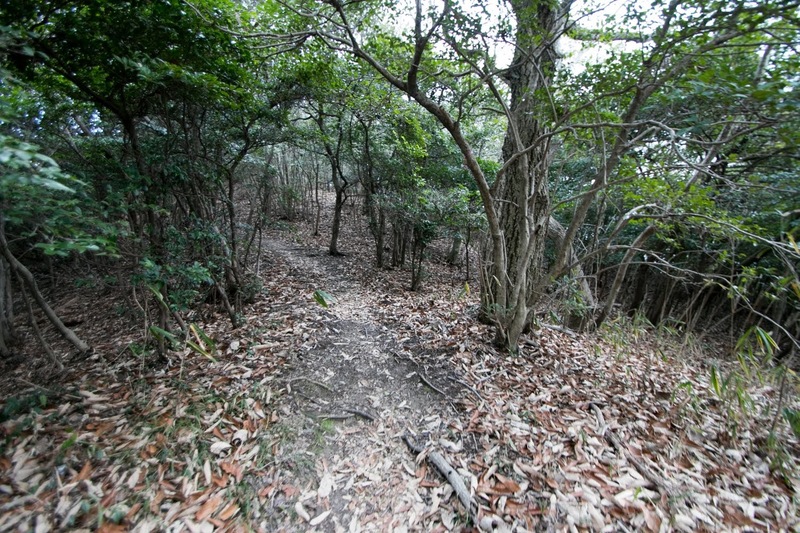 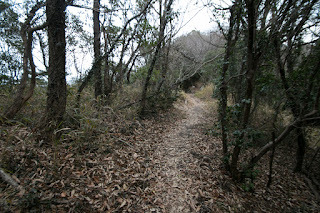 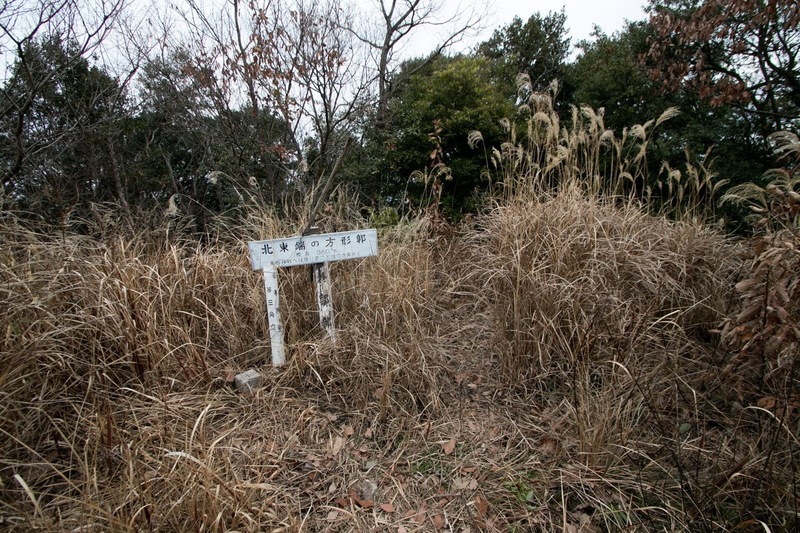 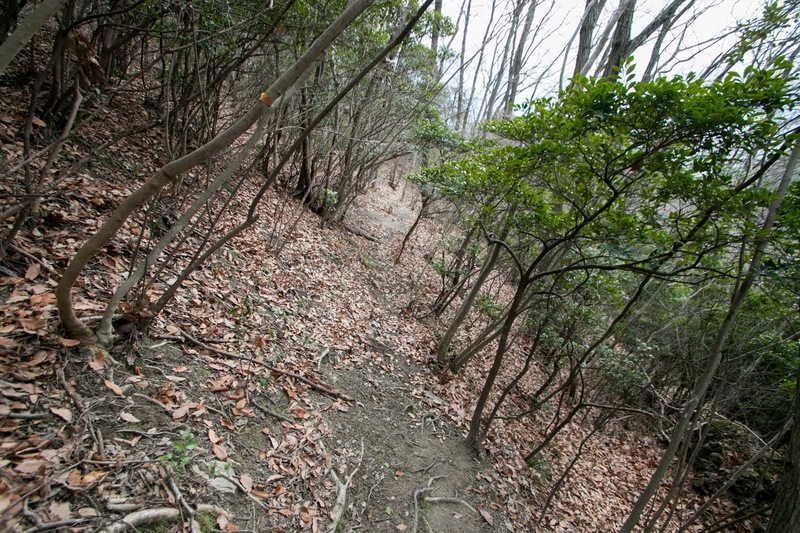 Kagawa clan became a retainer of Miyoshi clan but could kept their interest in the area. Amagiri castle might be expanded as a main base of major local lord around this time. 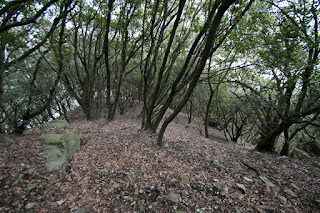 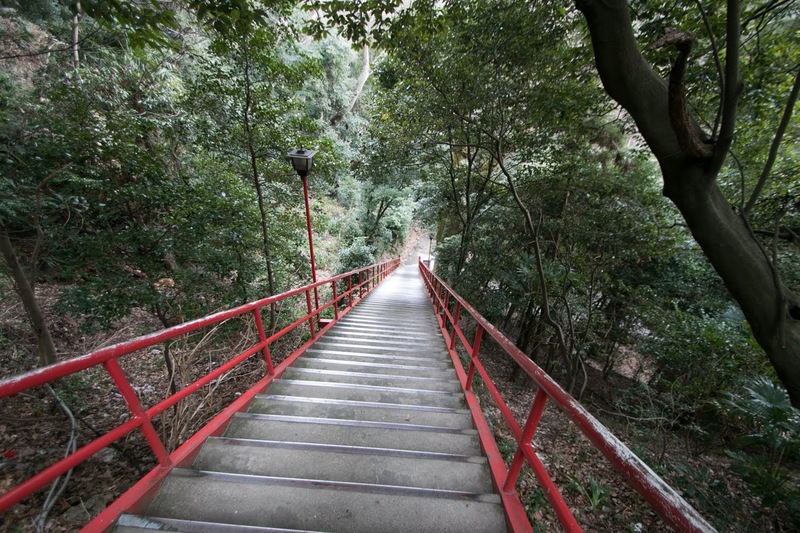 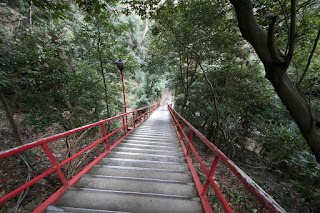 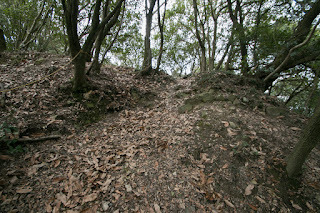 Amagiri castle is built over a long and narrow ridge of the mountain. 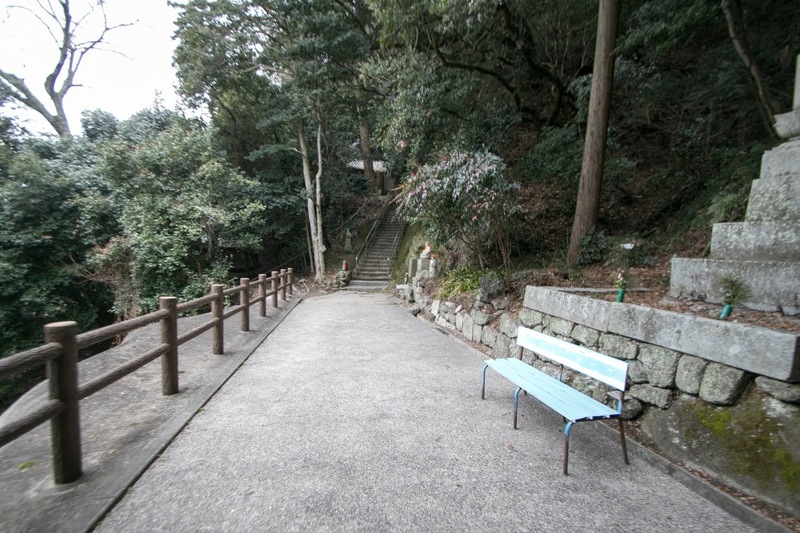 Central area of the castle is a terrace of about 20 meter long and 10 meter wide, at the peak of the mountain. 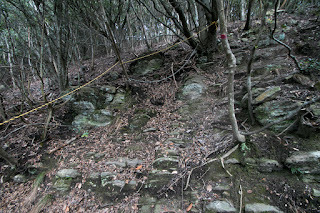 From central area, line of terraces are built toward north over 200 meter. 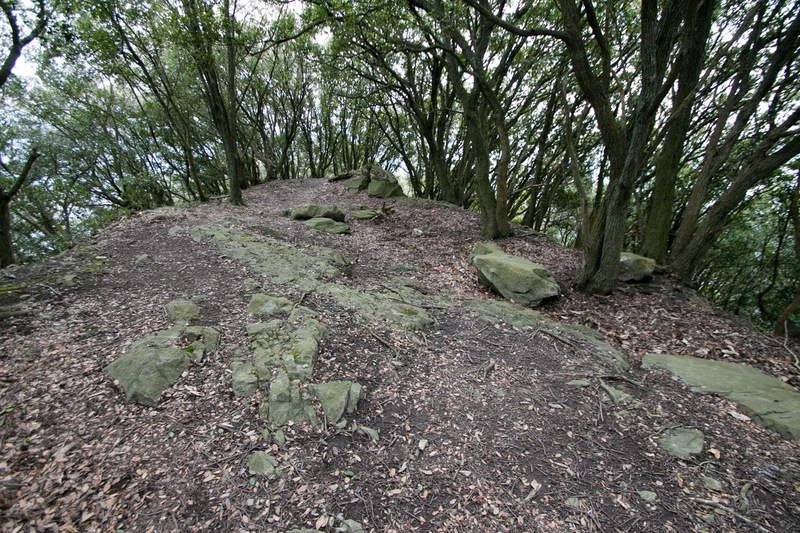 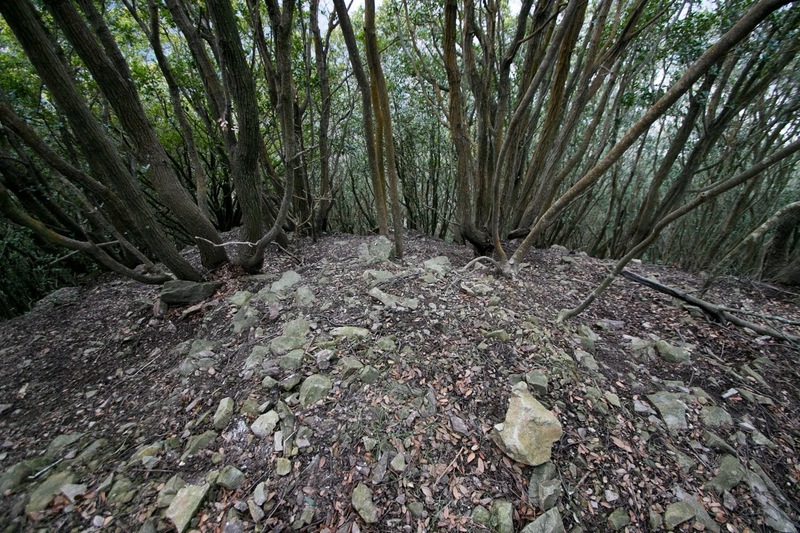 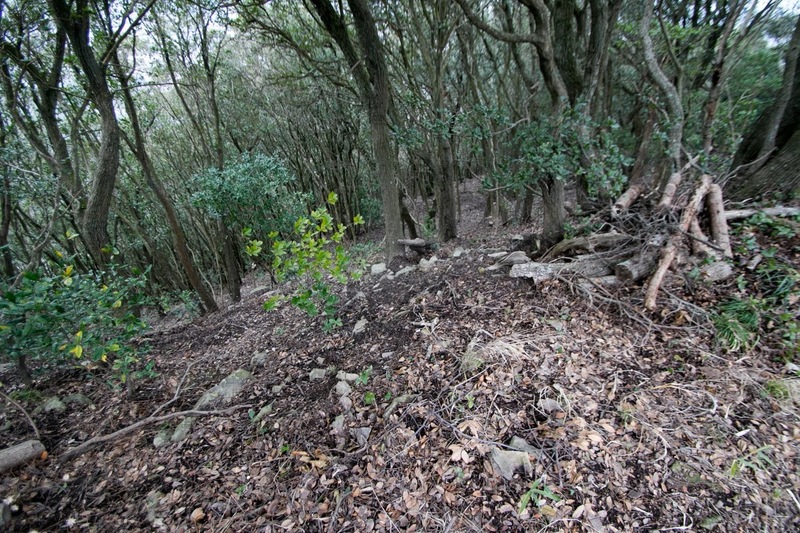 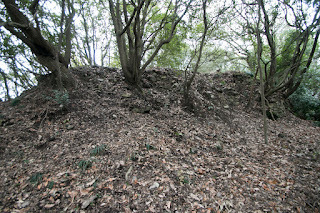 Each area keep the shape of original terrain and do not have complex structures, but there remain the remnant of stone walls around central area. Southward of core area is an approach road from Iyadani temple and an expected front for enemy. 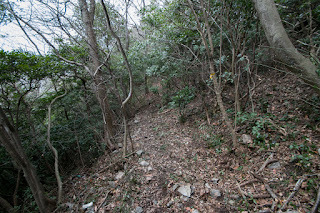 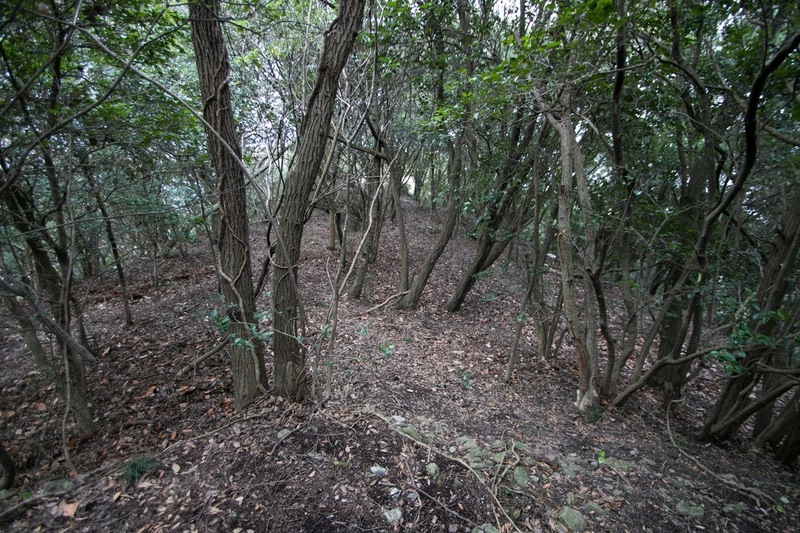 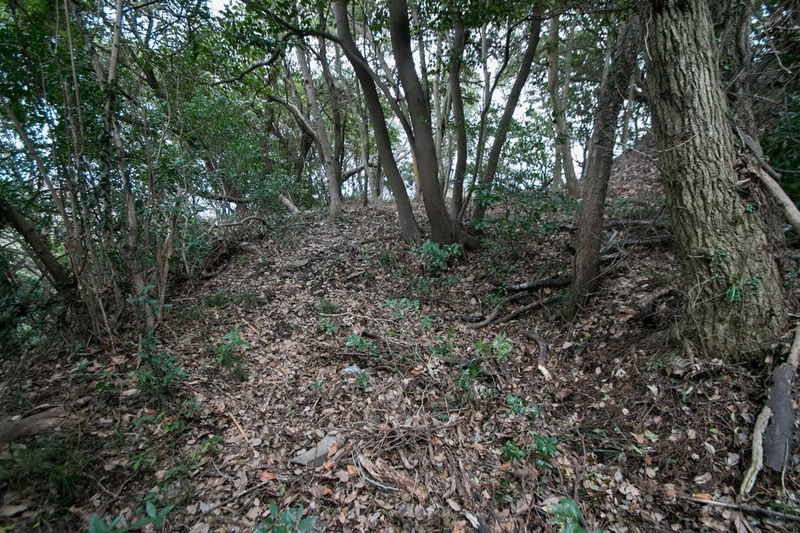 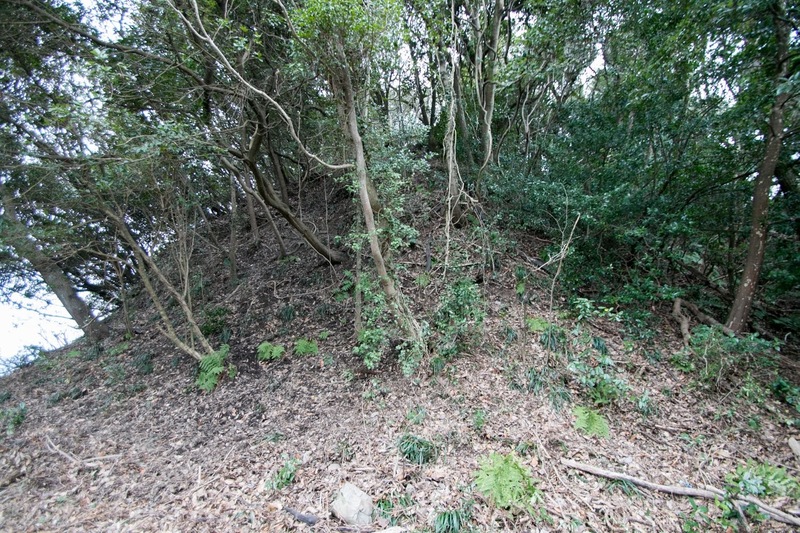 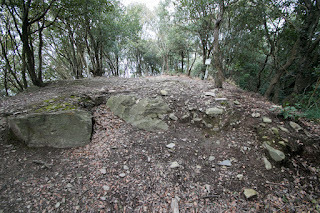 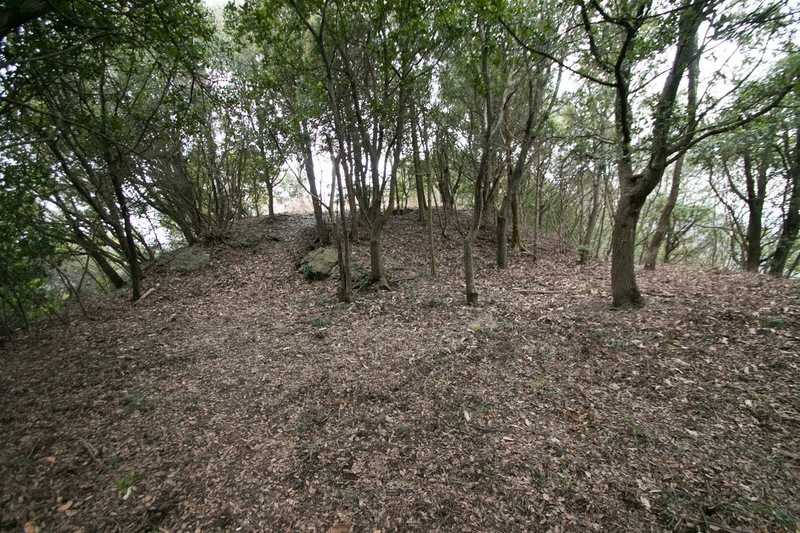 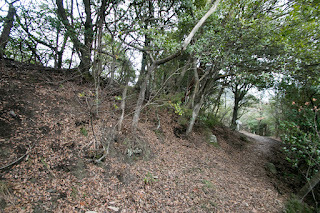 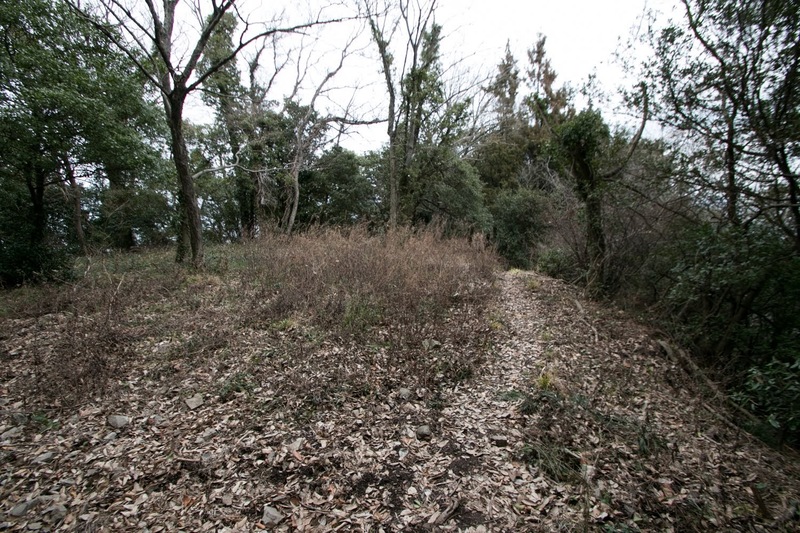 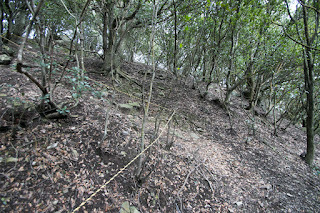 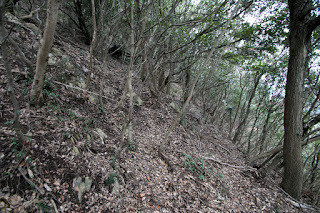 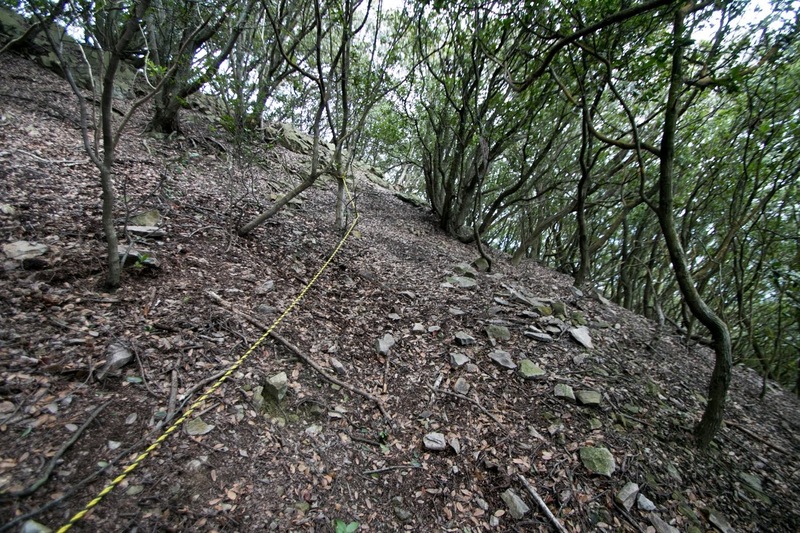 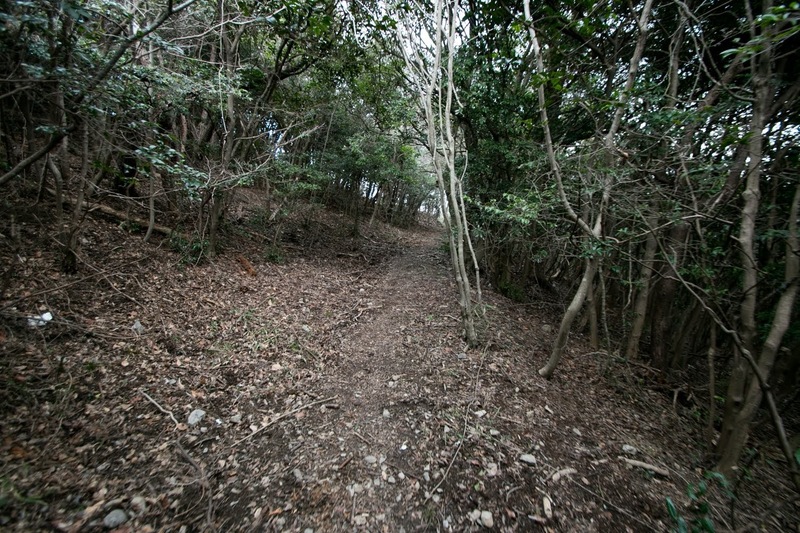 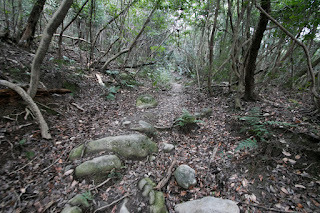 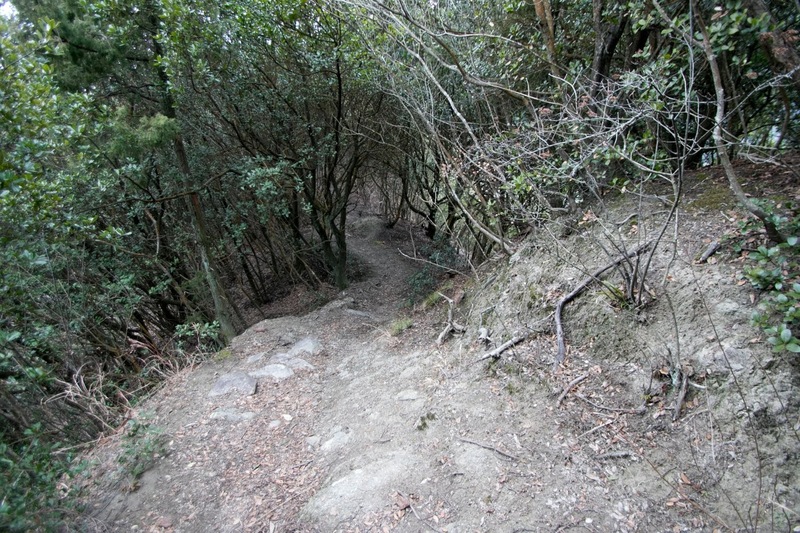 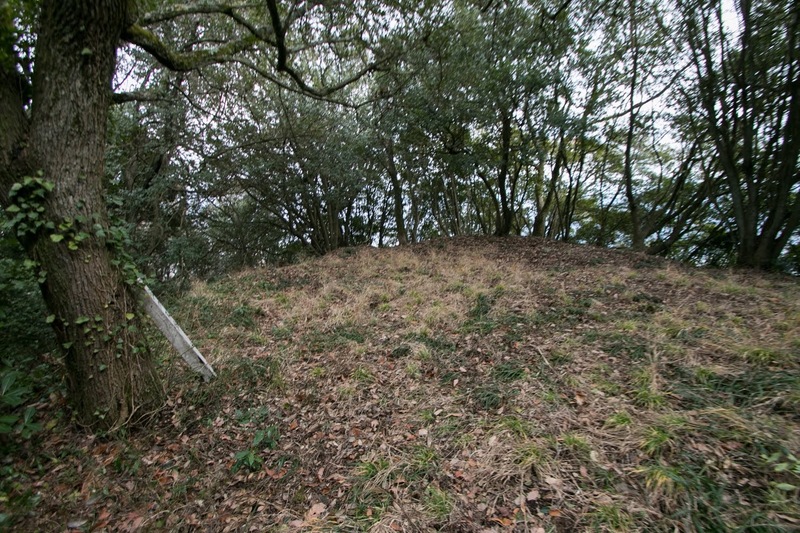 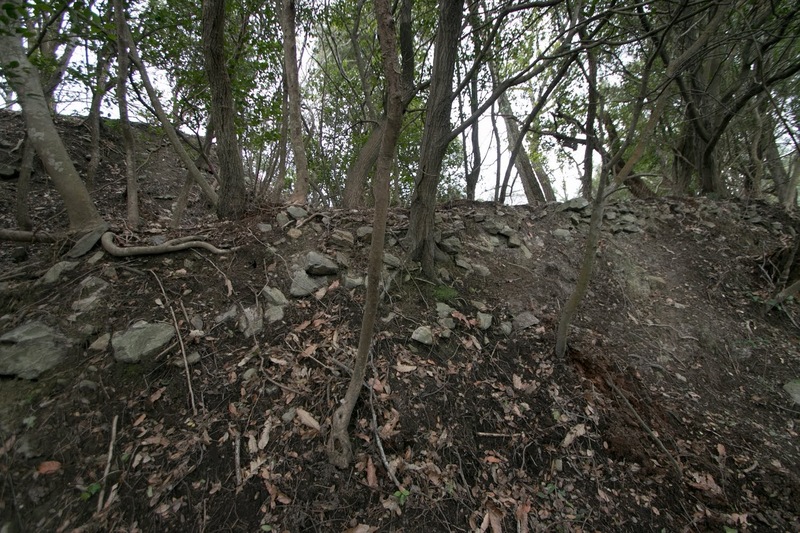 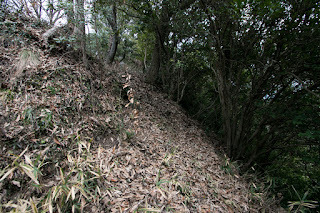 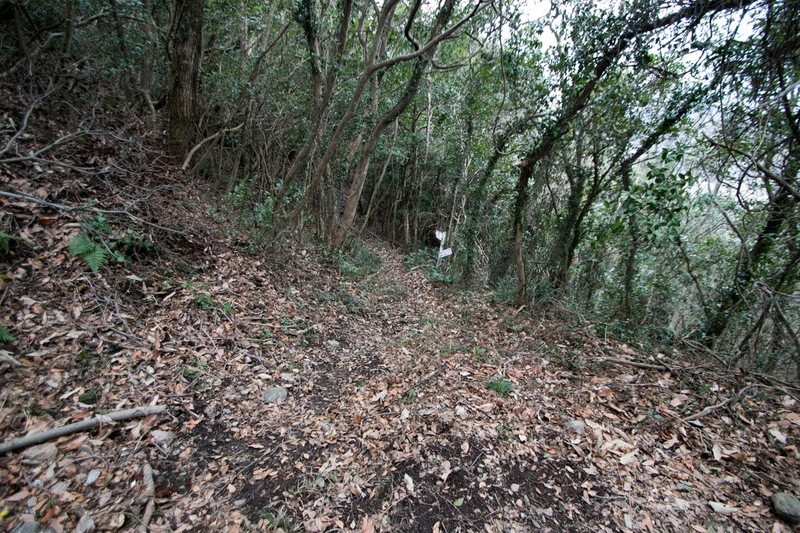 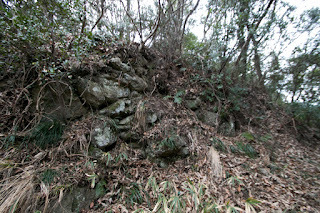 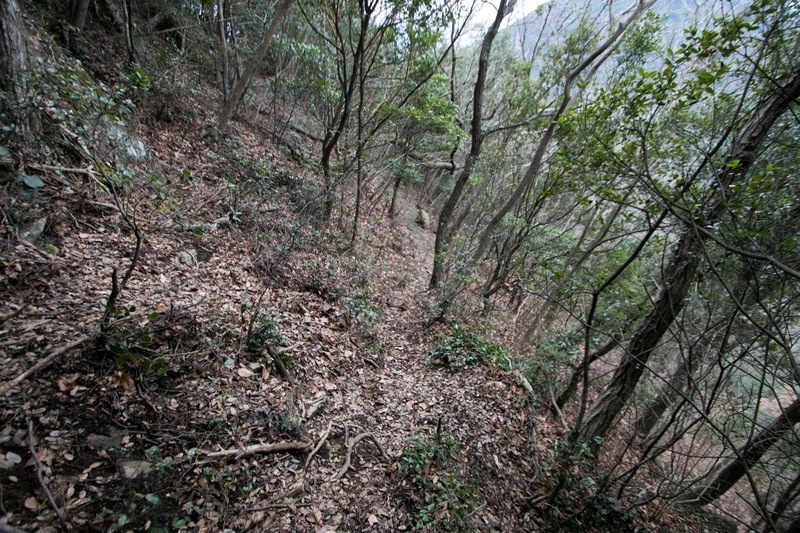 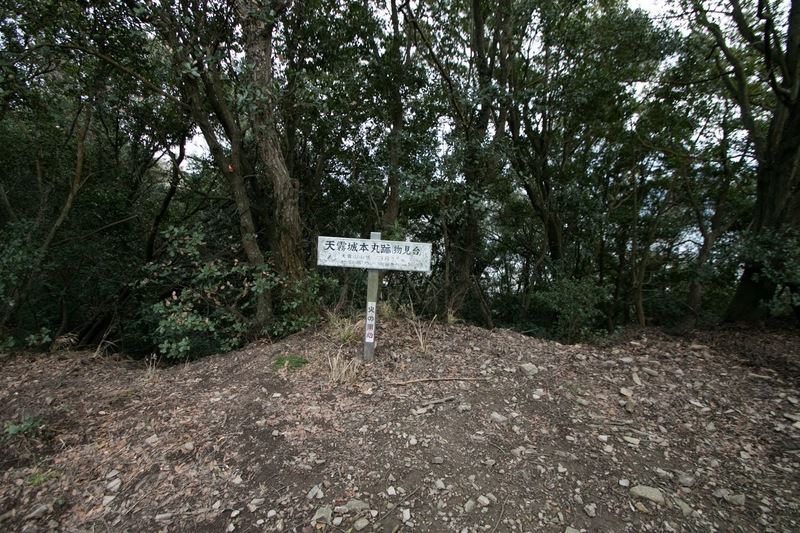 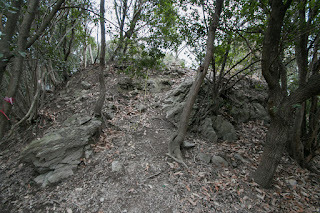 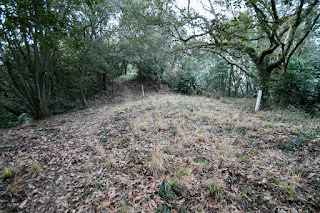 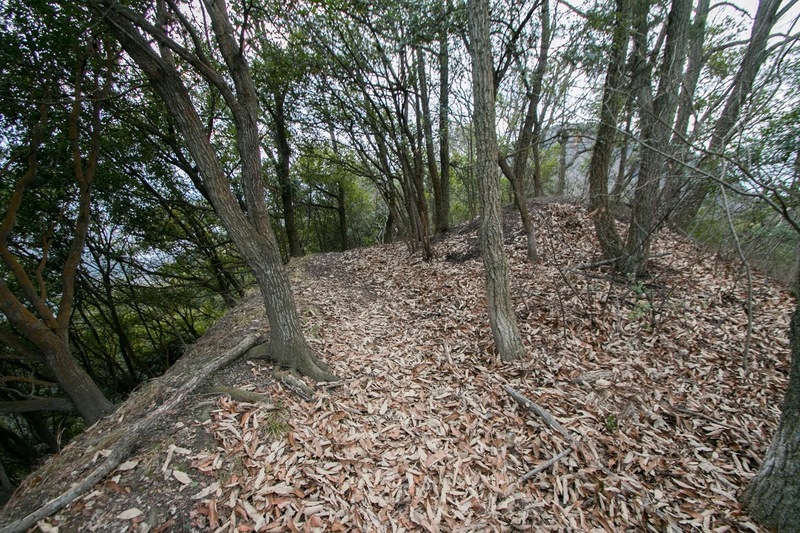 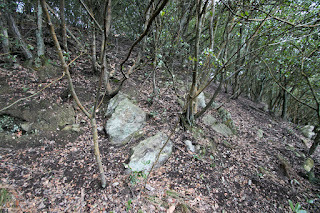 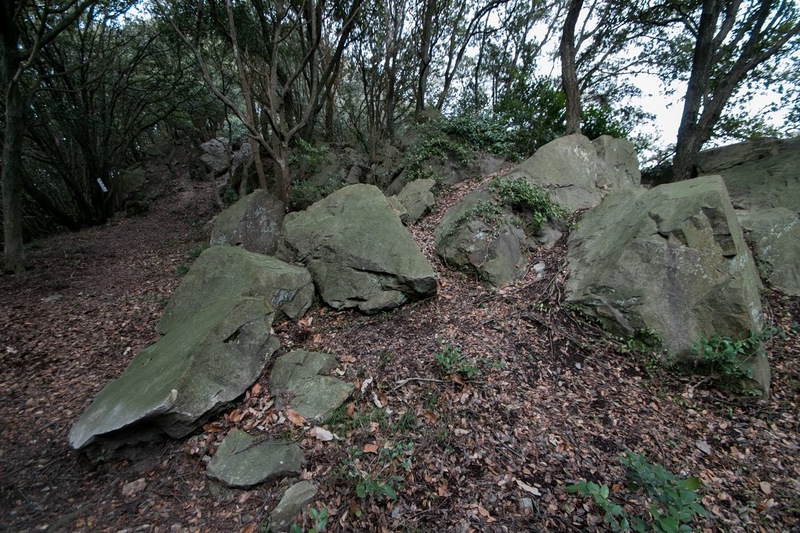 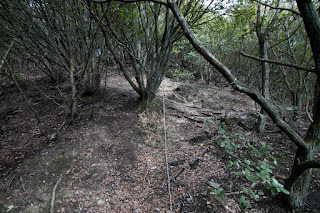 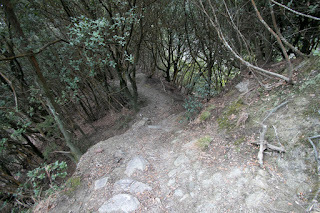 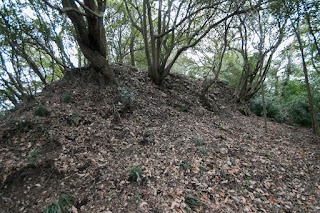 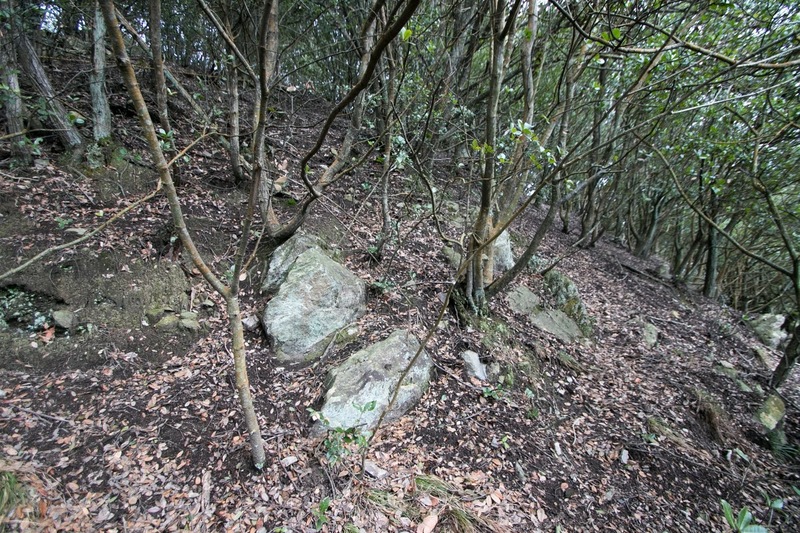 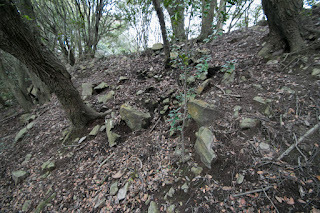 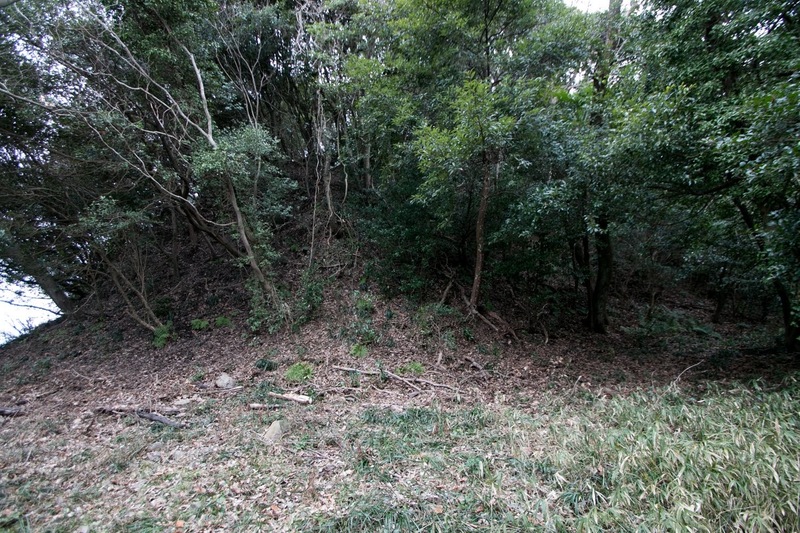 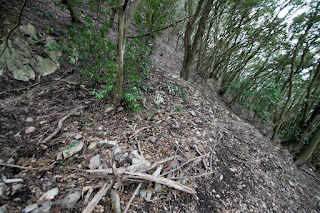 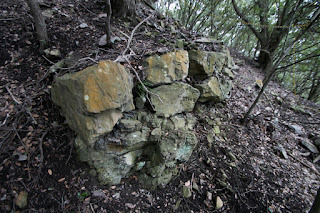 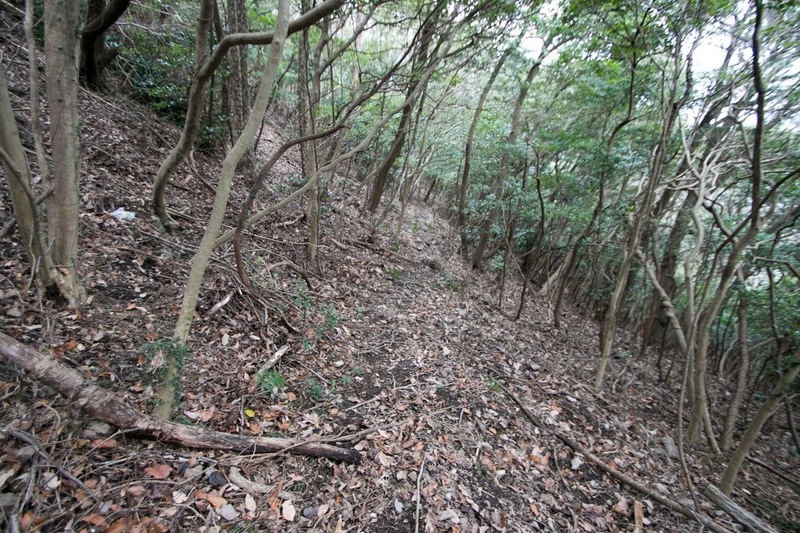 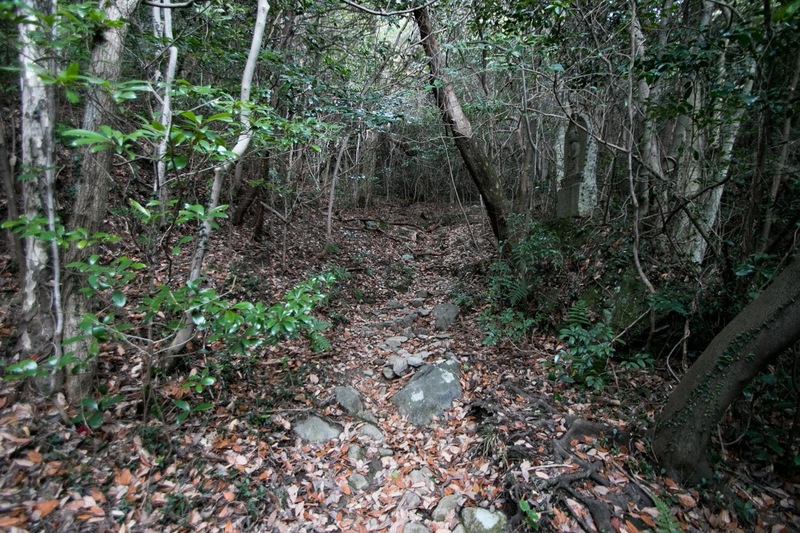 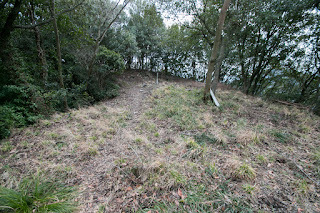 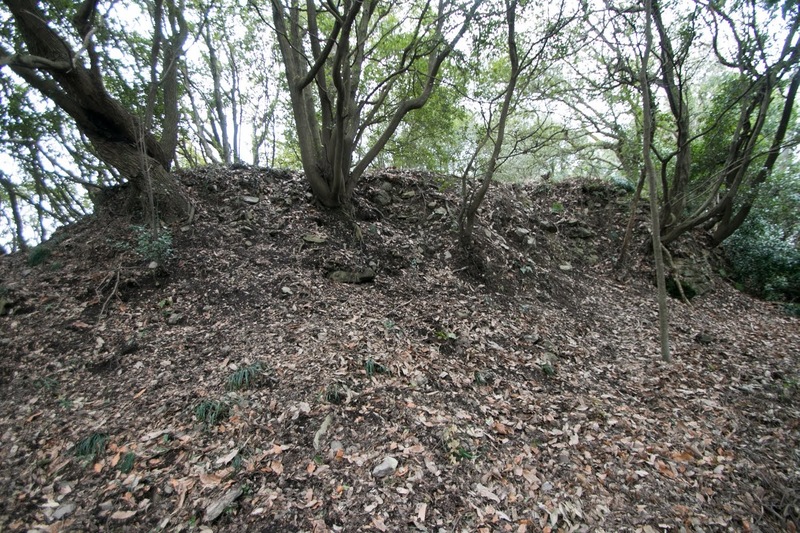 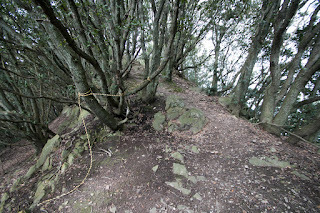 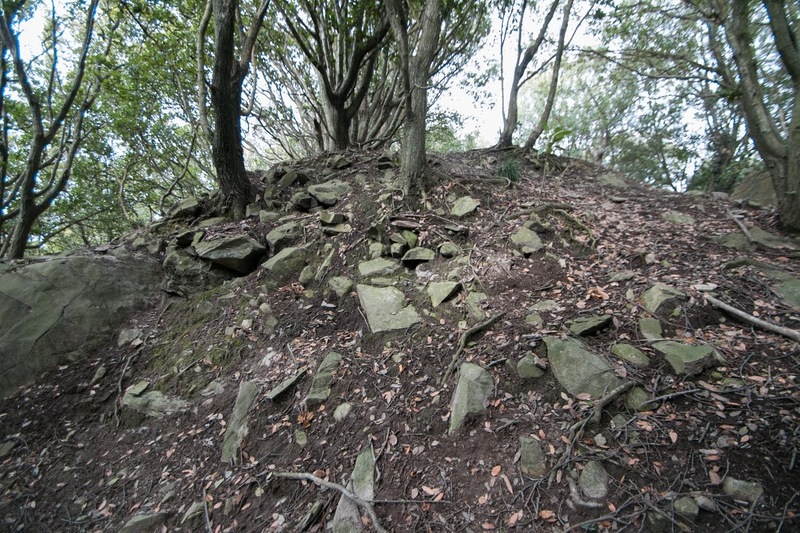 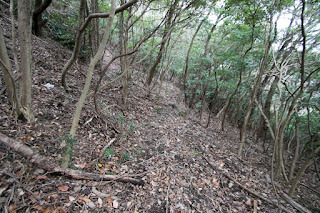 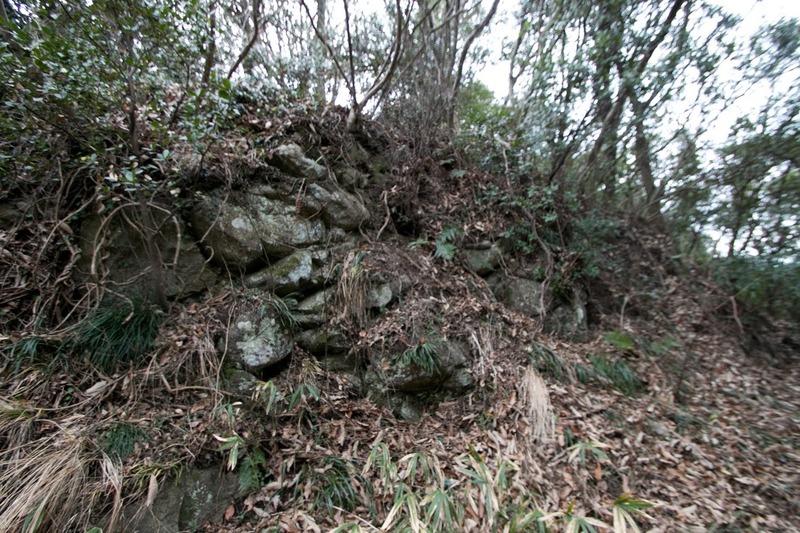 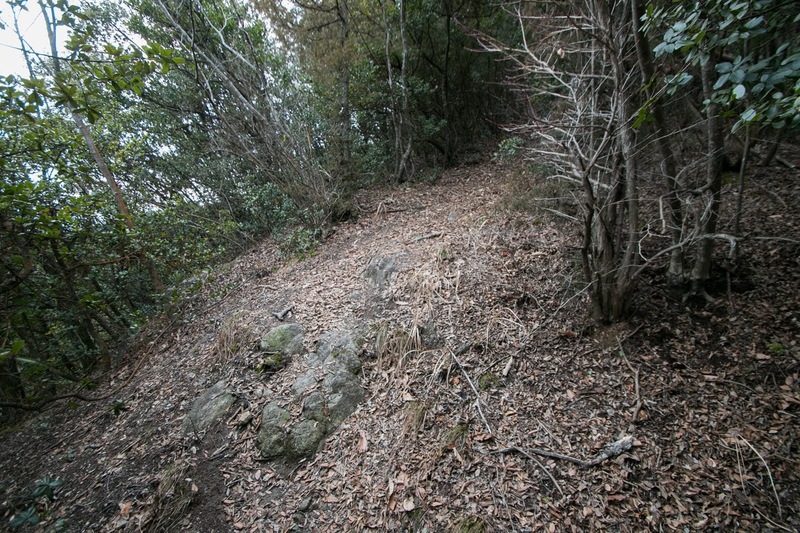 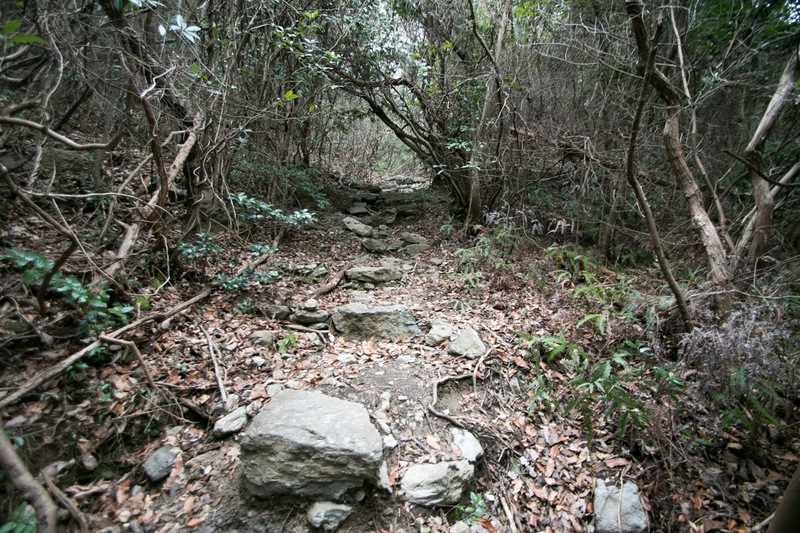 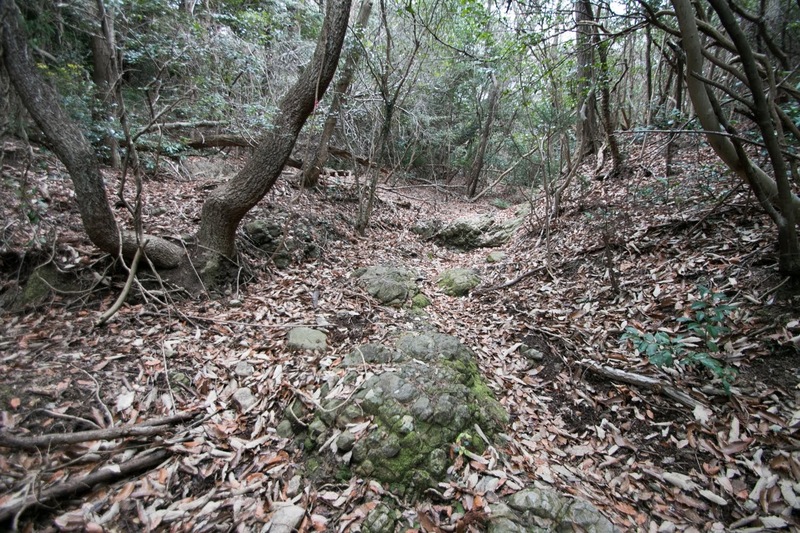 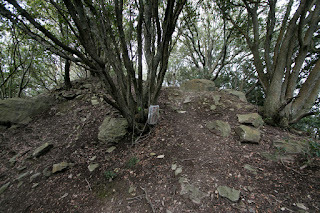 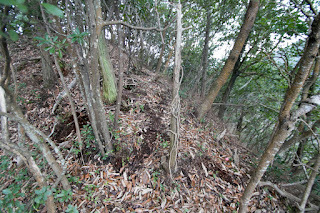 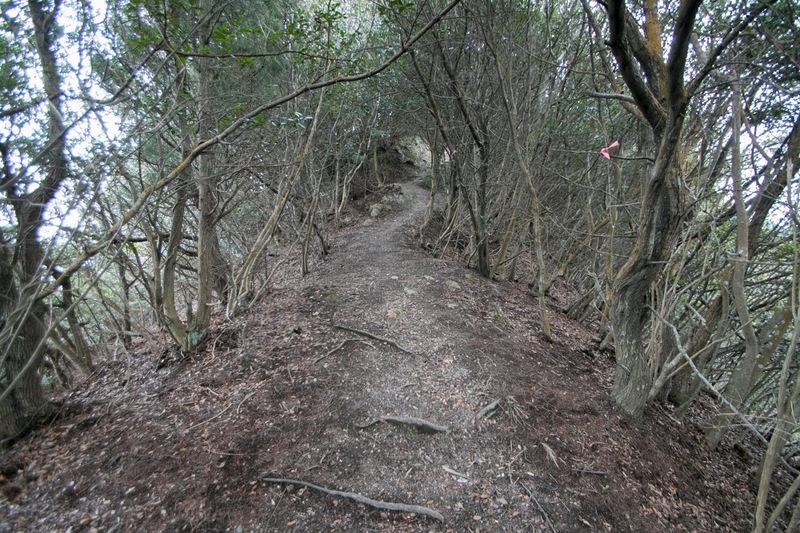 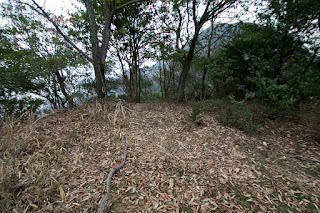 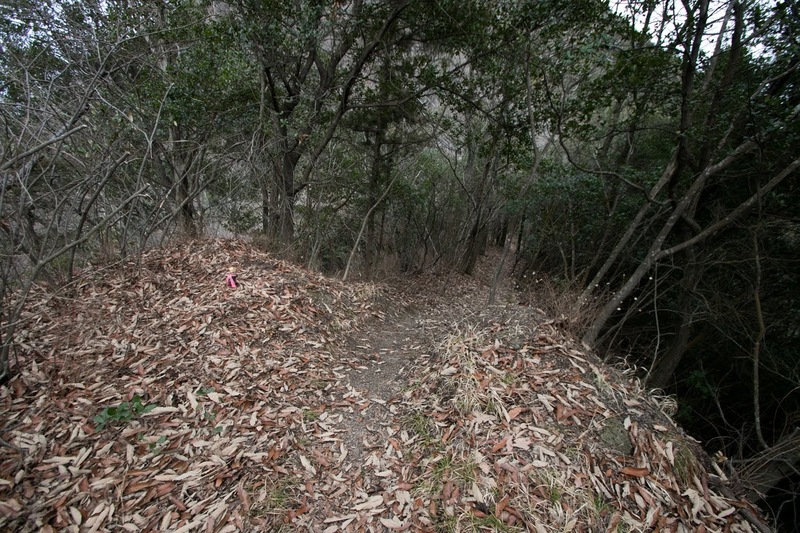 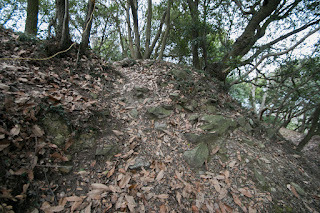 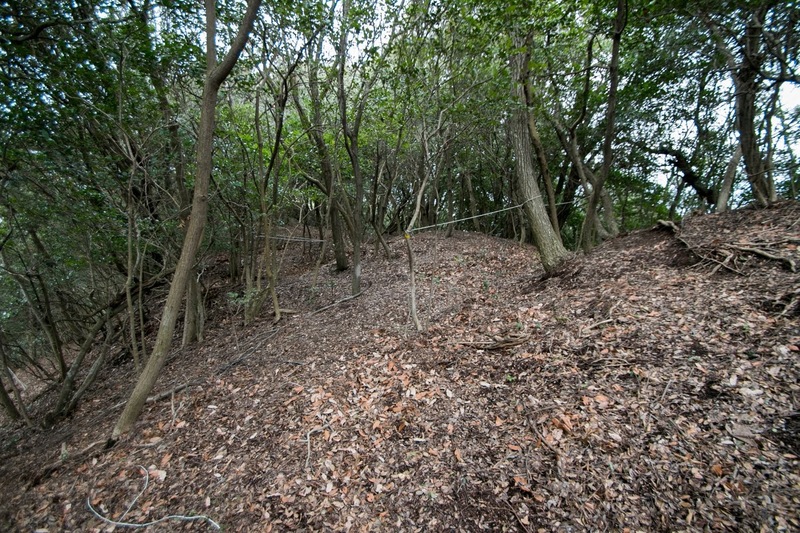 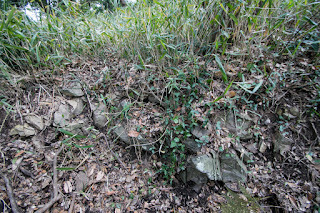 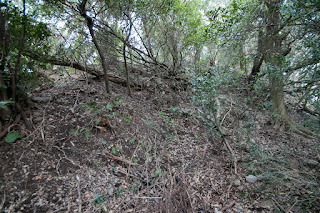 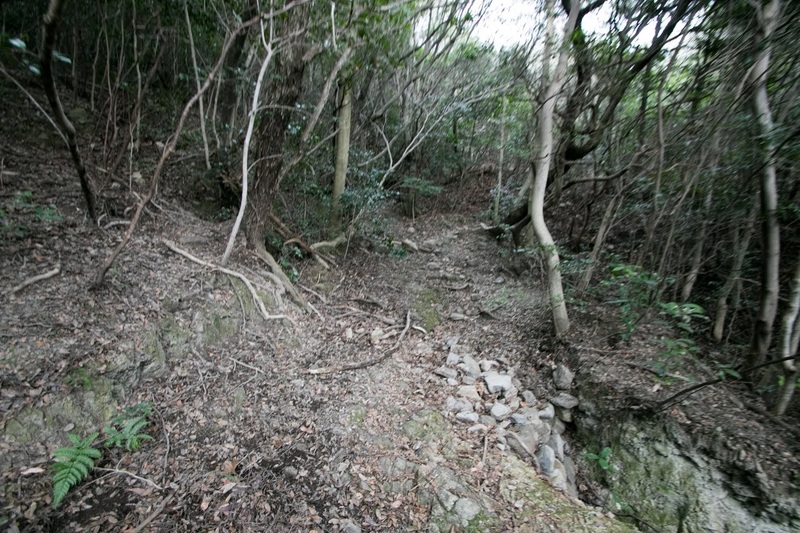 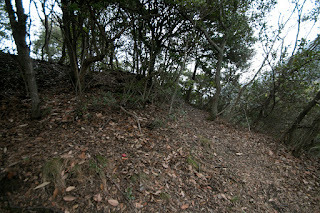 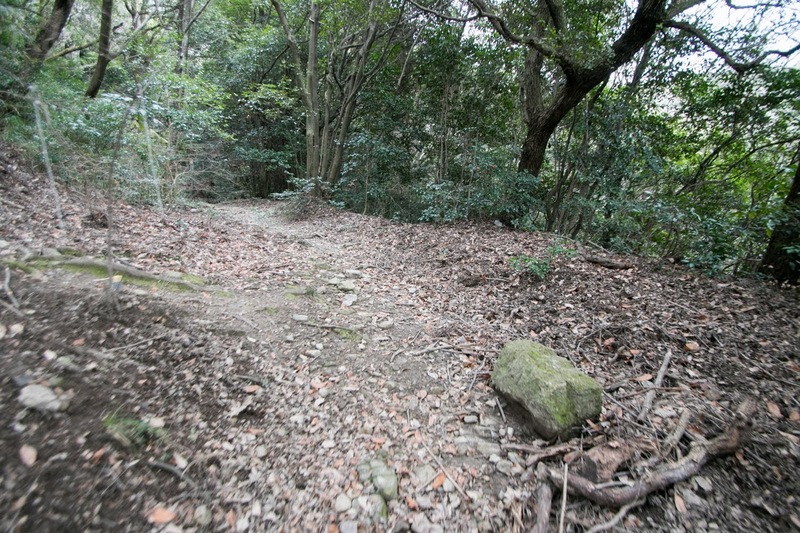 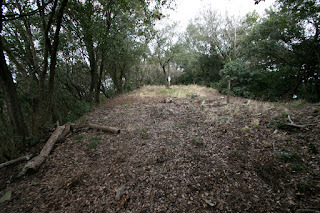 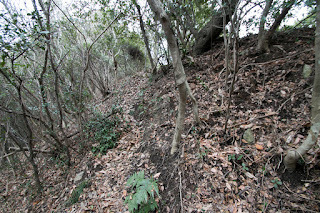 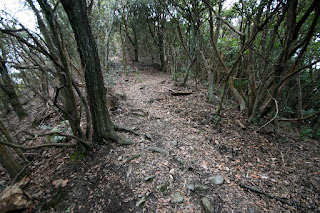 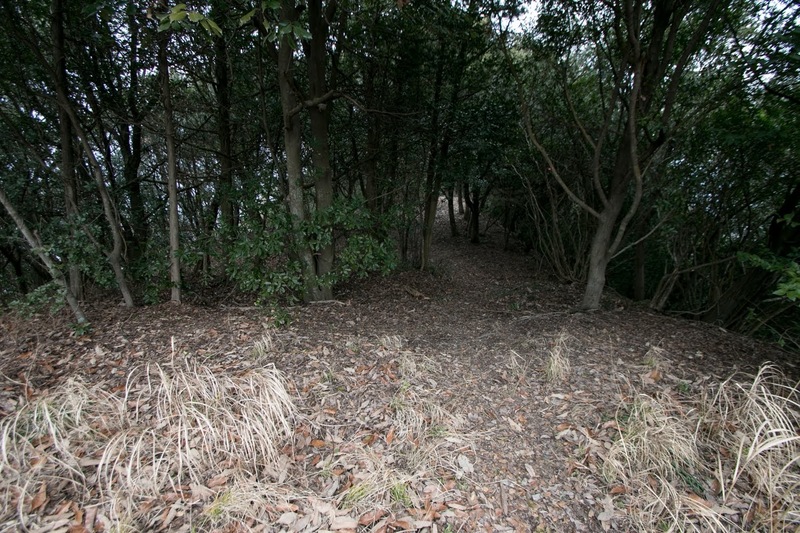 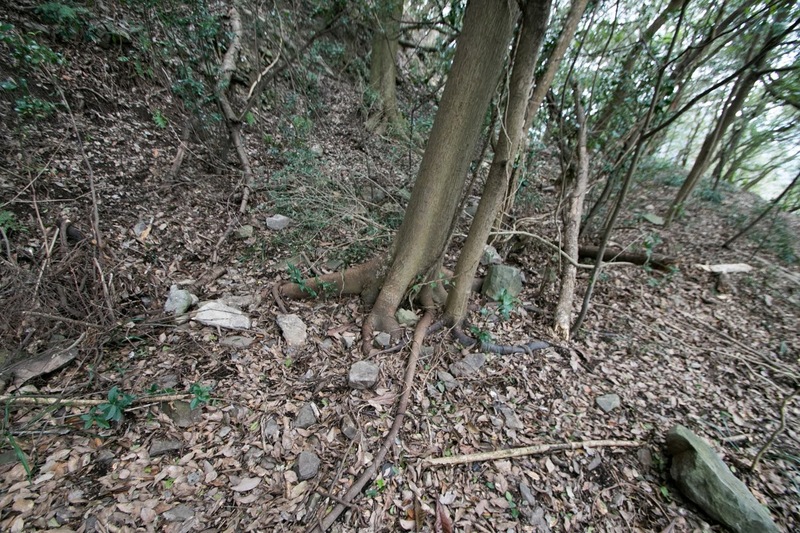 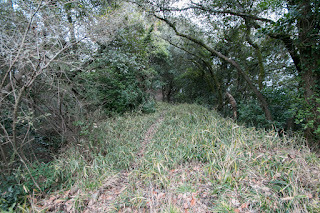 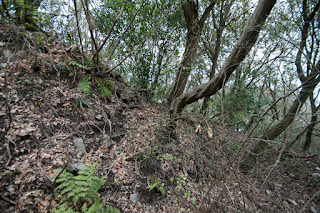 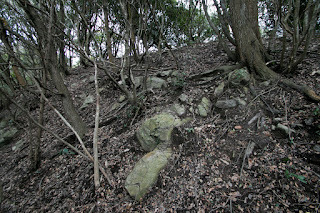 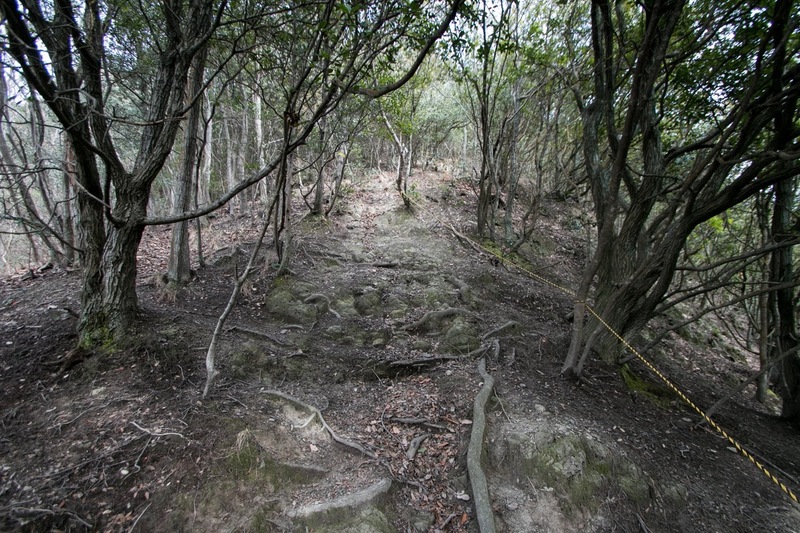 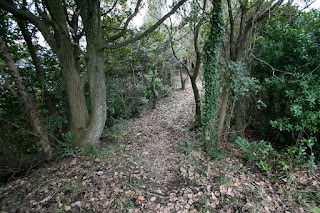 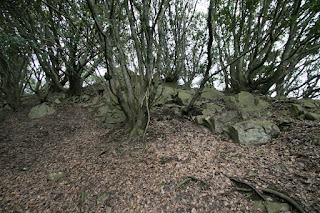 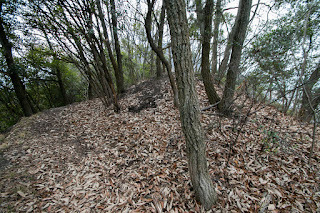 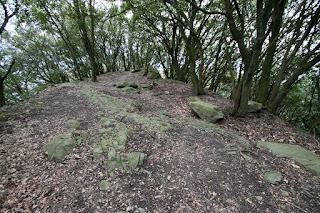 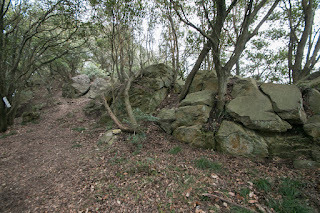 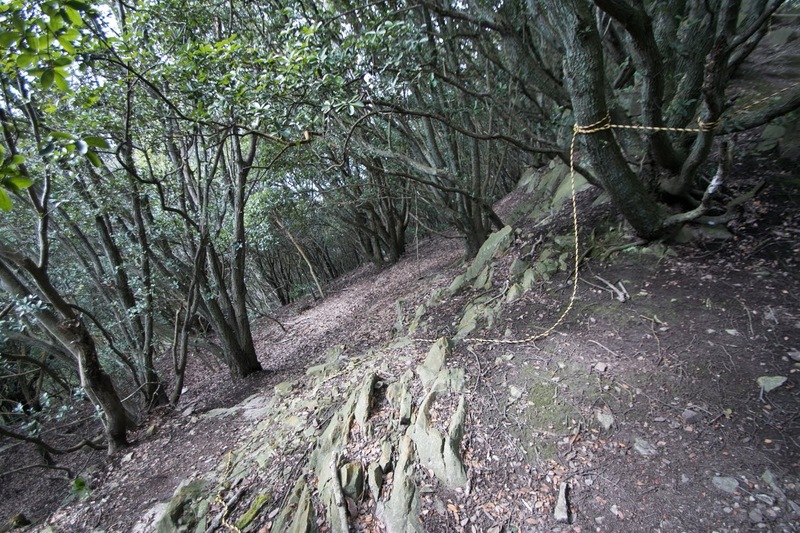 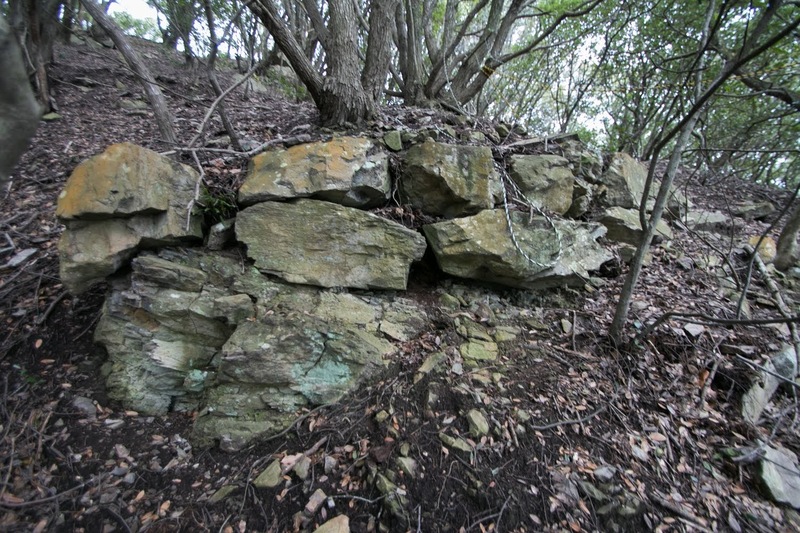 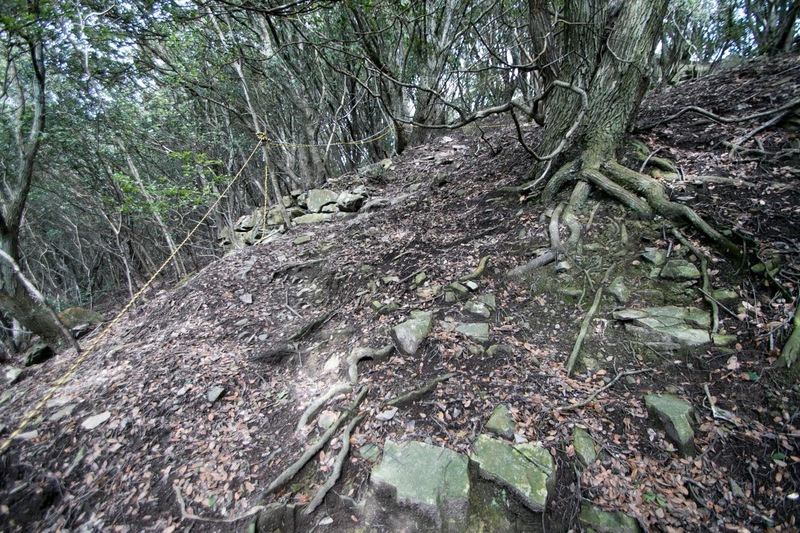 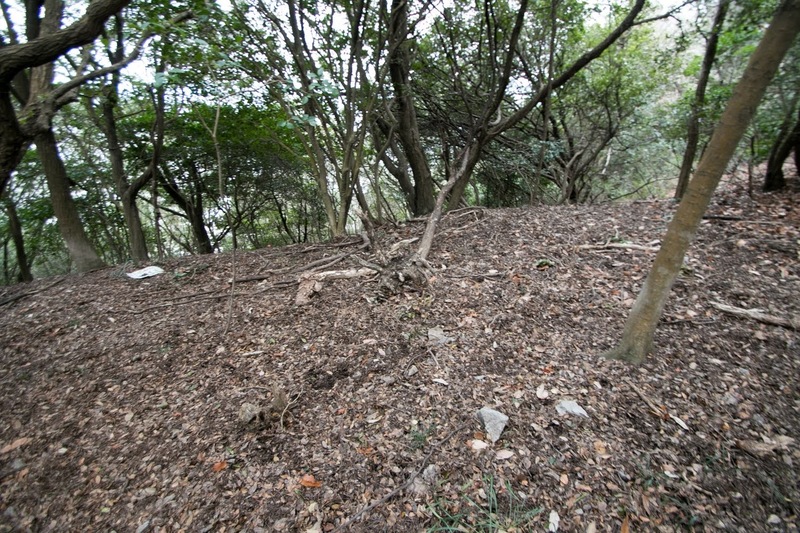 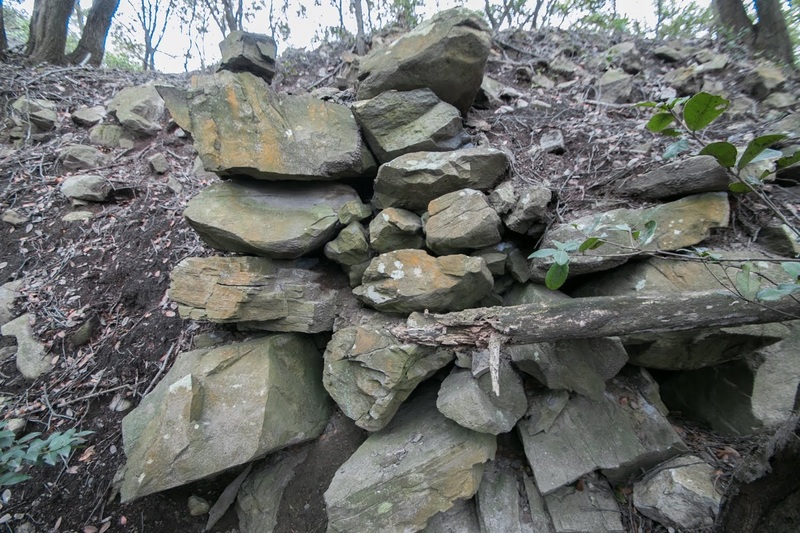 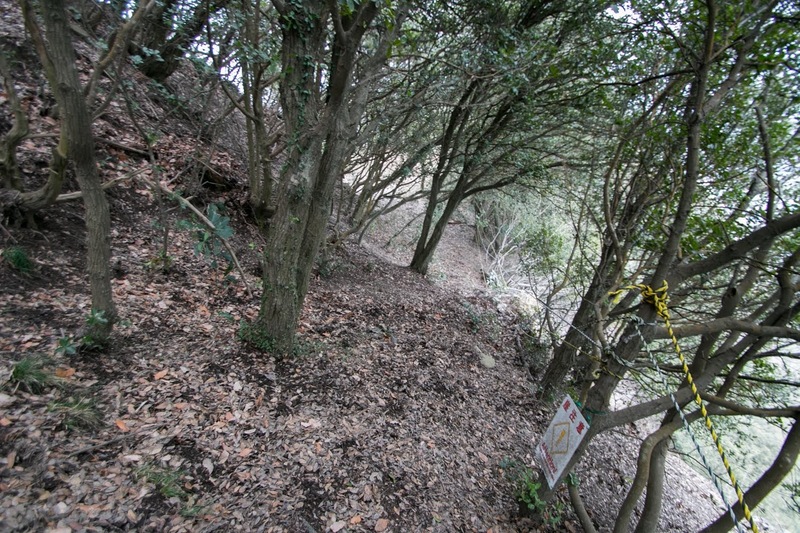 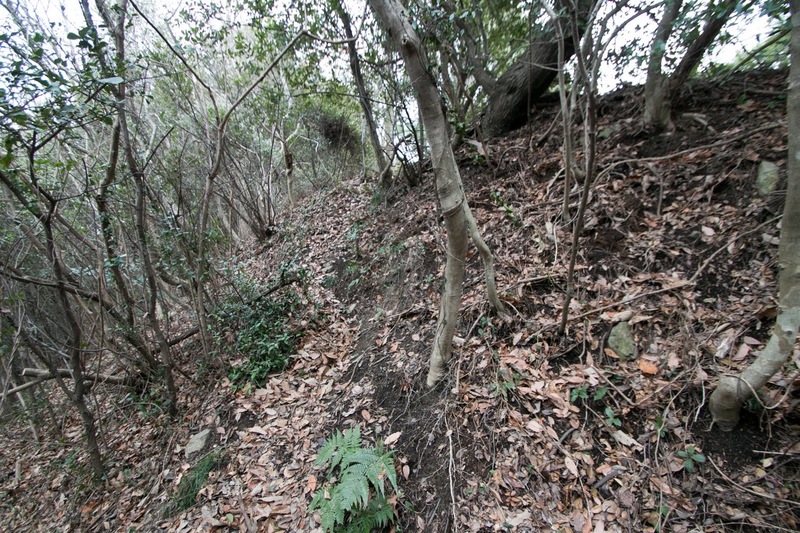 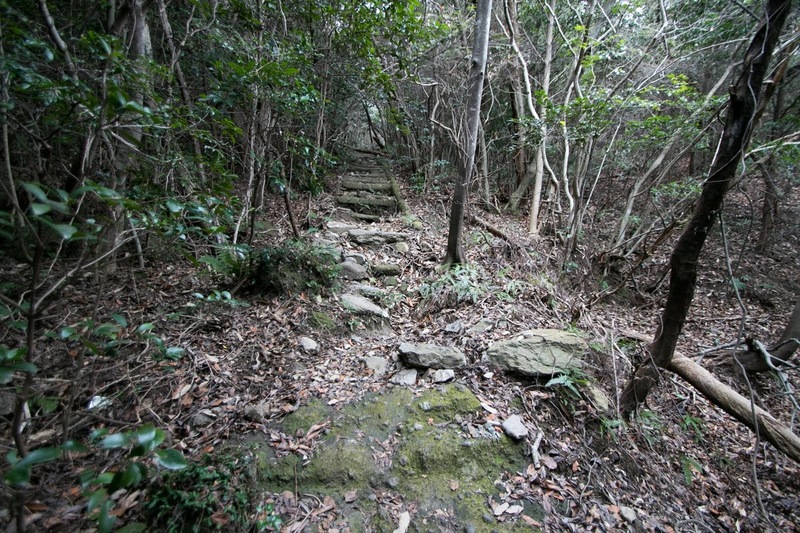 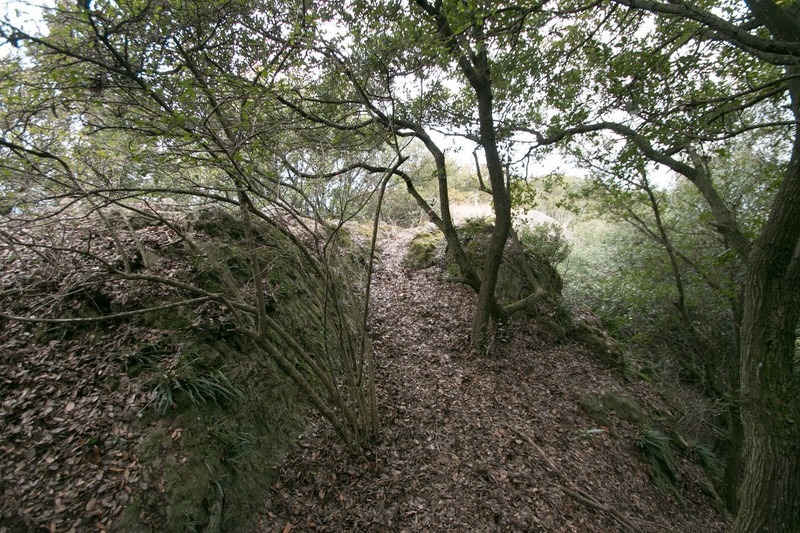 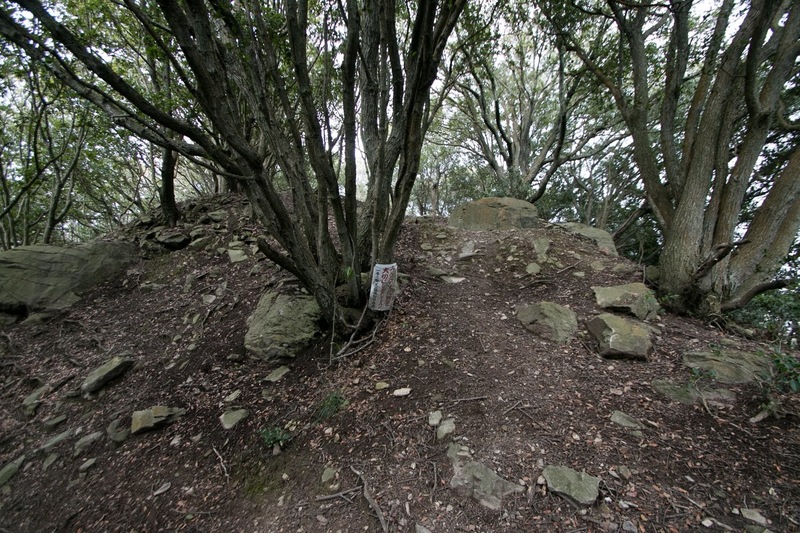 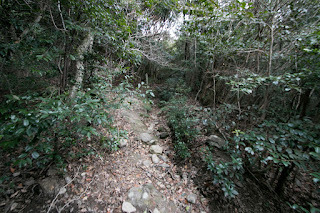 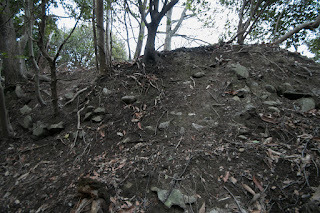 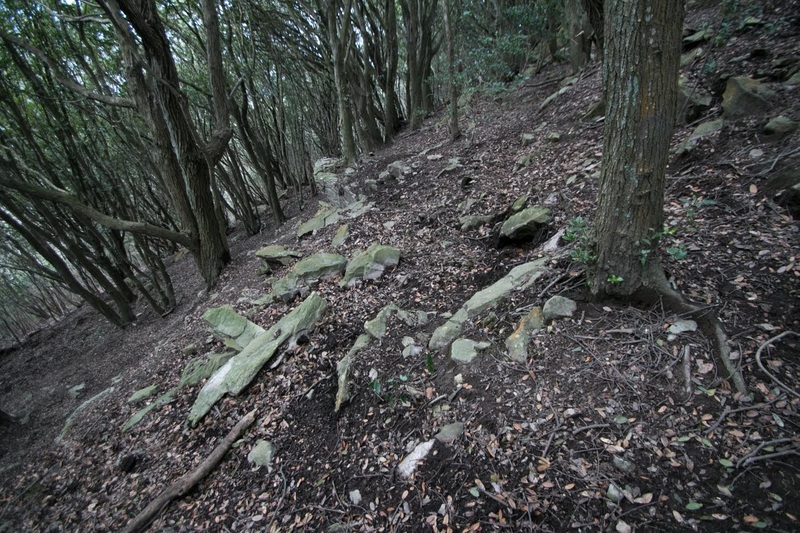 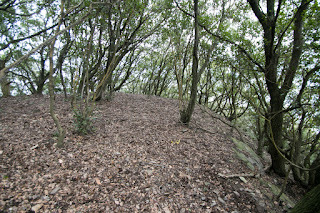 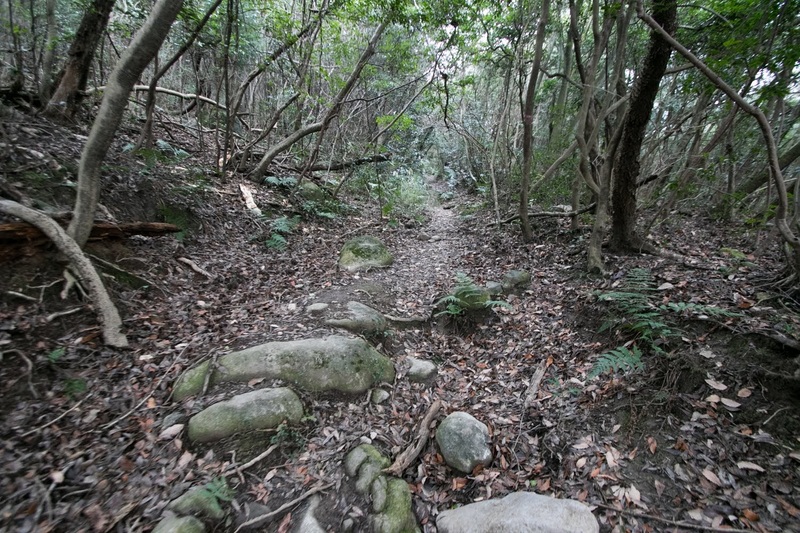 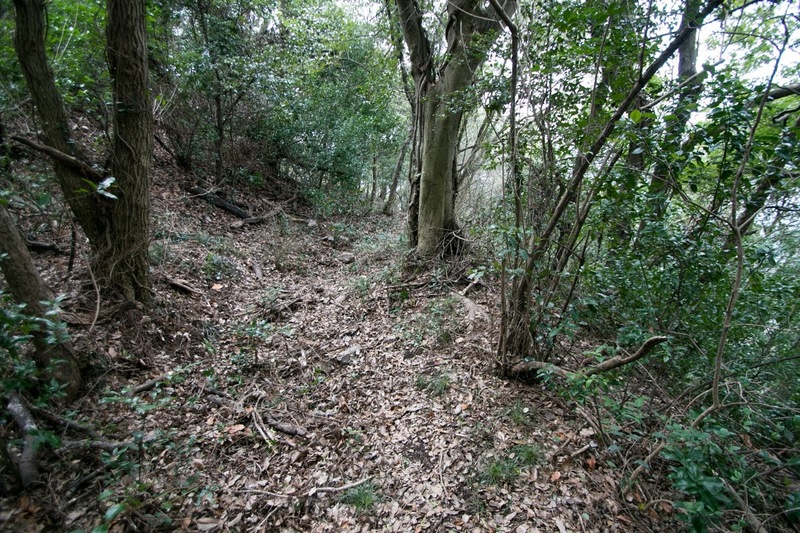 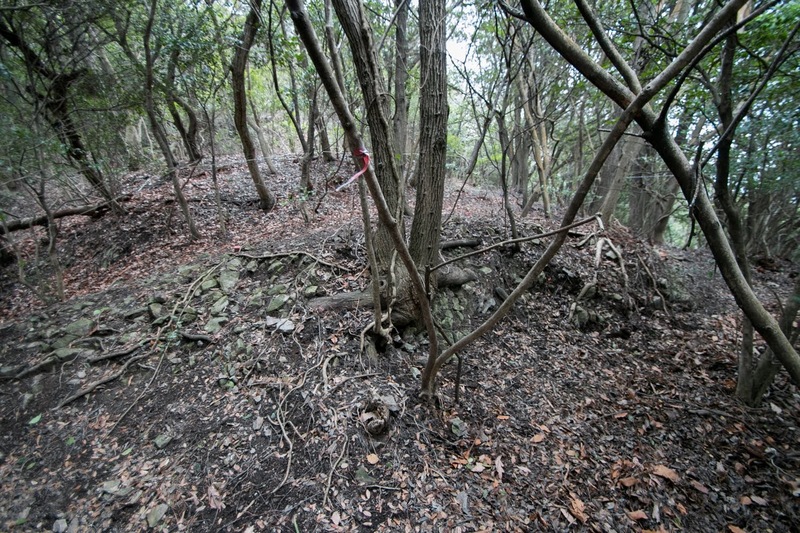 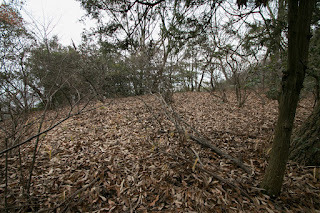 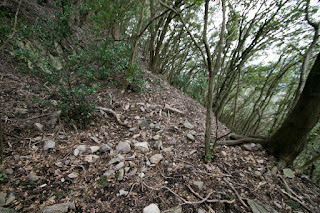 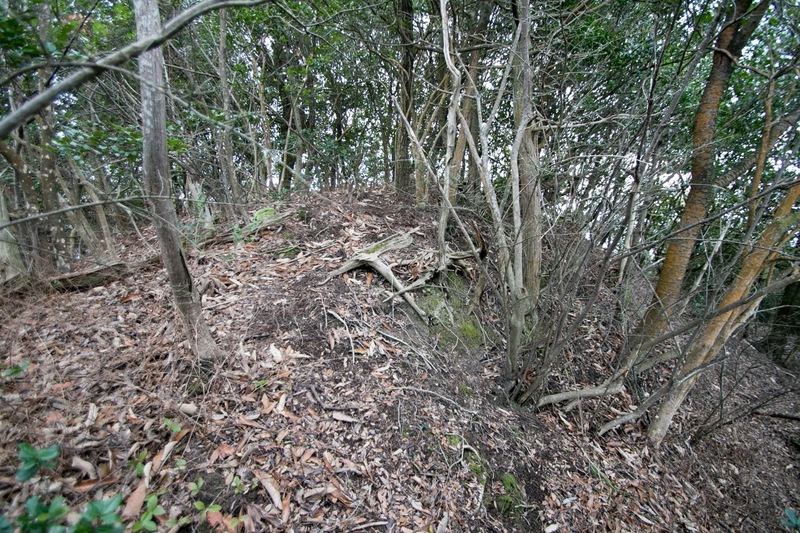 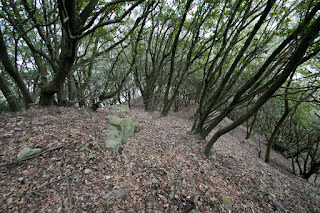 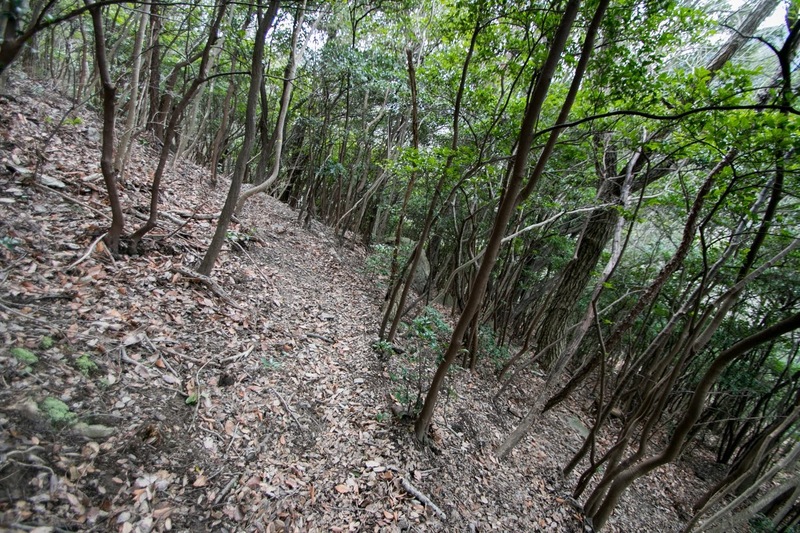 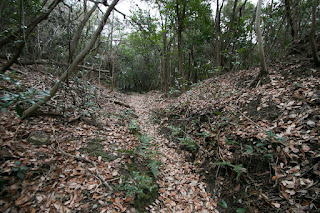 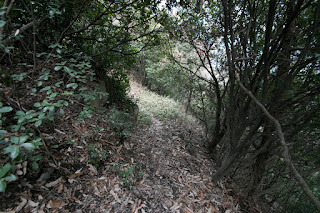 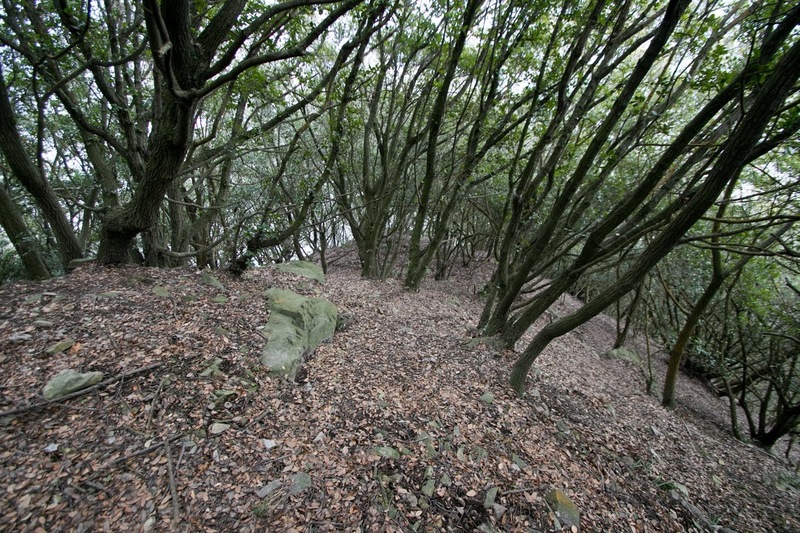 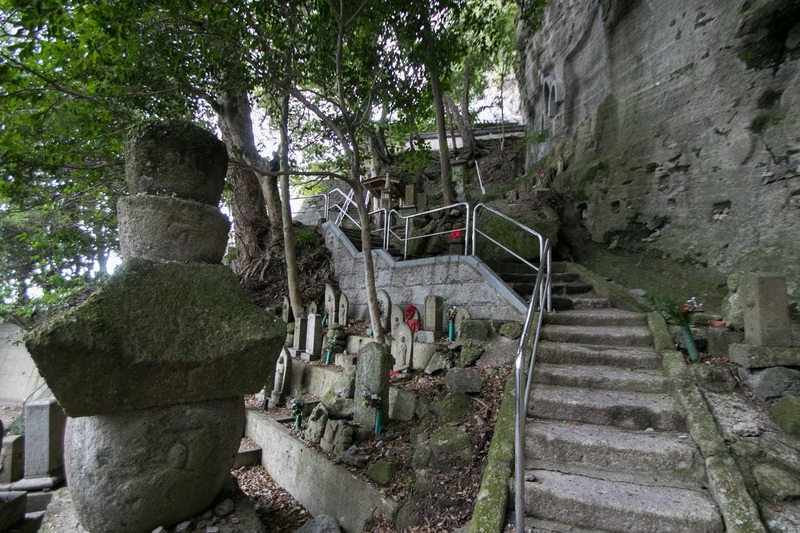 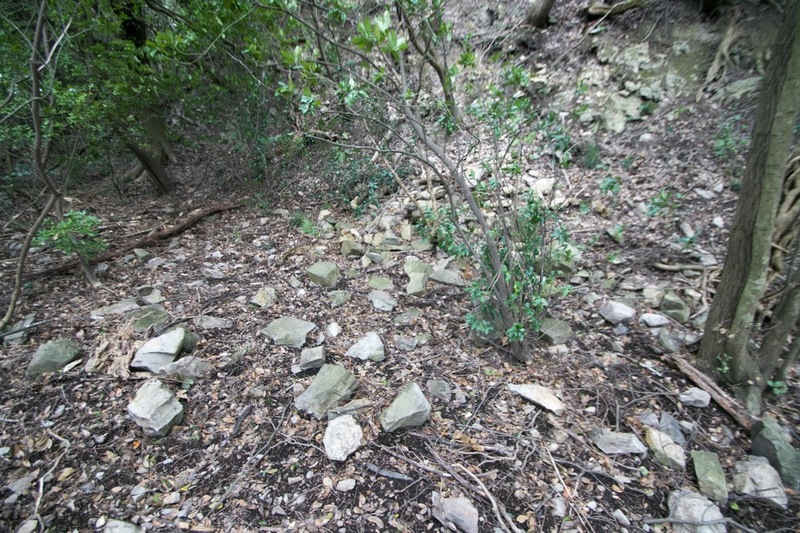 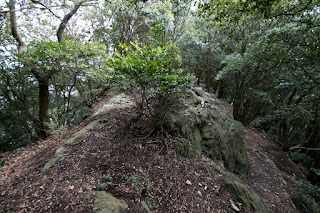 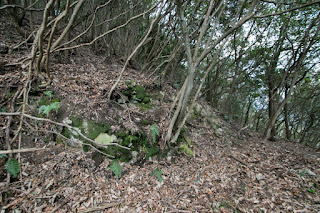 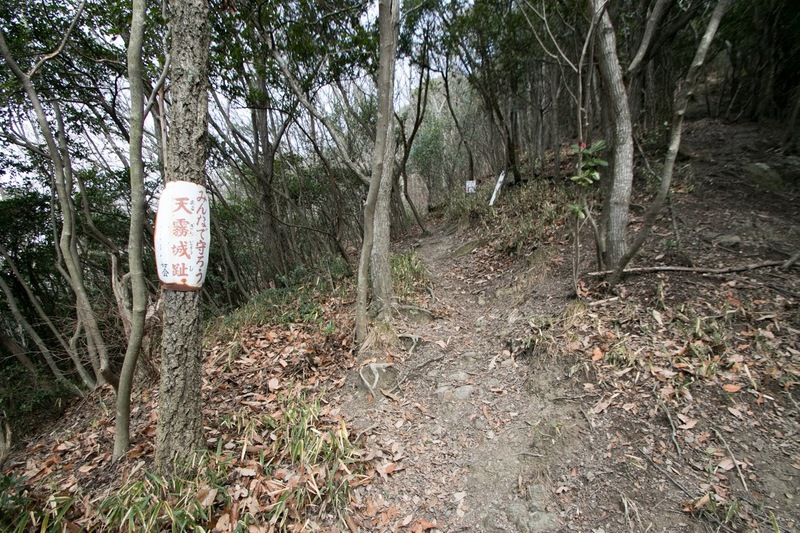 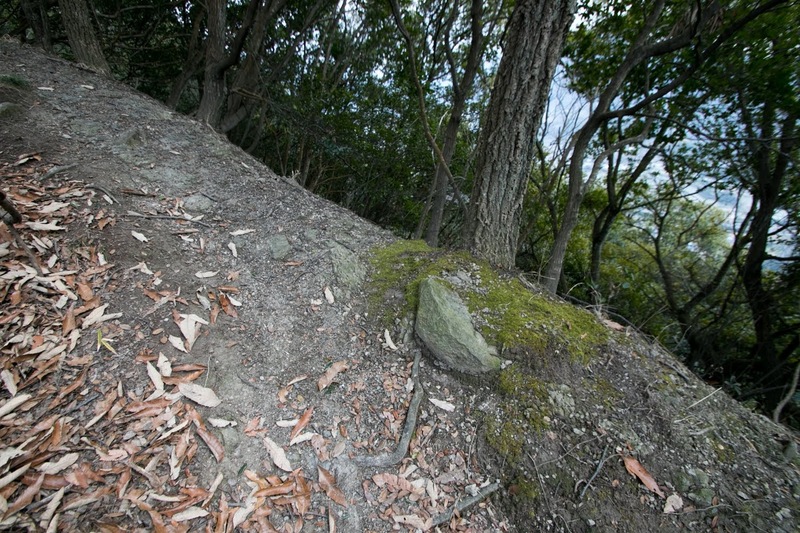 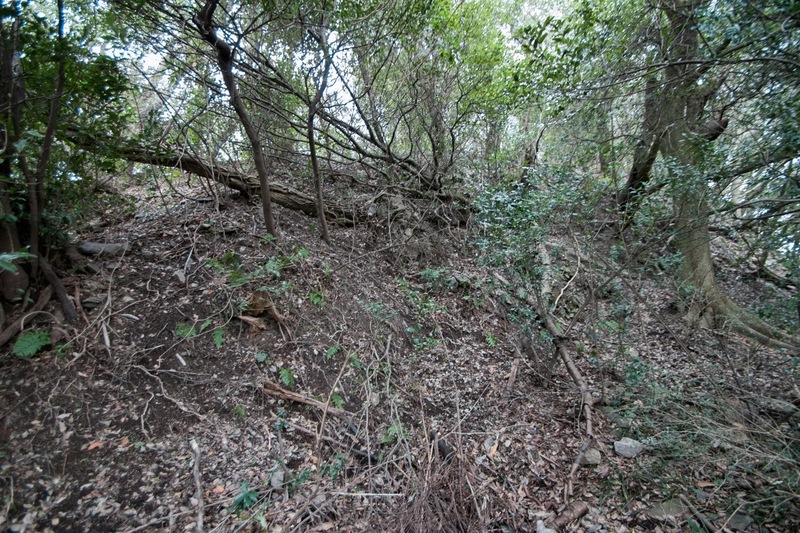 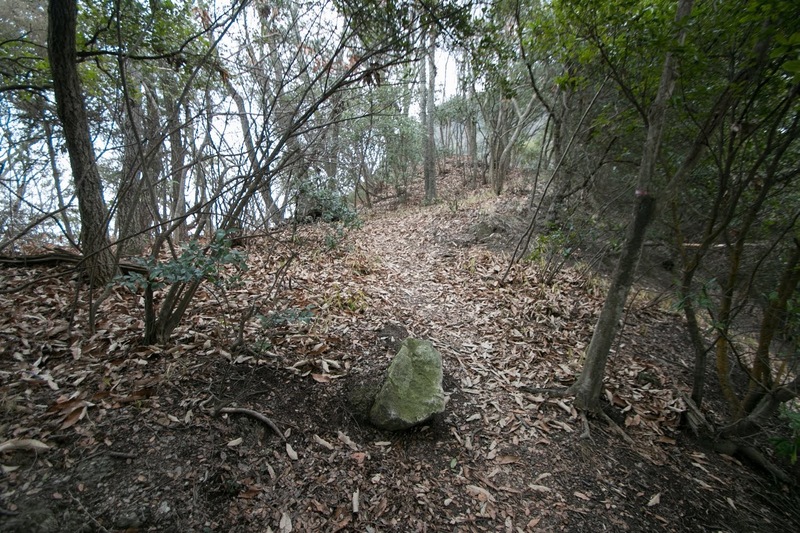 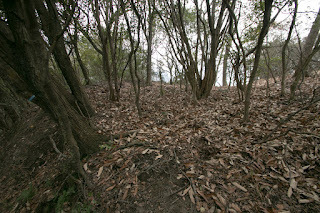 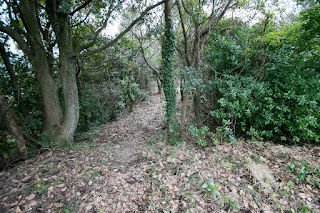 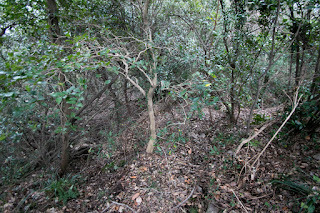 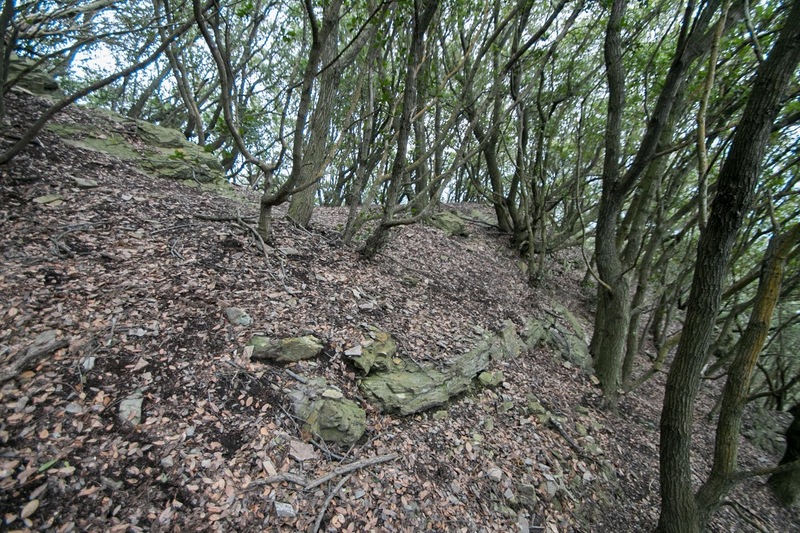 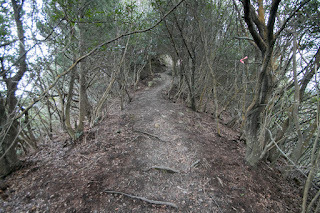 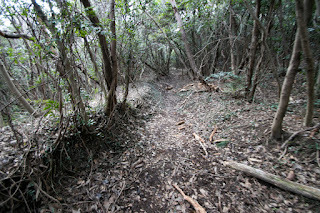 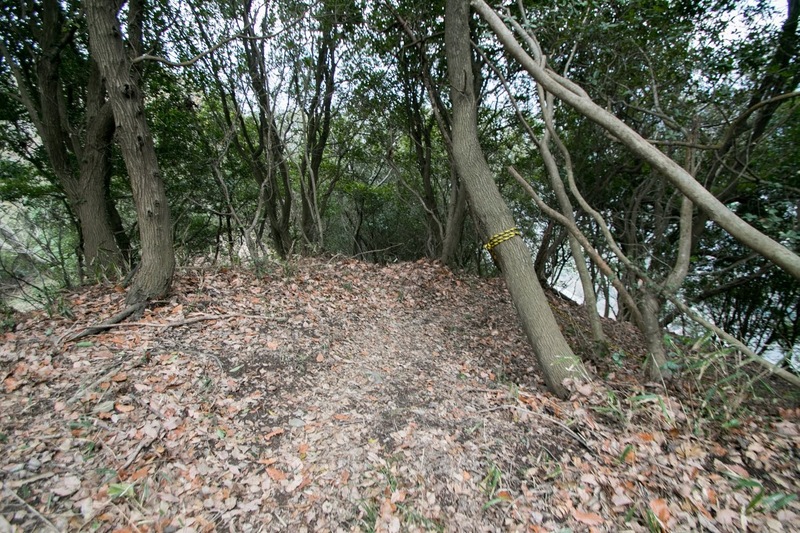 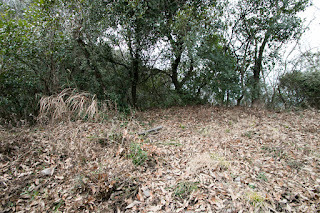 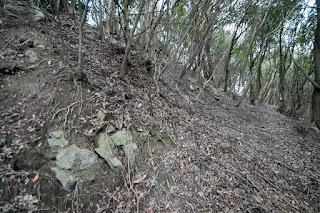 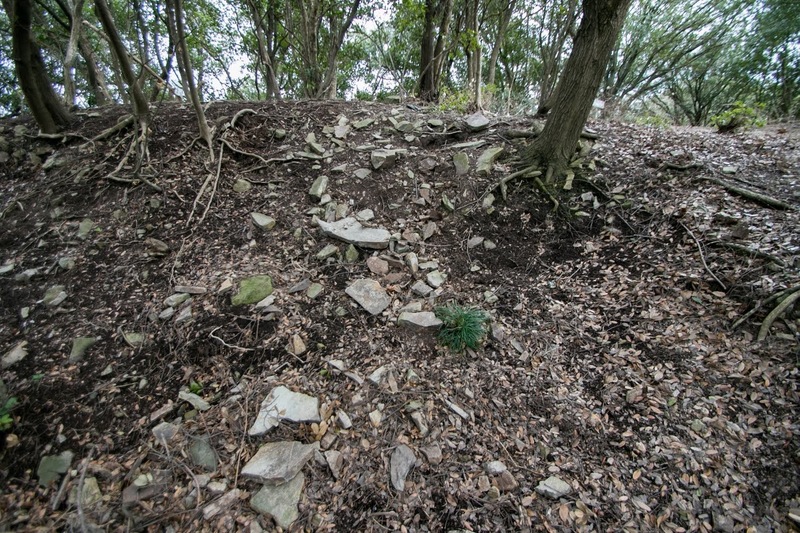 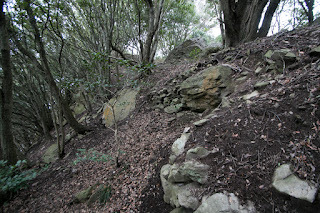 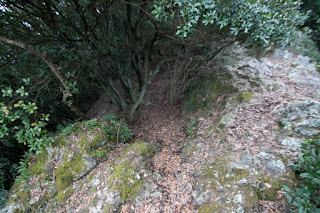 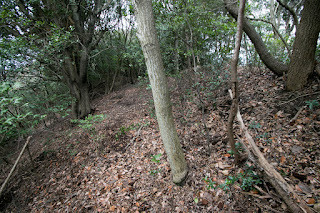 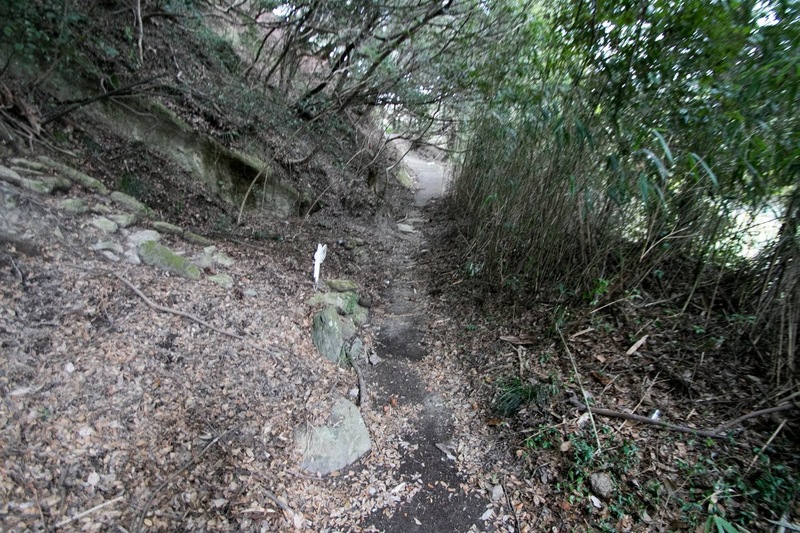 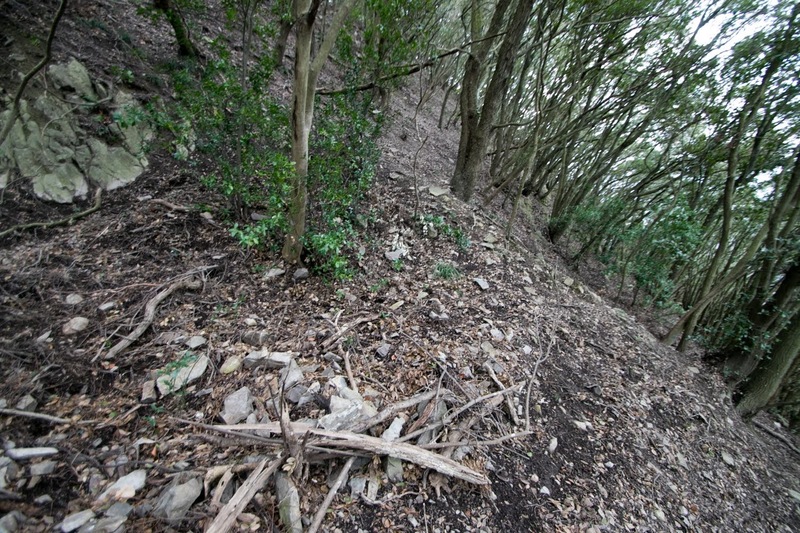 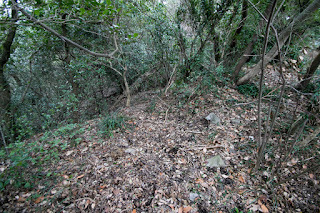 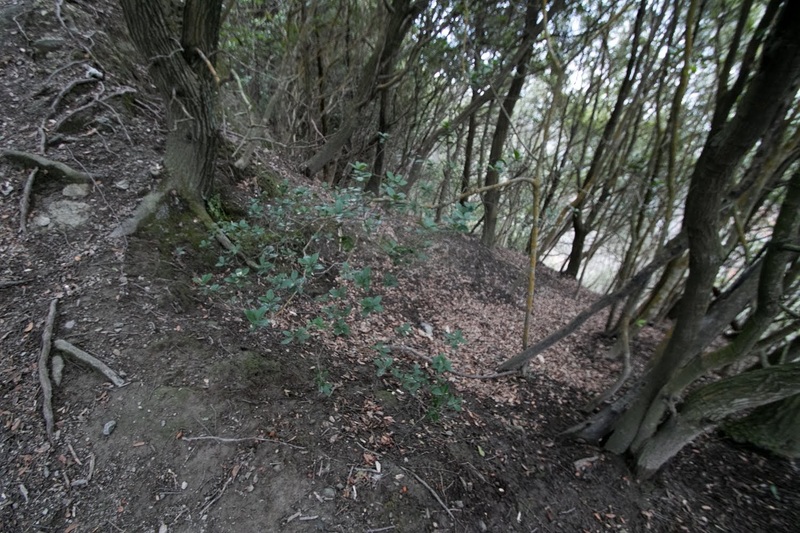 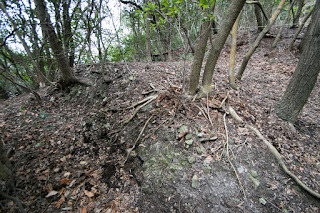 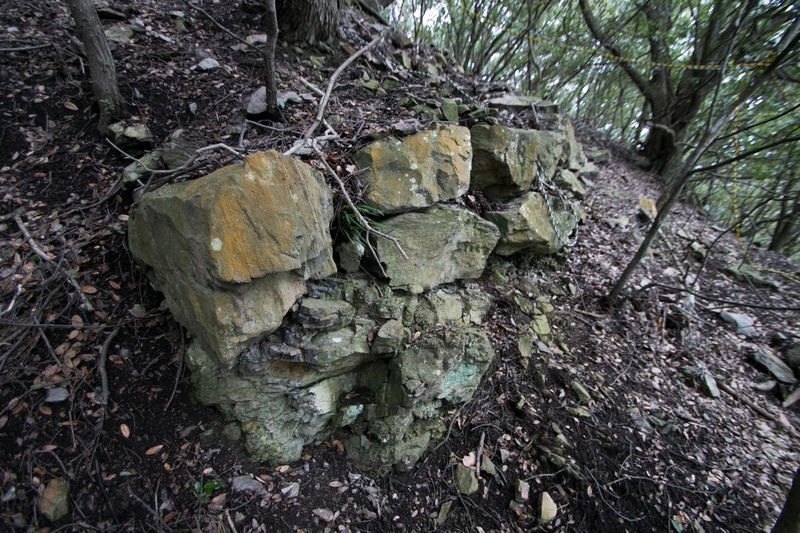 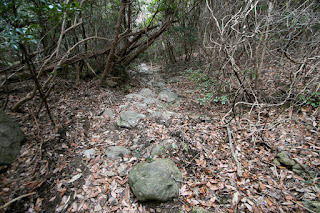 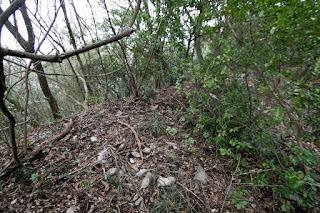 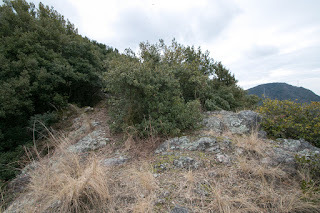 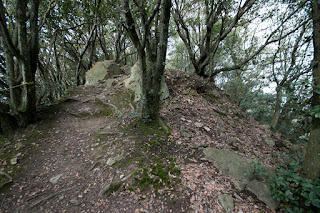 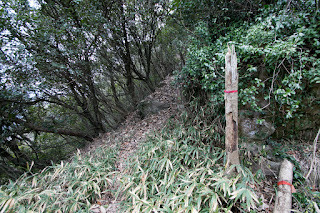 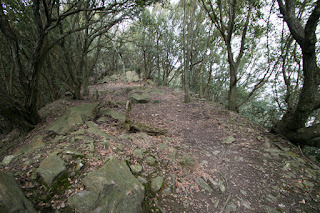 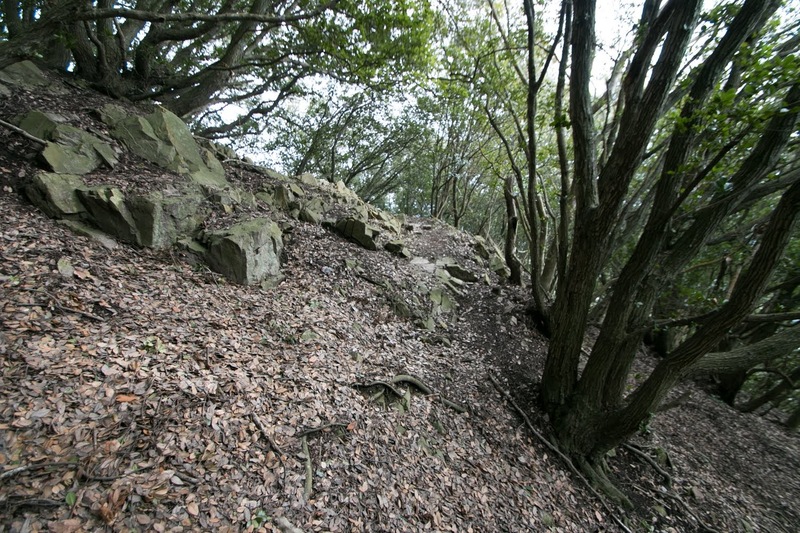 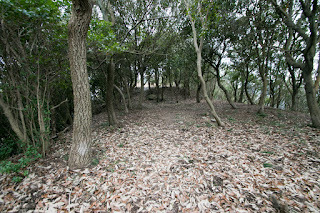 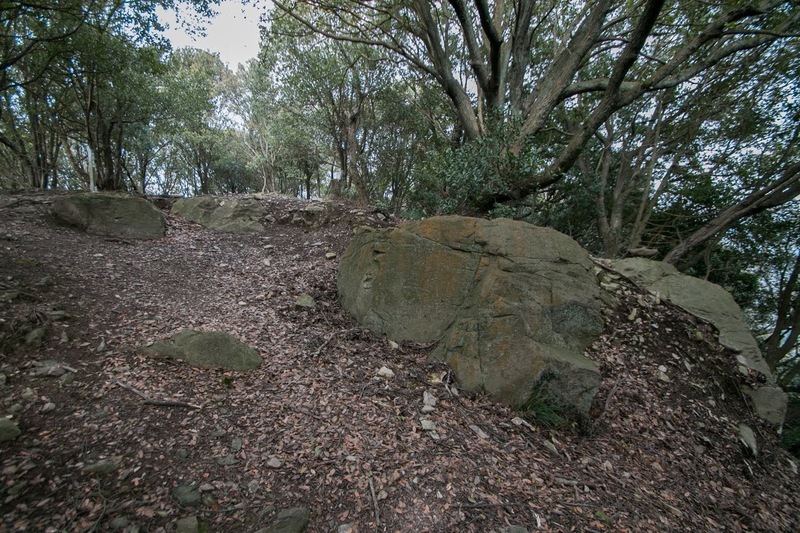 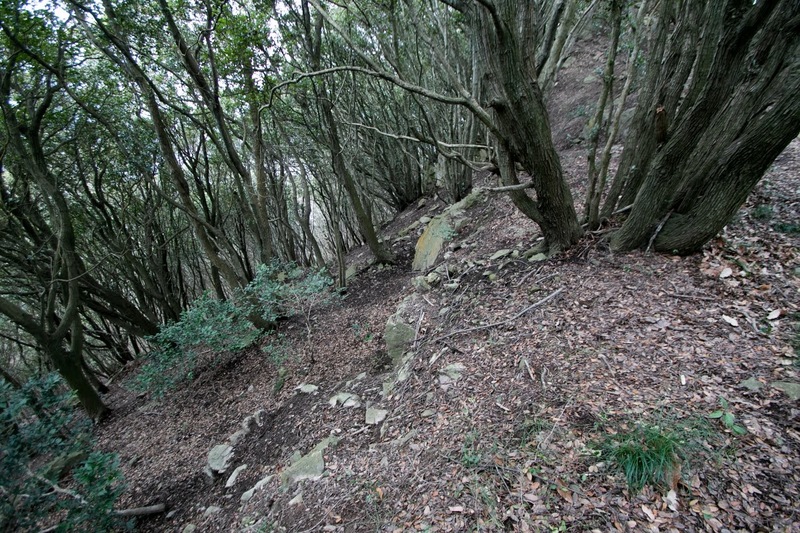 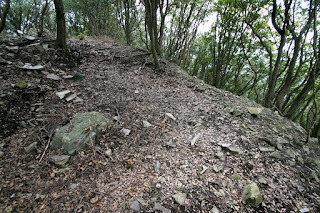 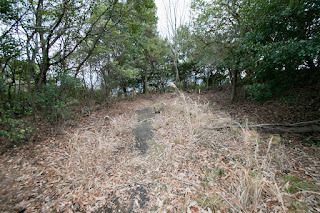 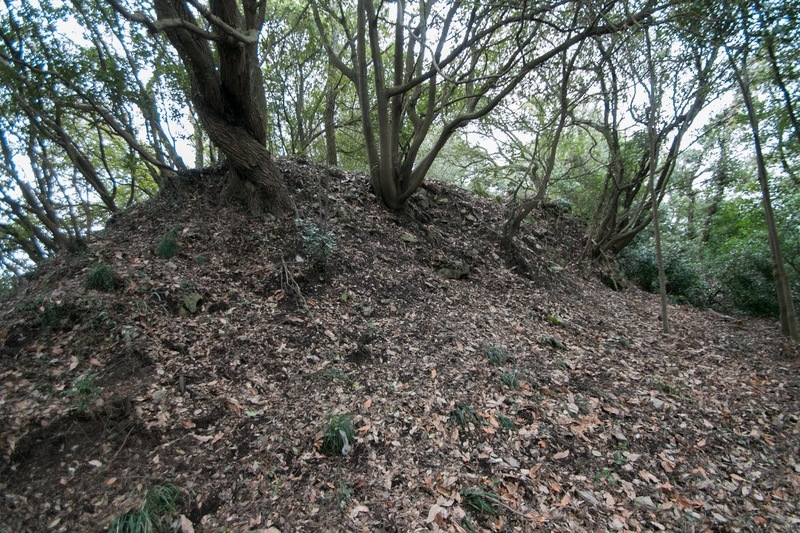 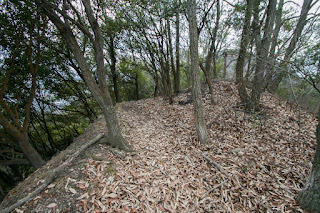 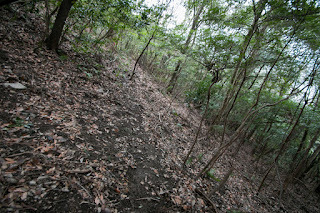 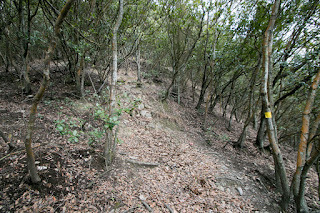 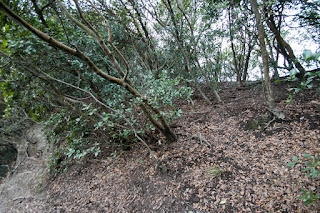 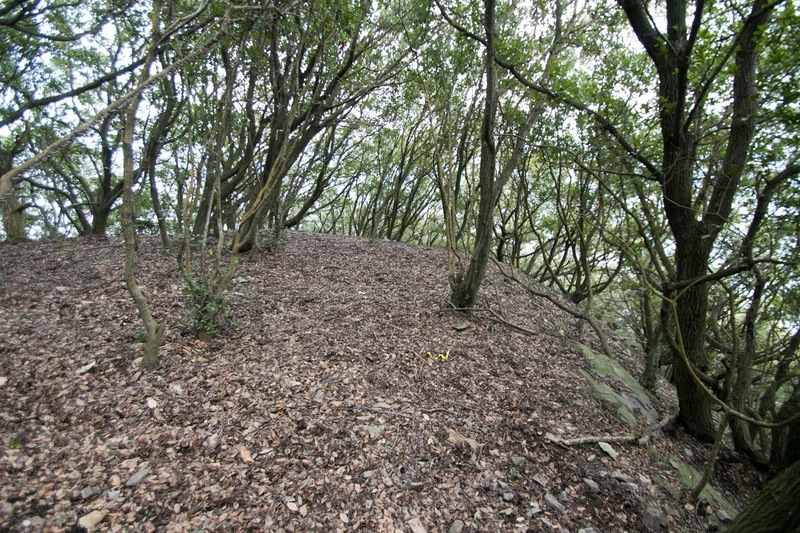 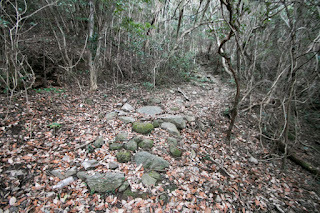 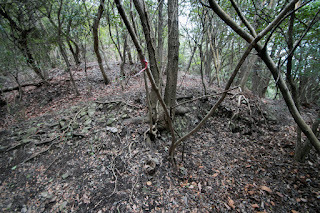 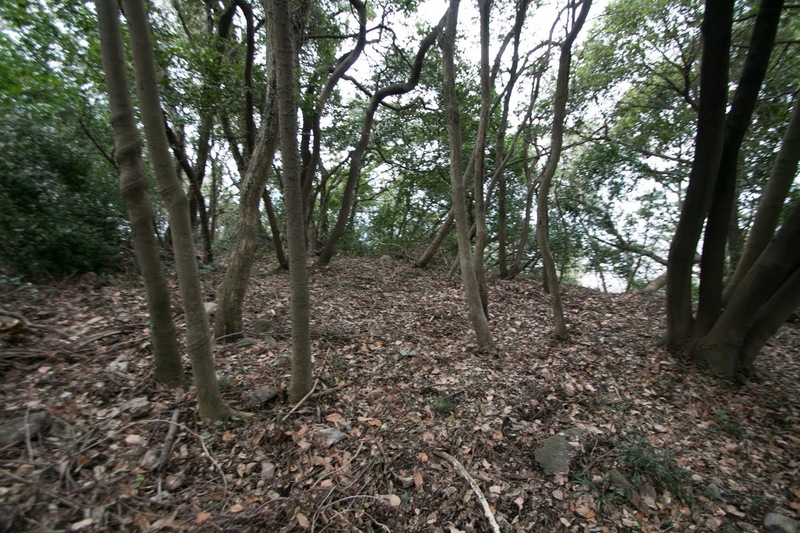 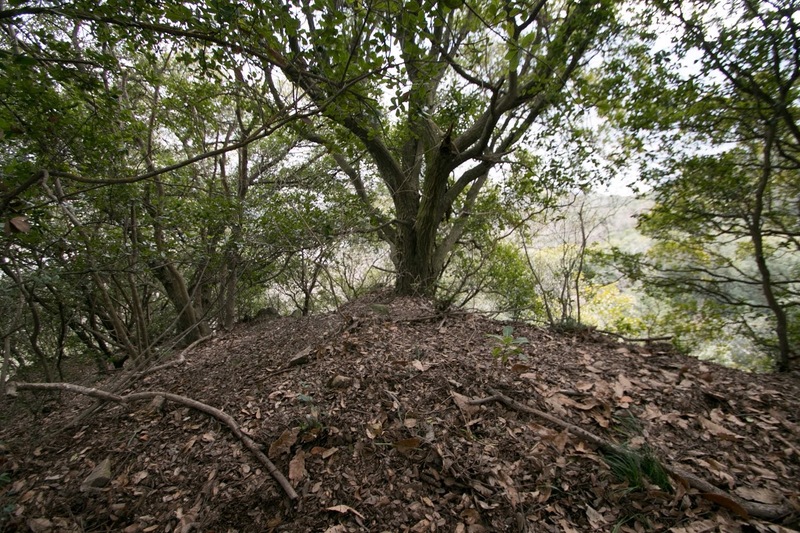 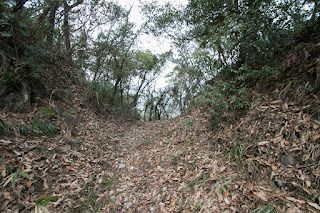 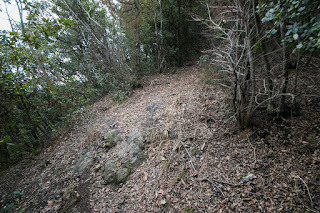 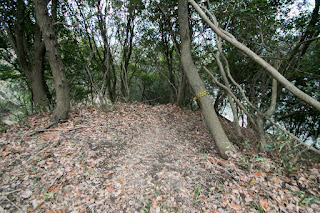 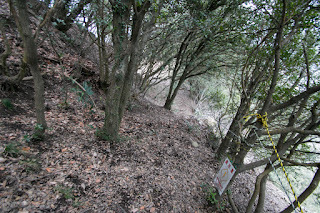 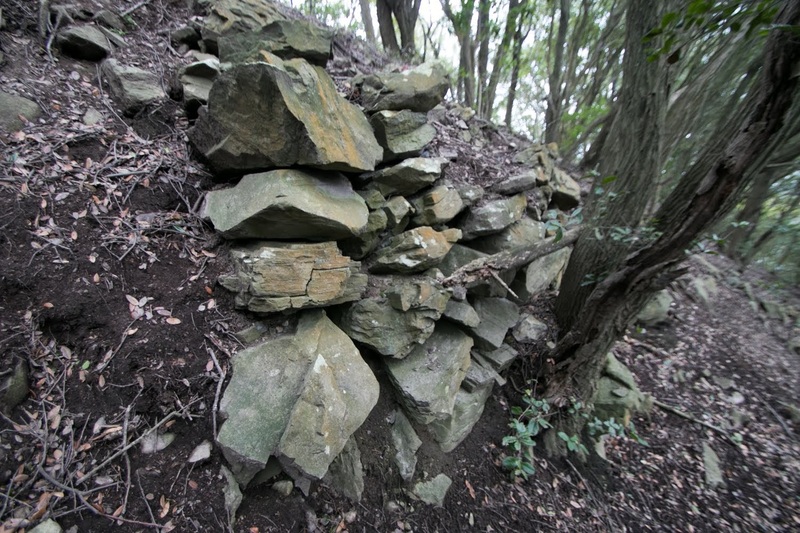 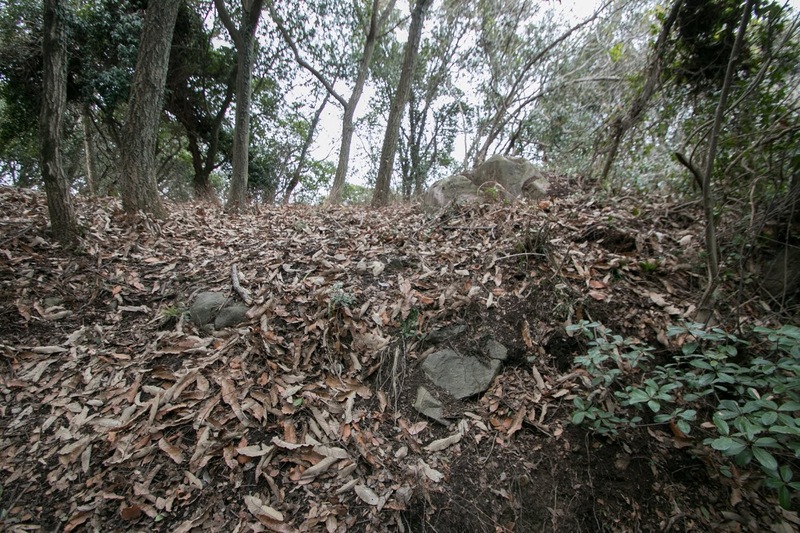 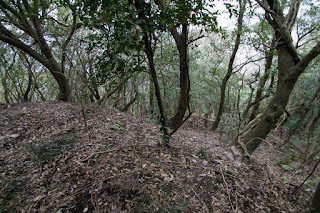 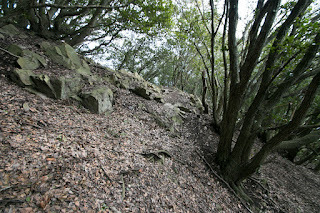 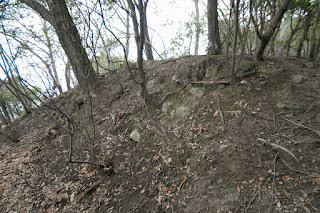 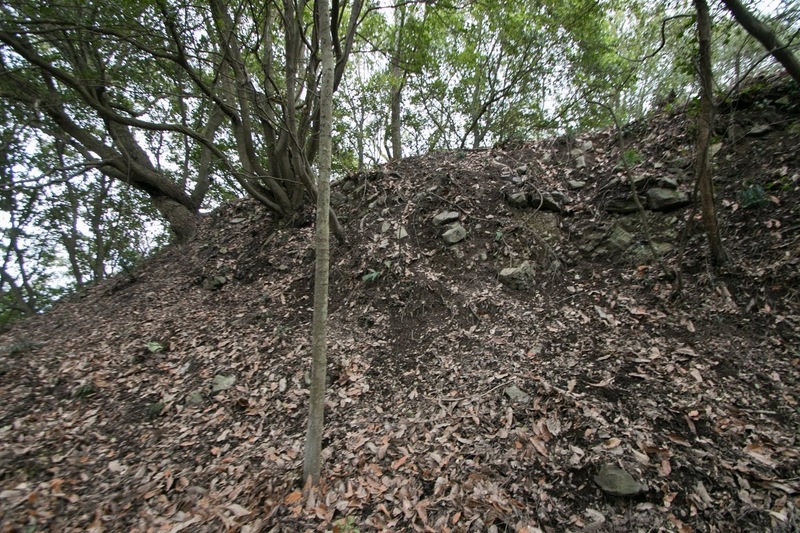 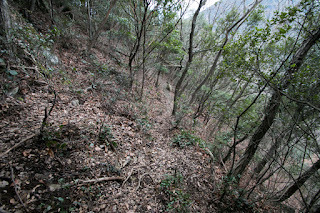 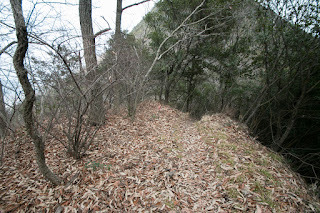 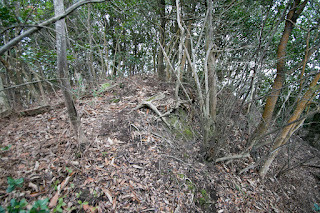 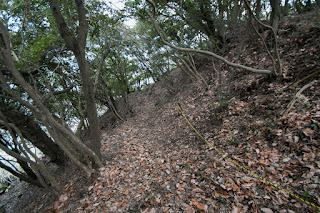 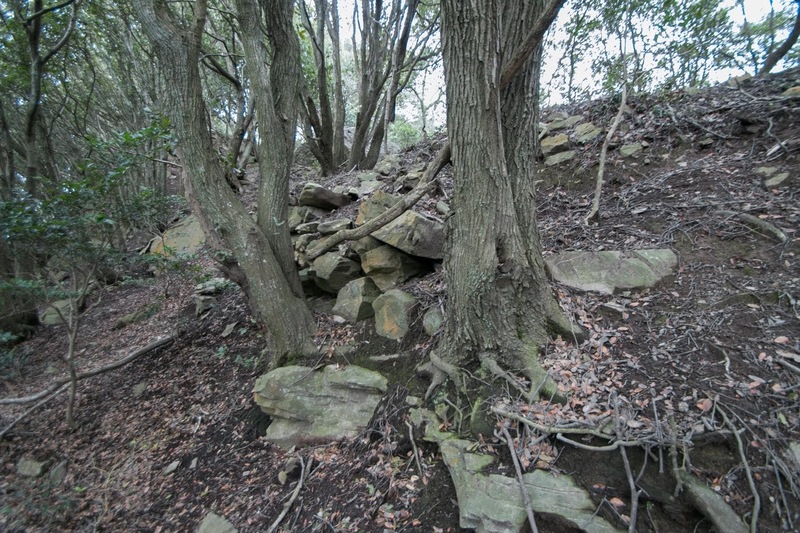 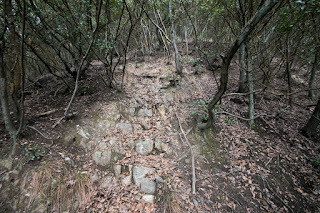 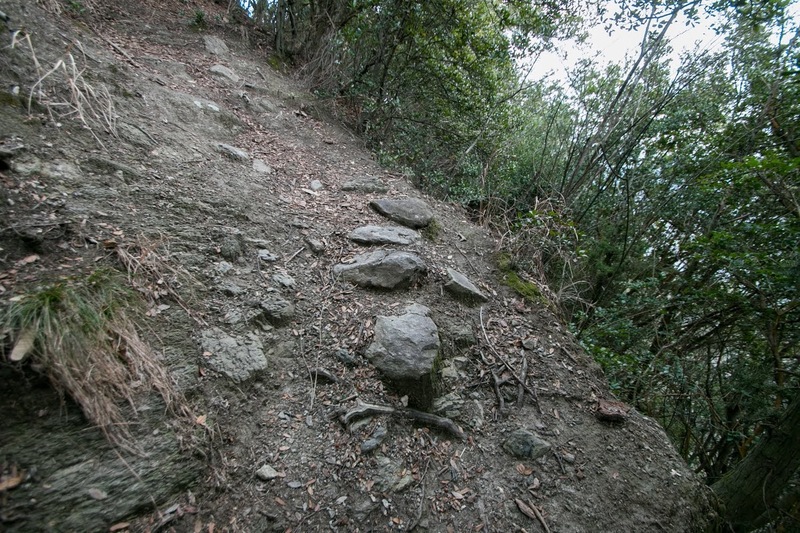 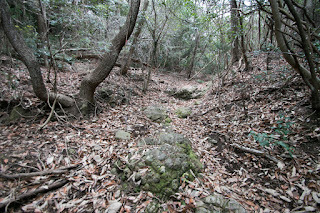 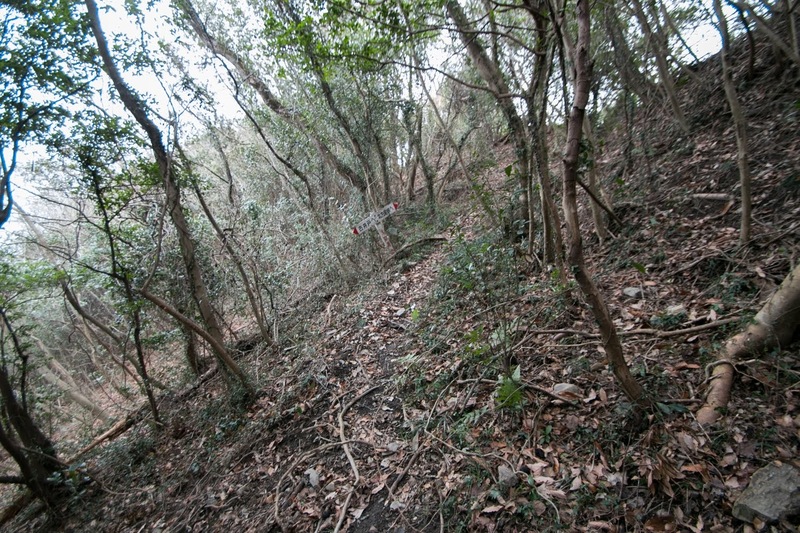 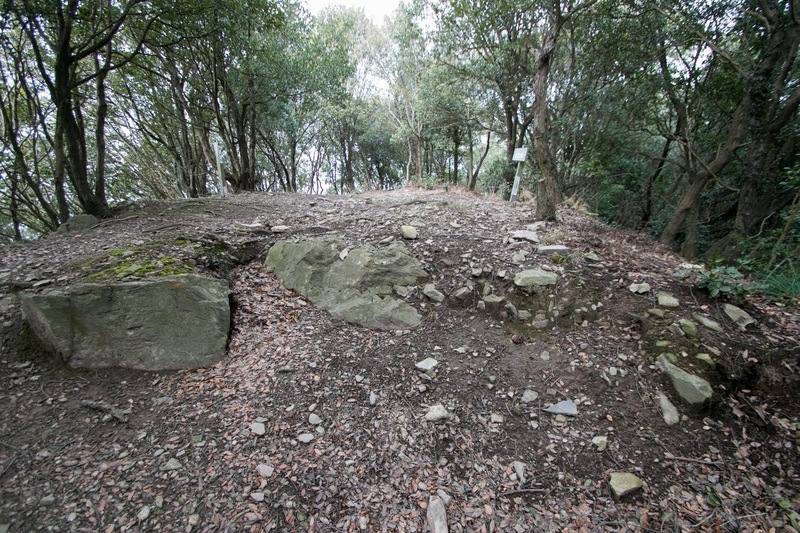 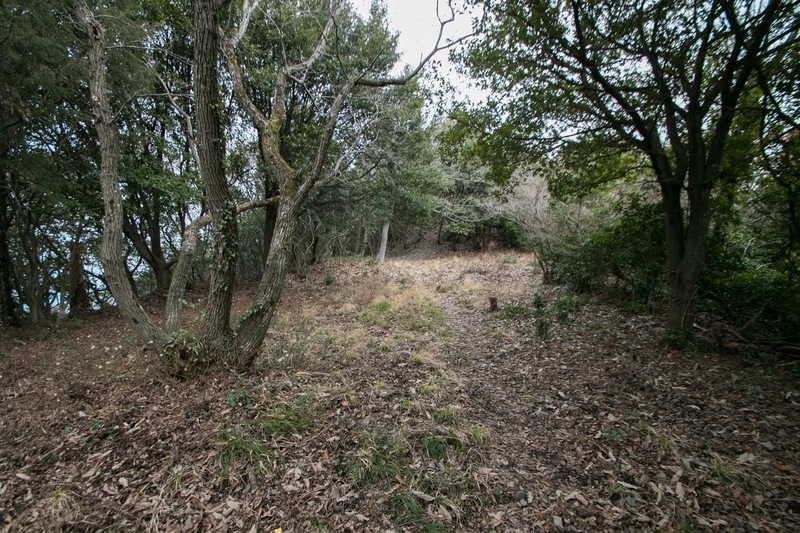 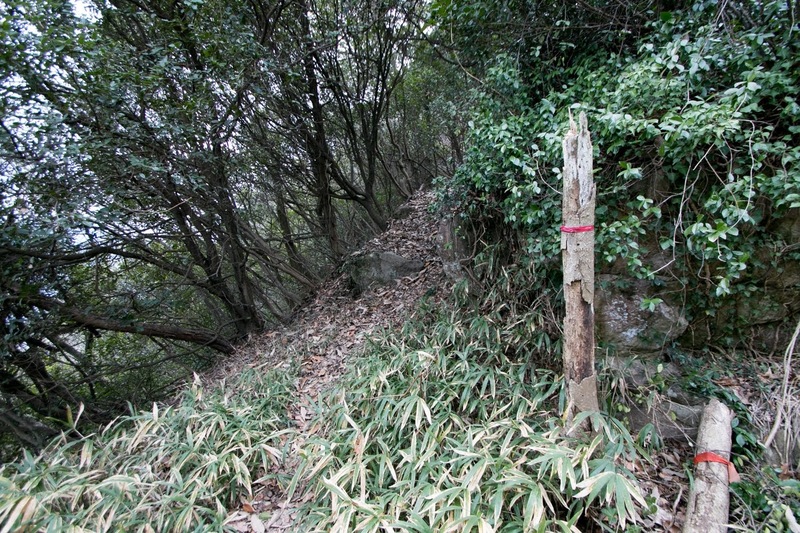 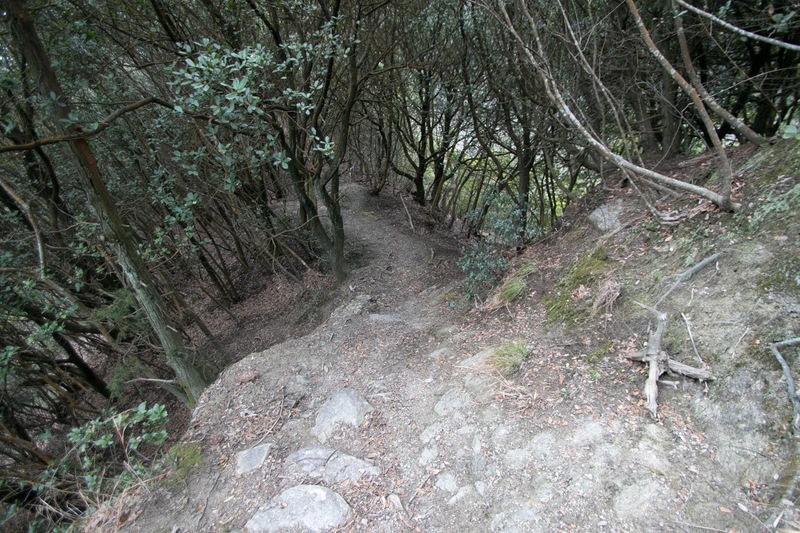 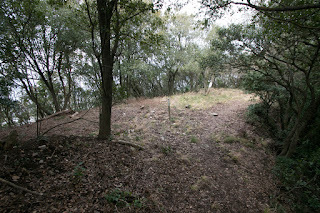 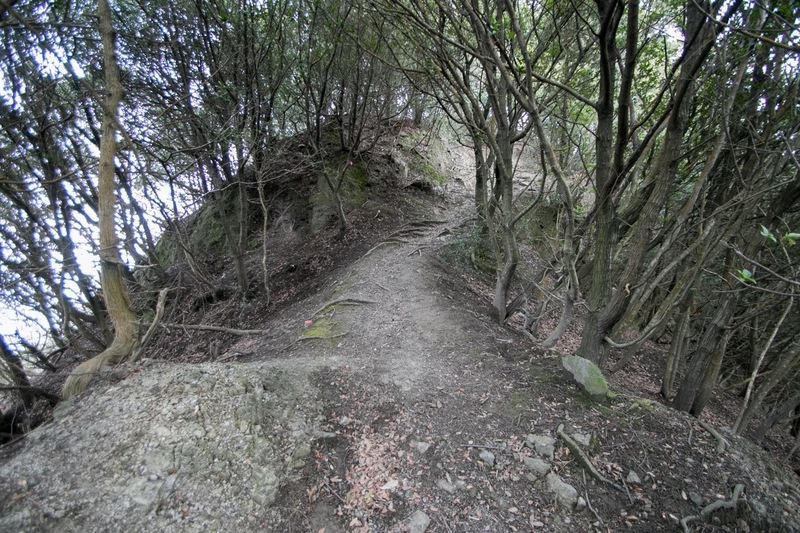 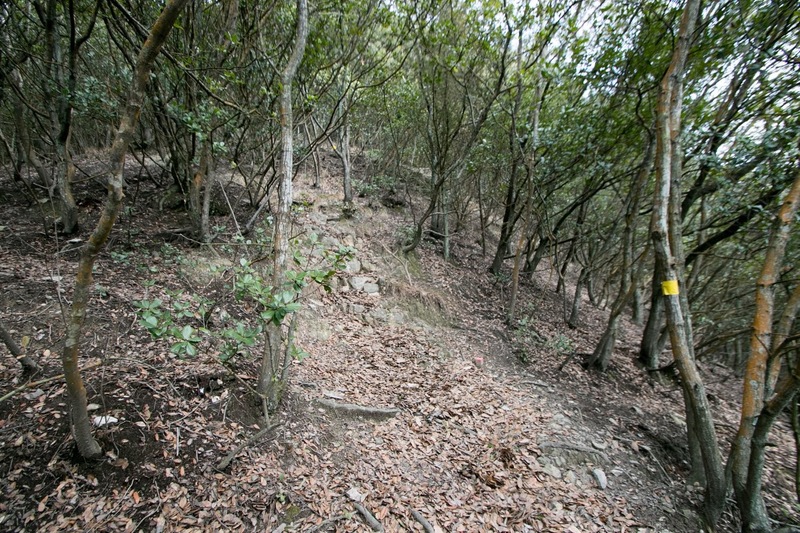 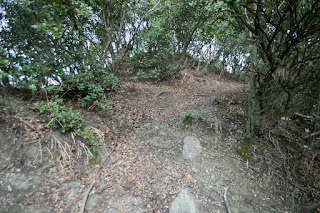 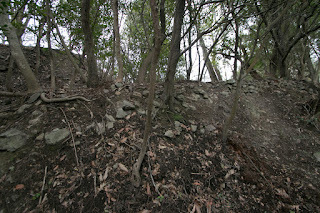 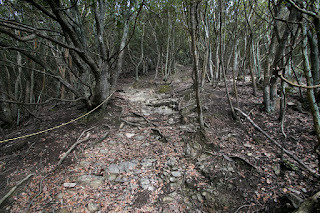 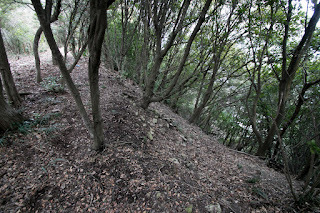 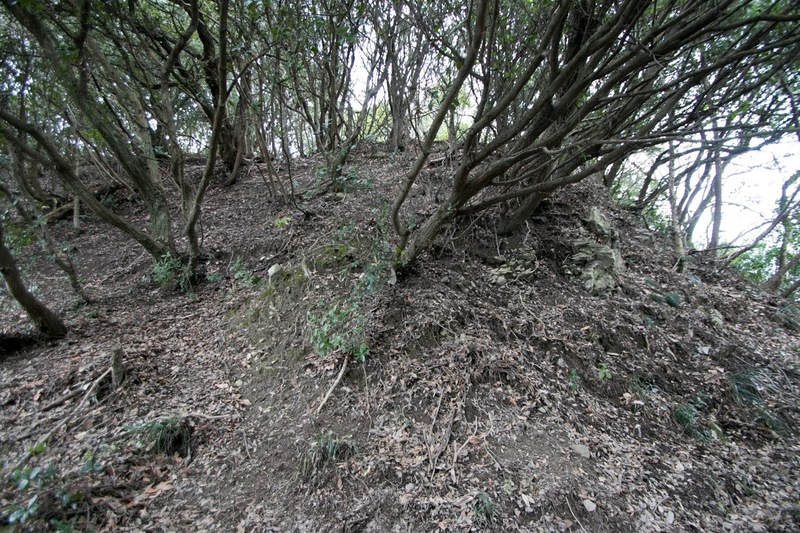 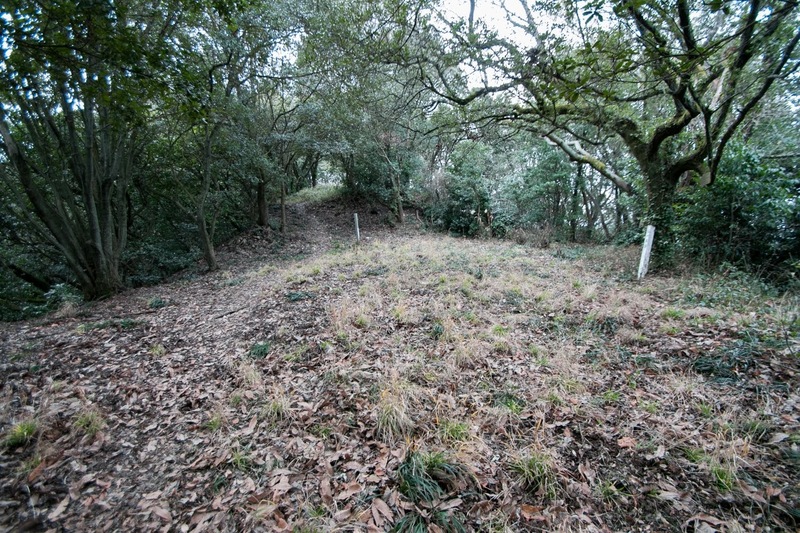 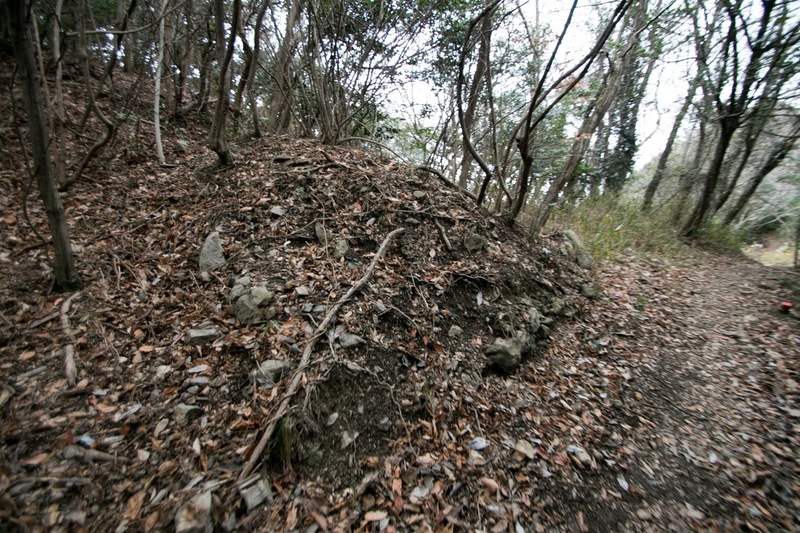 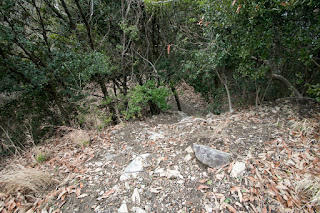 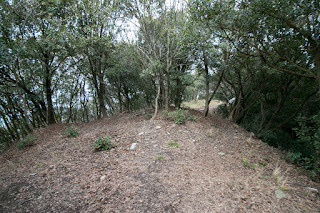 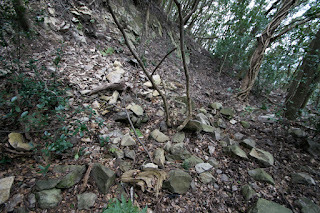 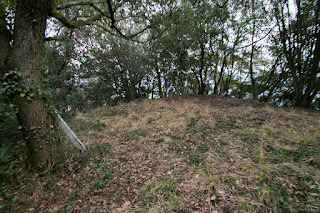 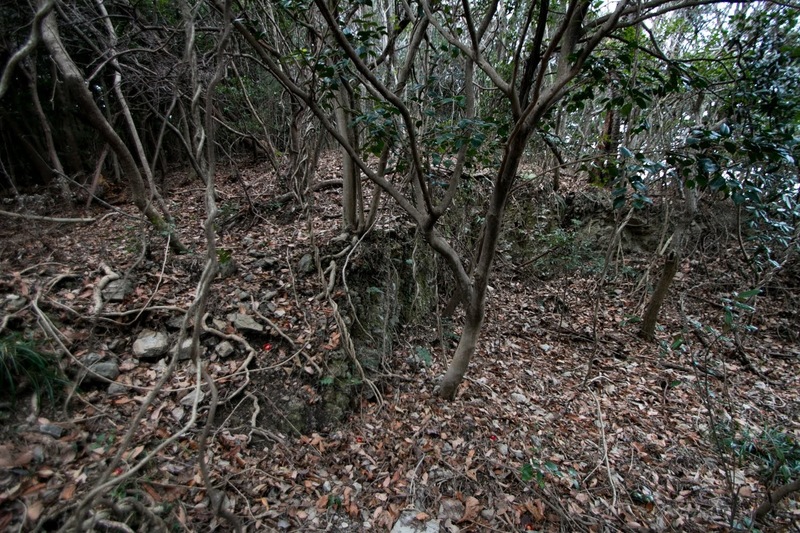 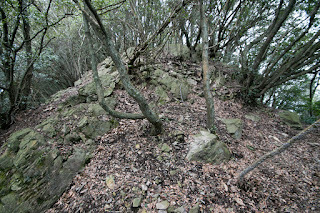 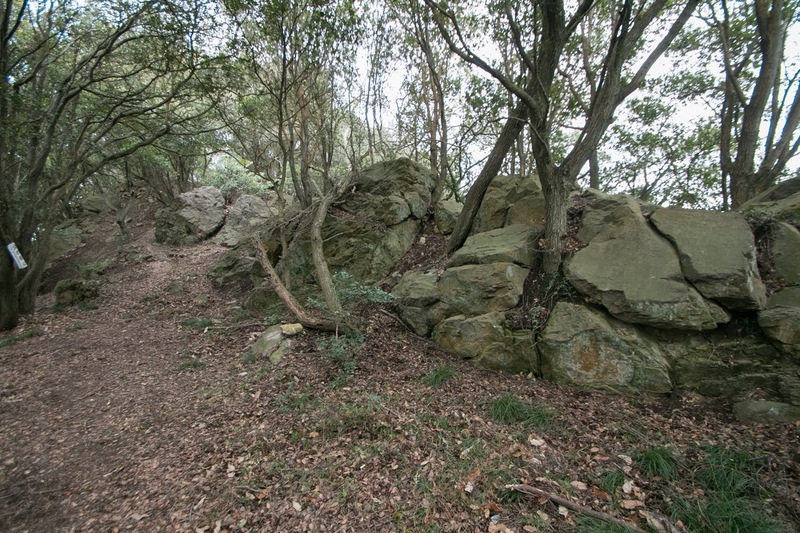 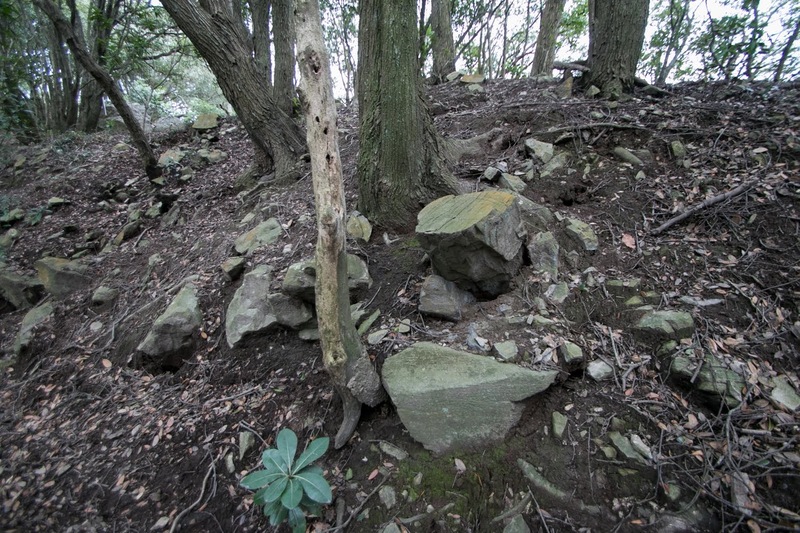 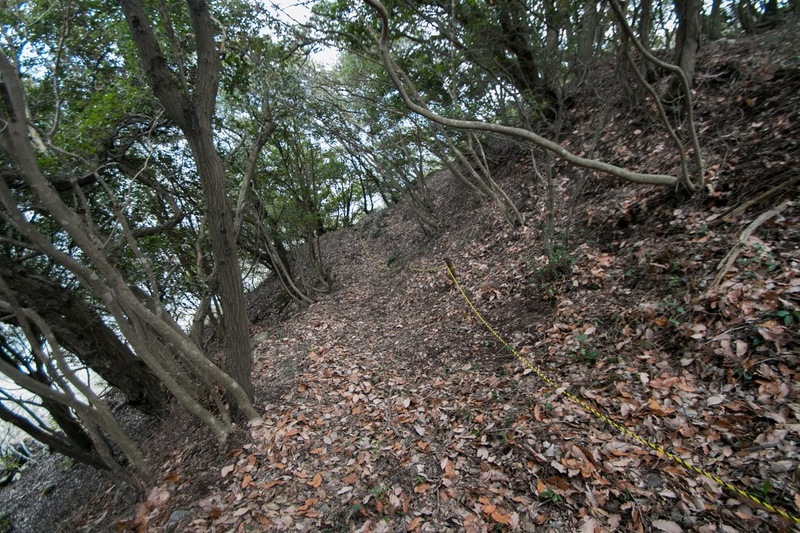 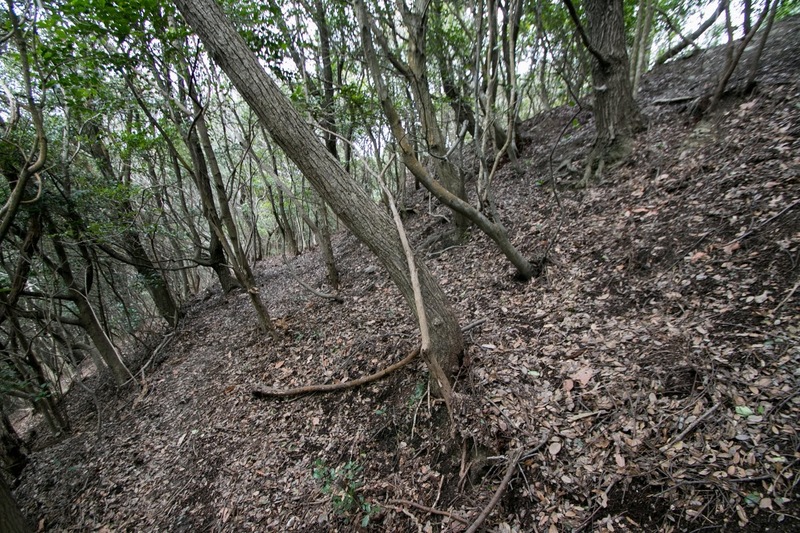 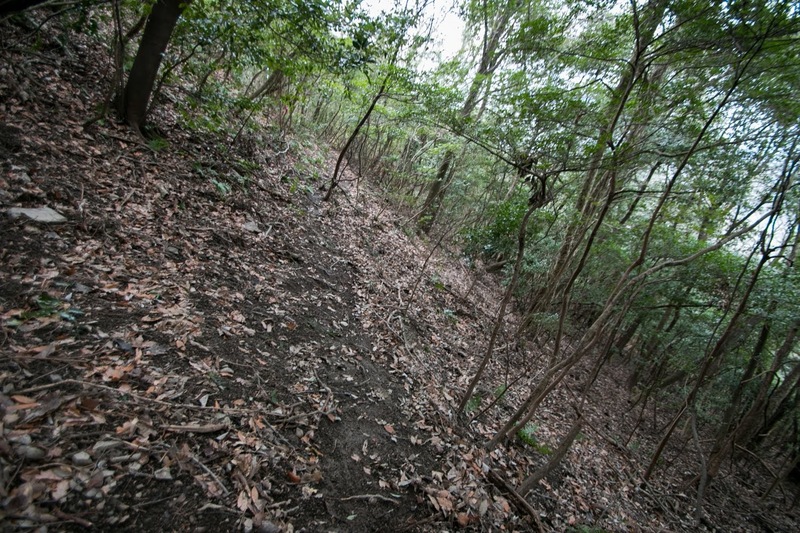 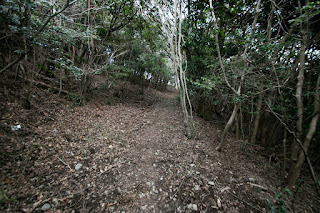 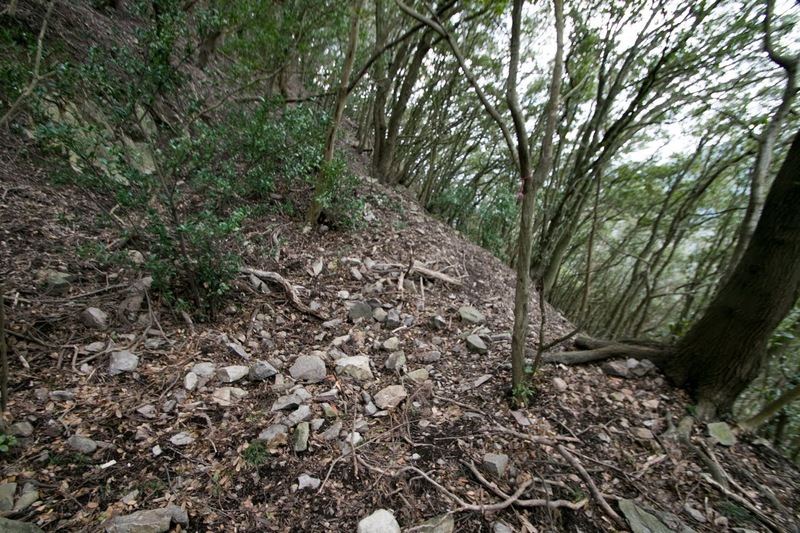 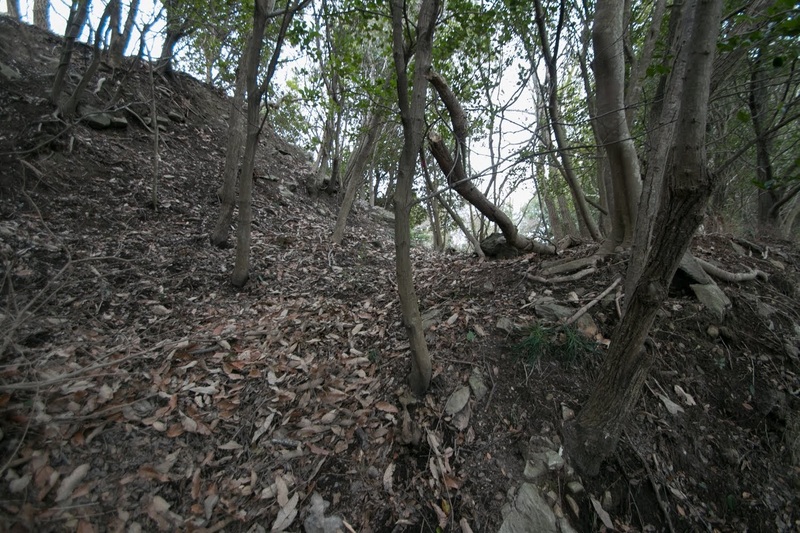 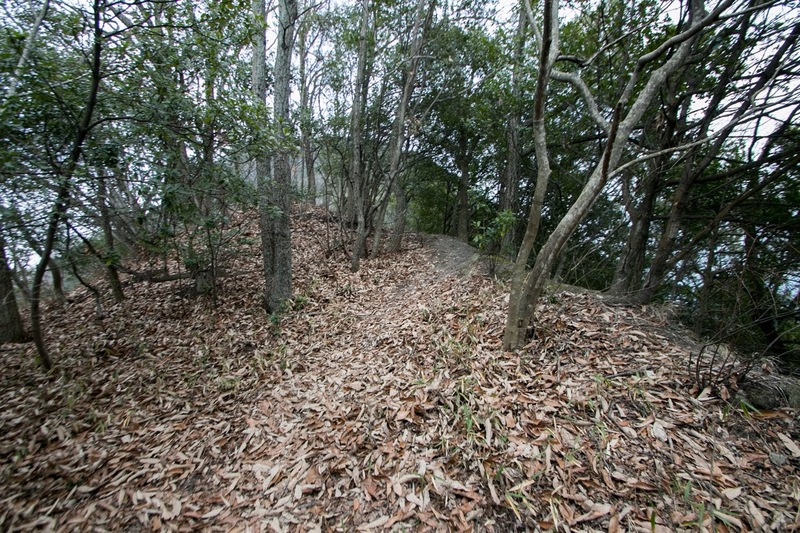 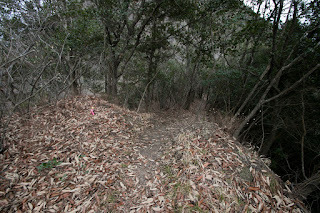 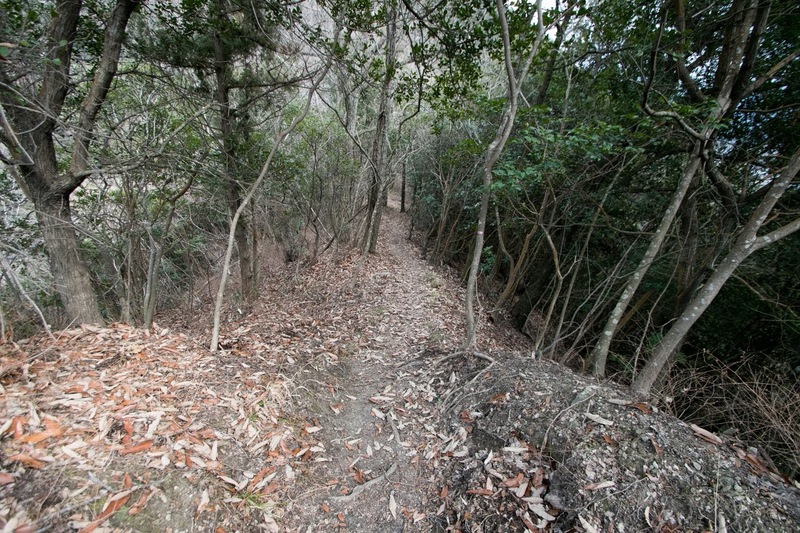 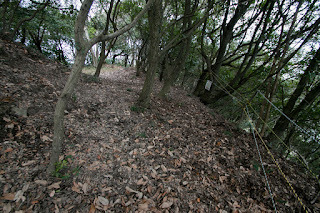 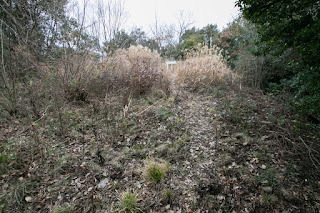 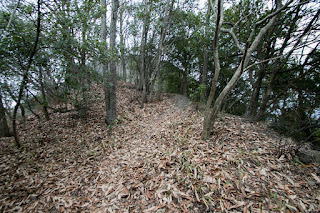 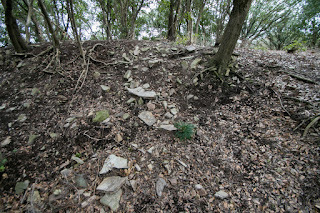 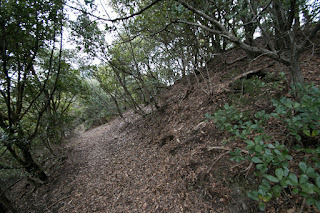 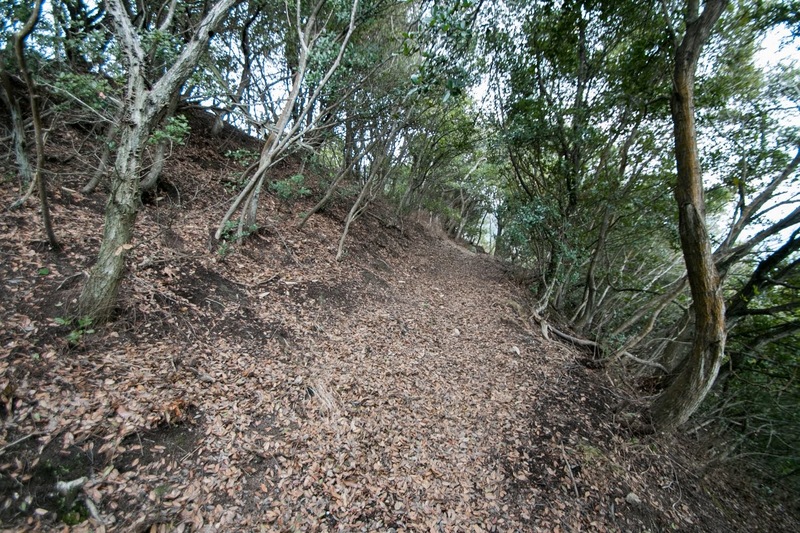 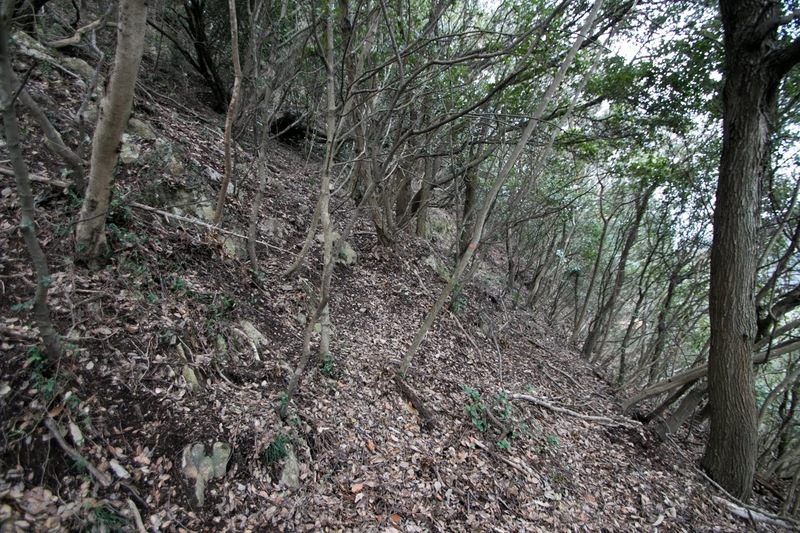 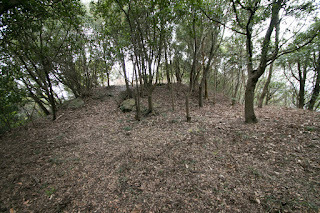 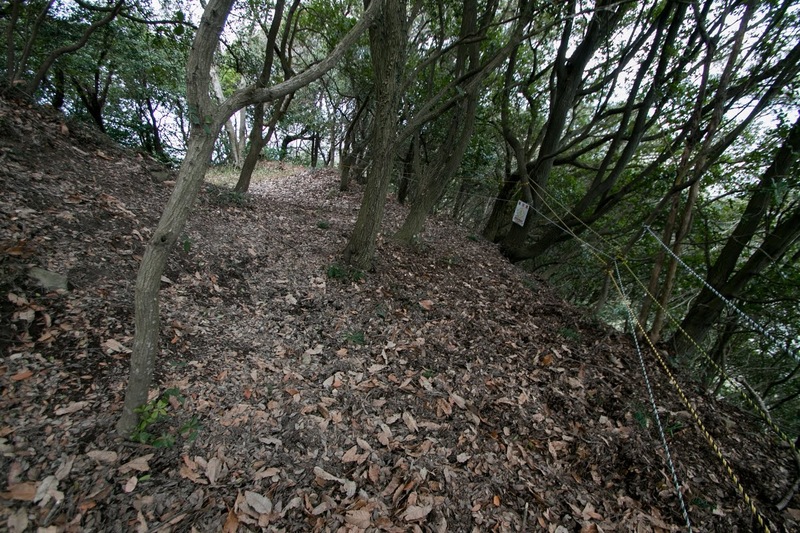 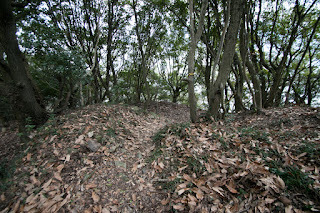 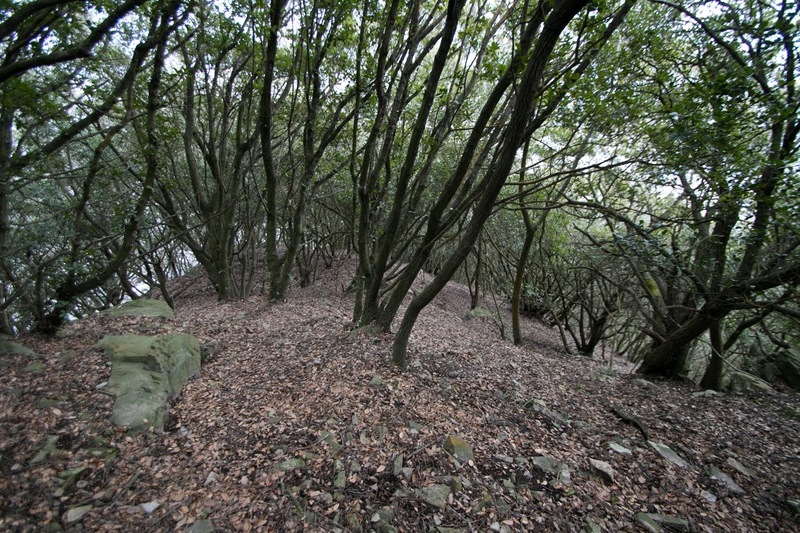 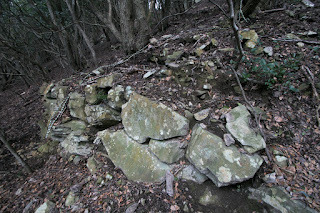 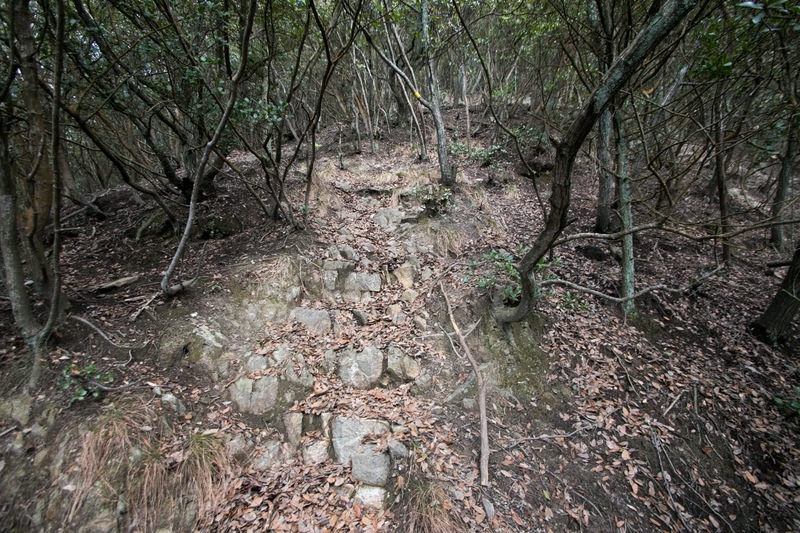 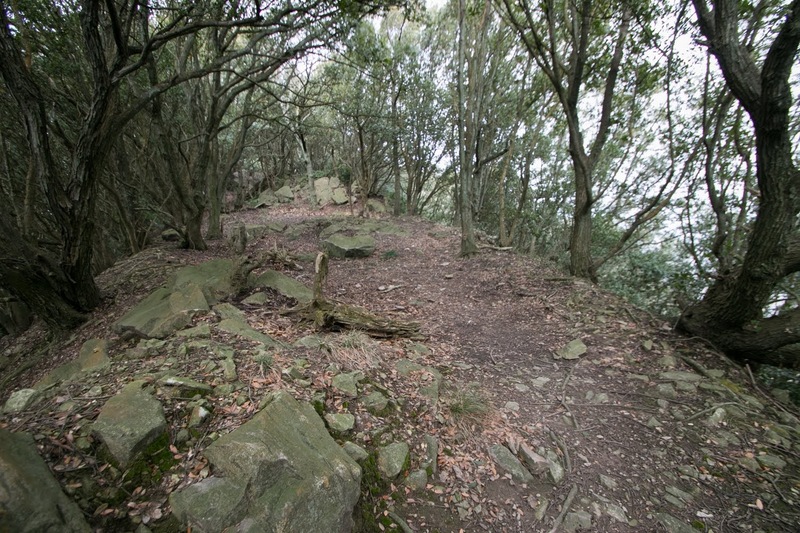 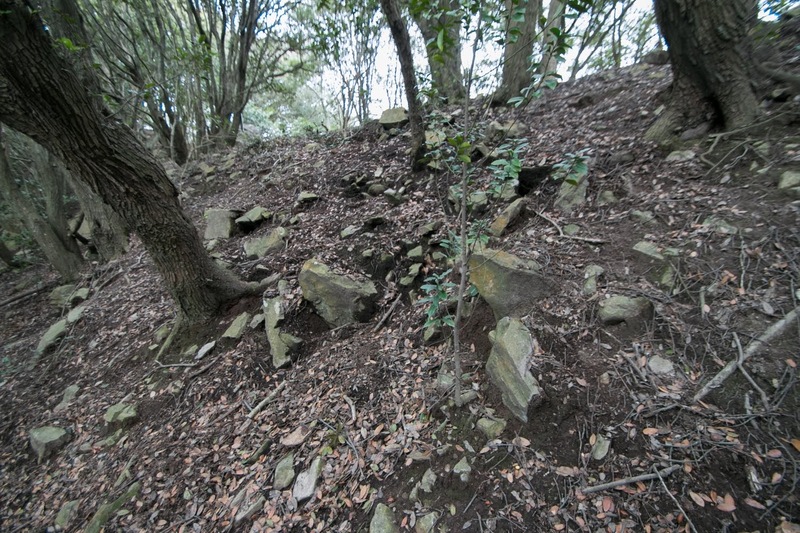 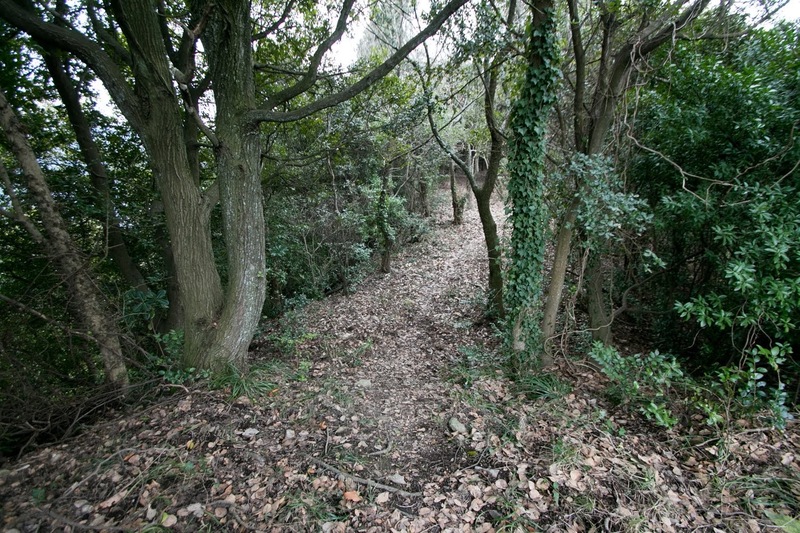 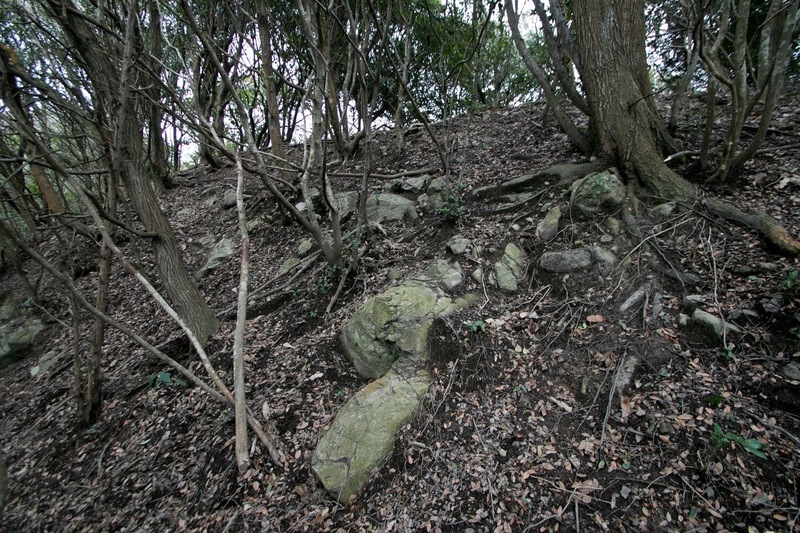 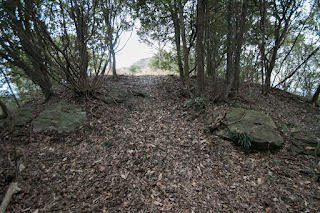 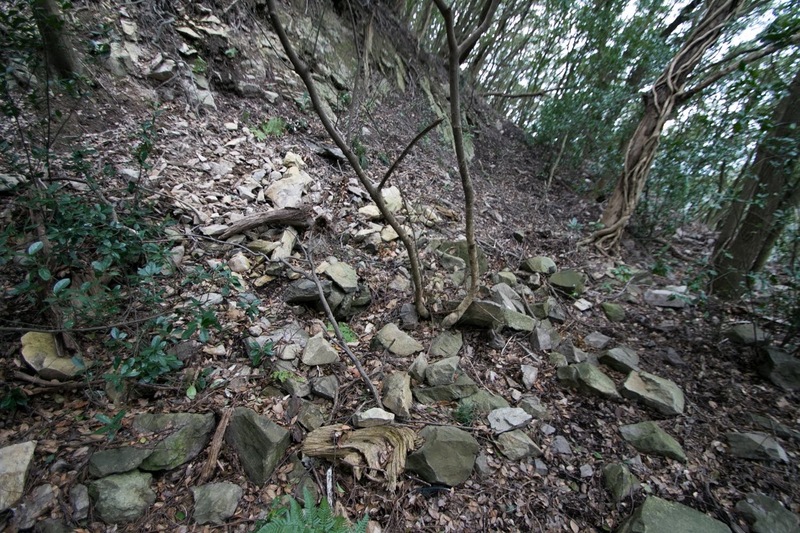 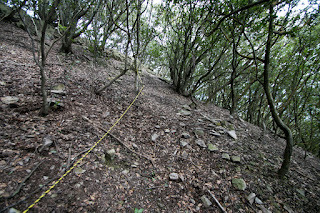 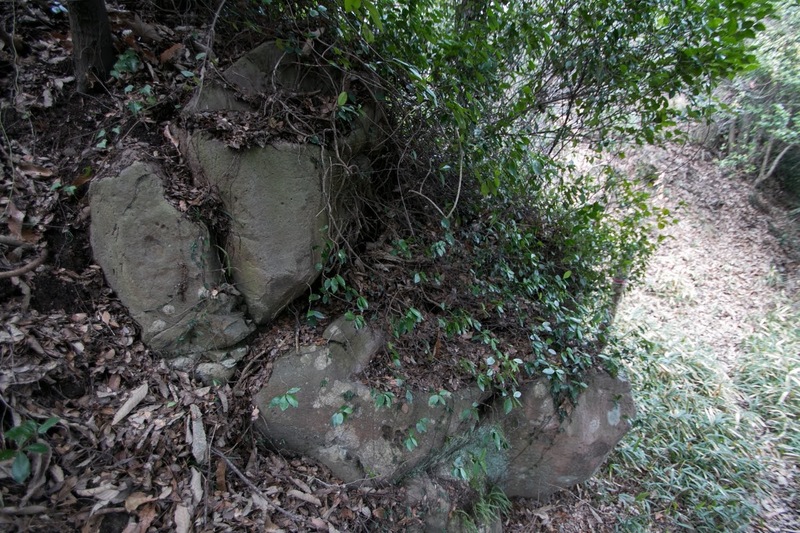 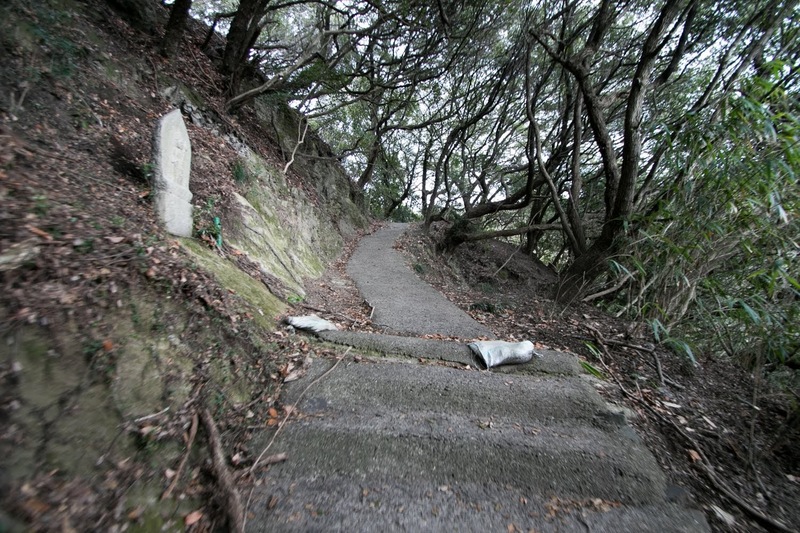 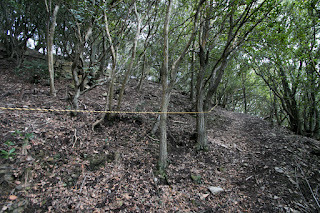 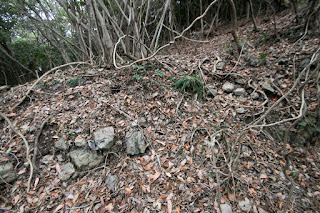 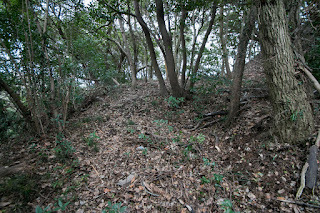 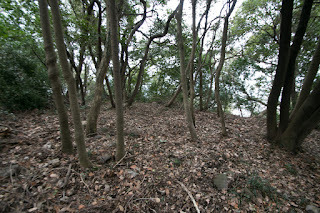 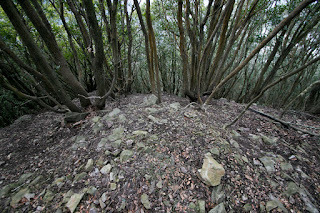 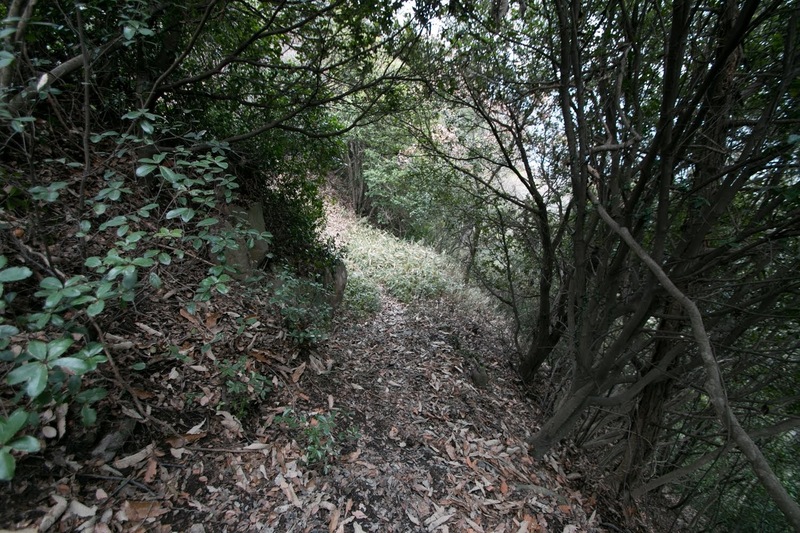 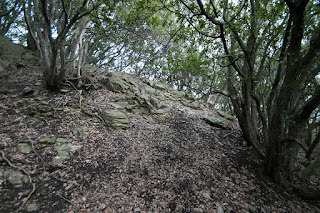 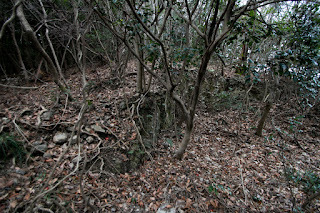 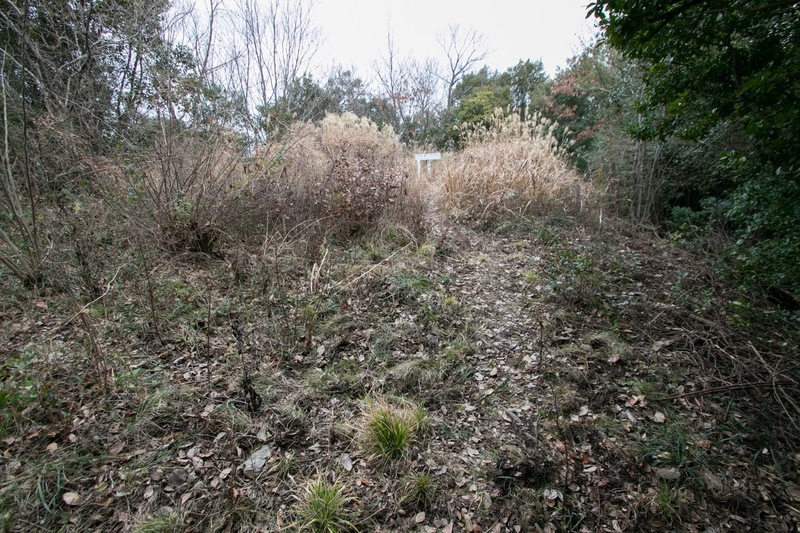 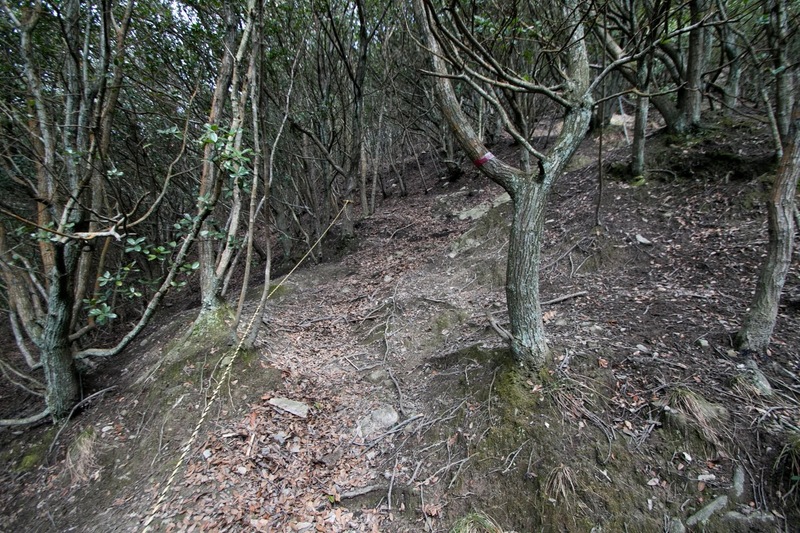 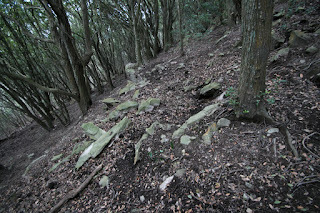 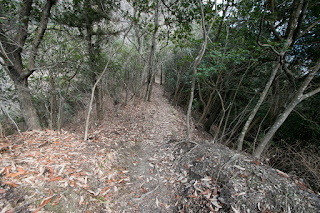 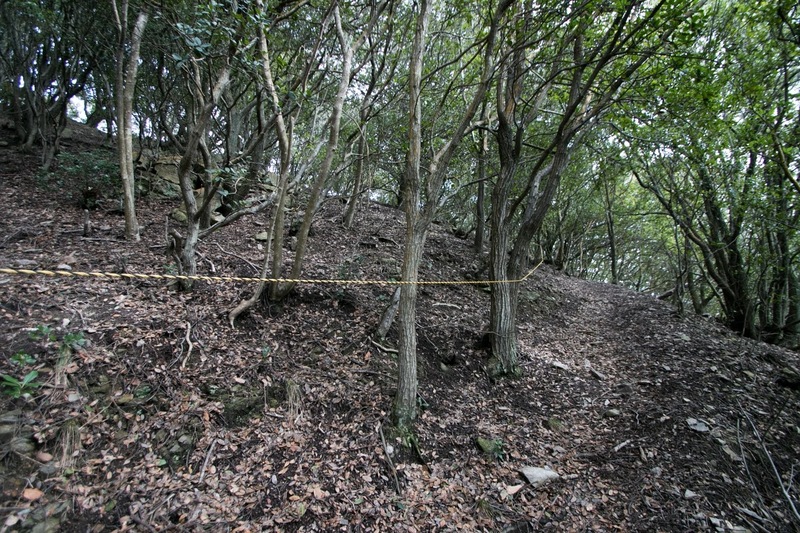 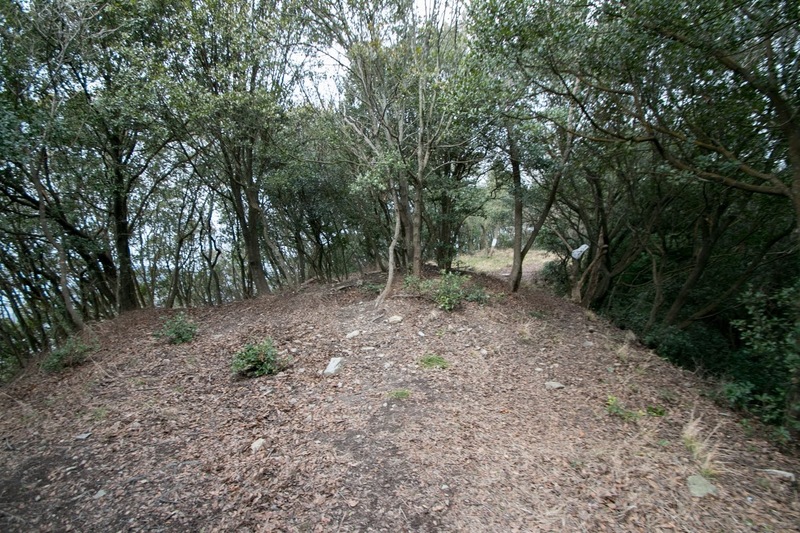 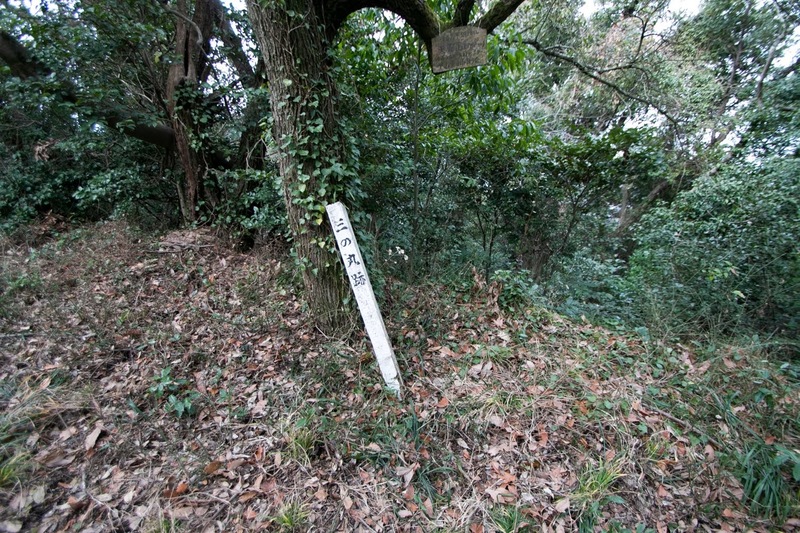 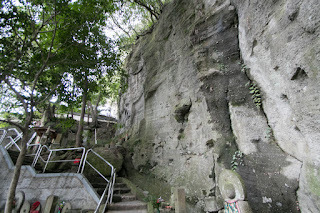 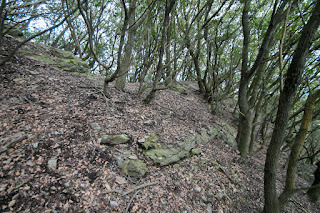 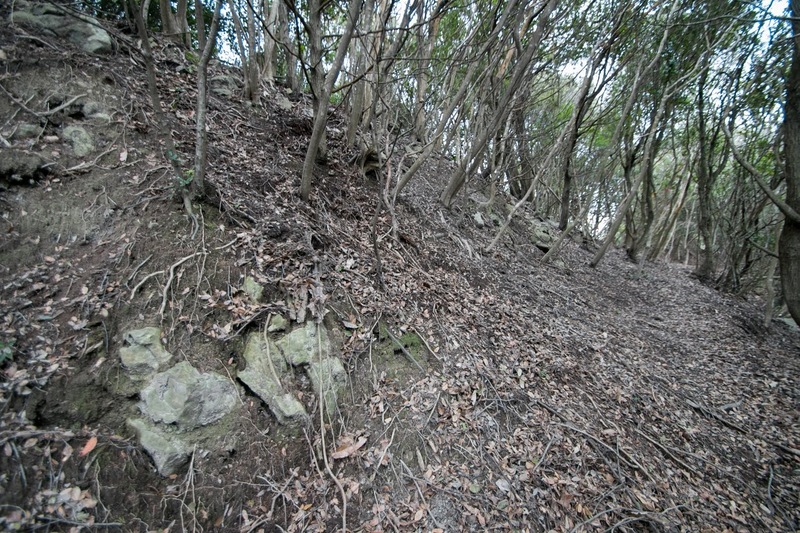 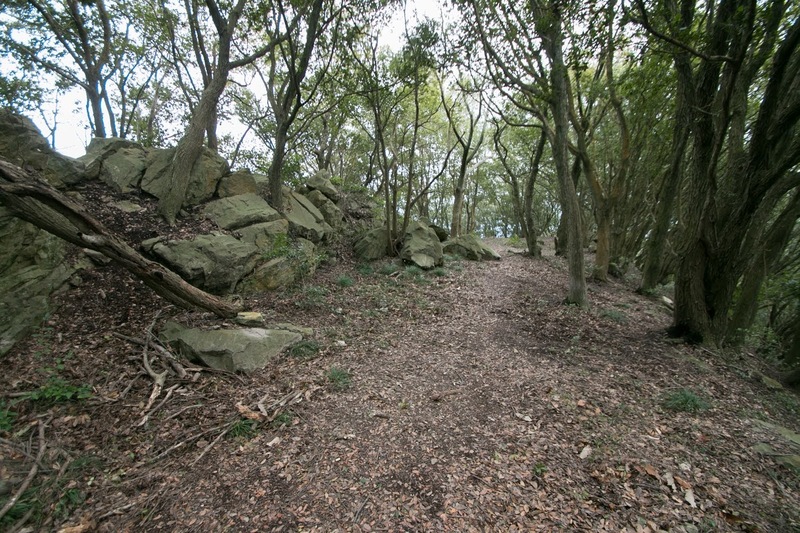 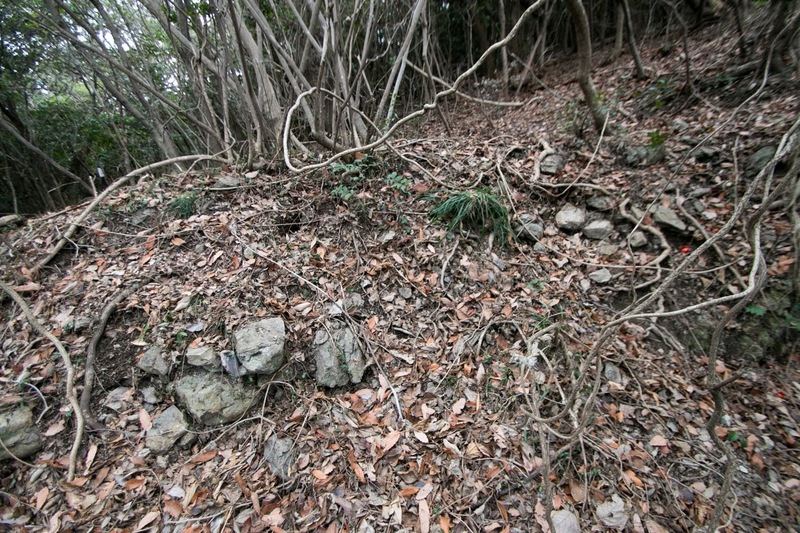 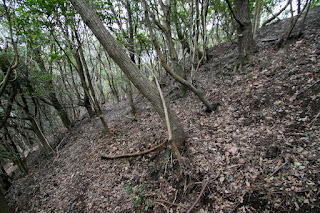 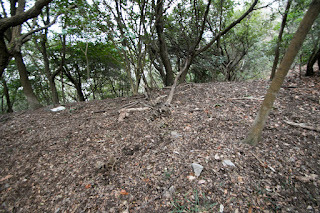 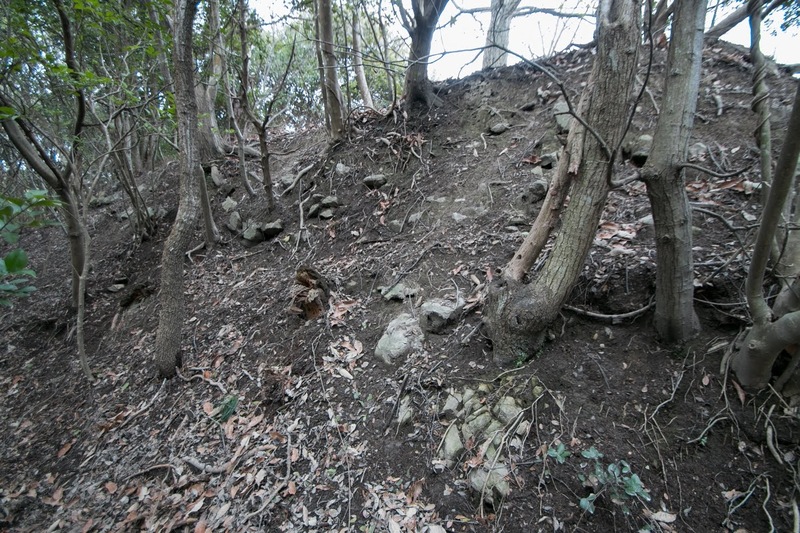 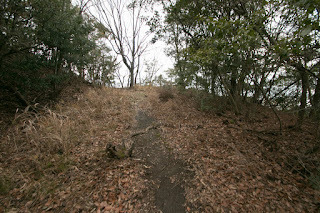 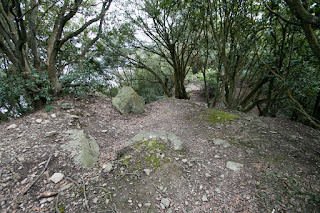 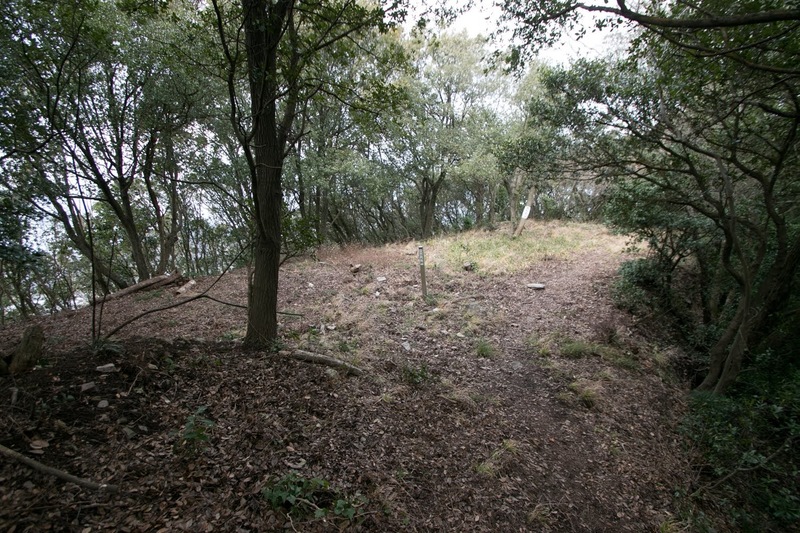 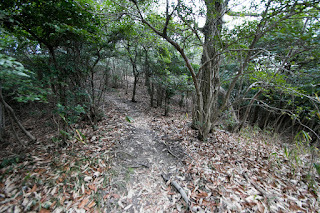 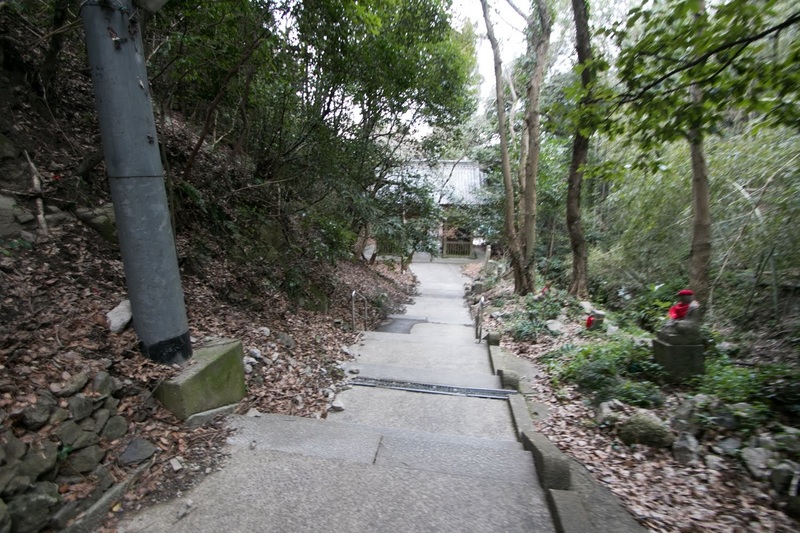 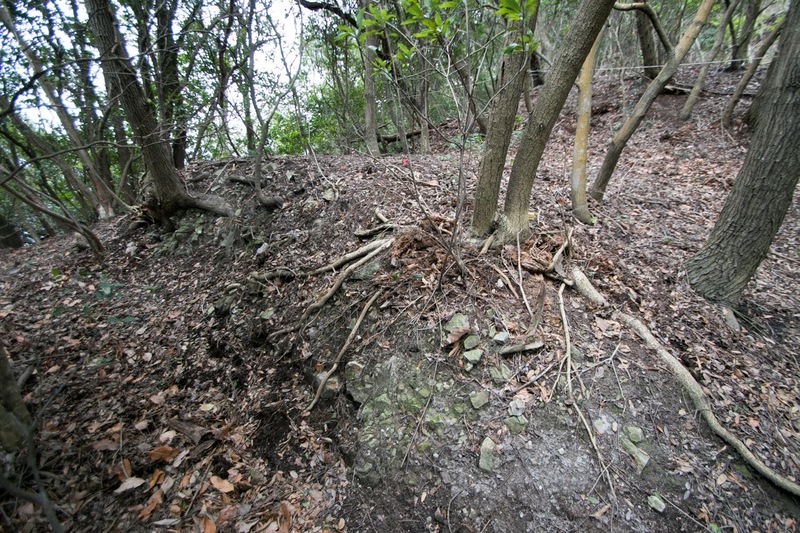 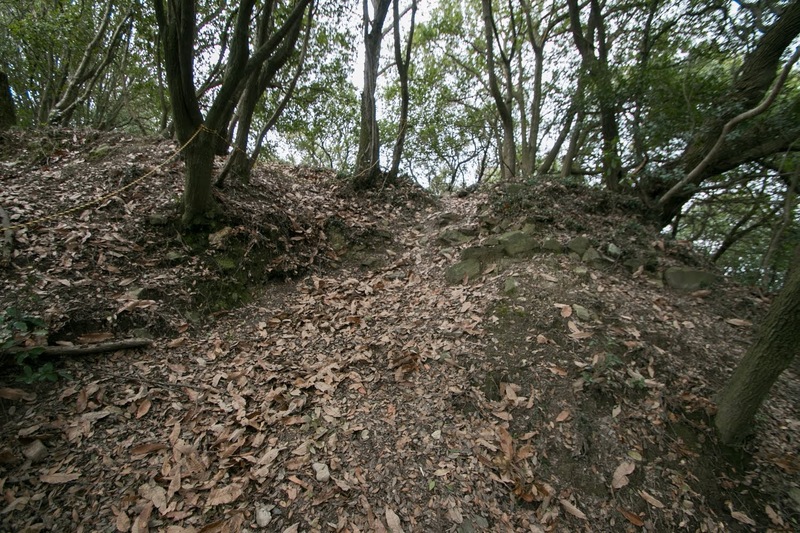 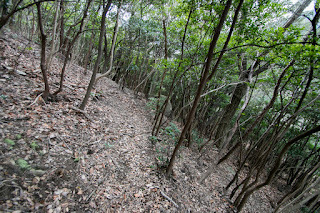 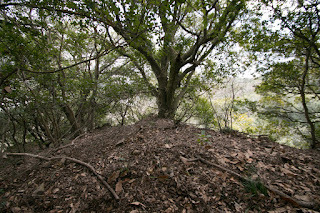 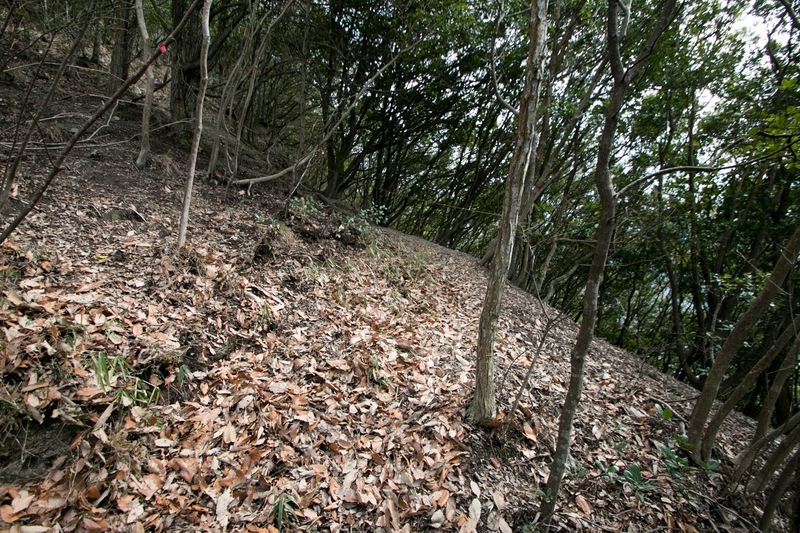 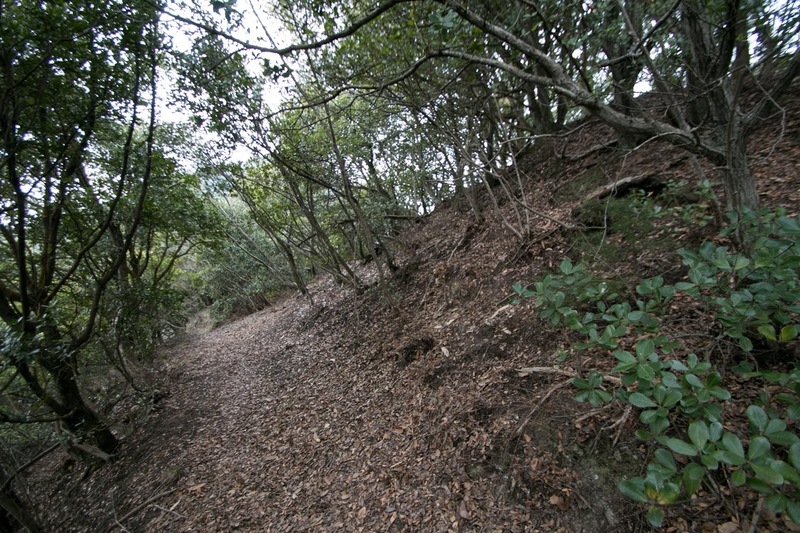 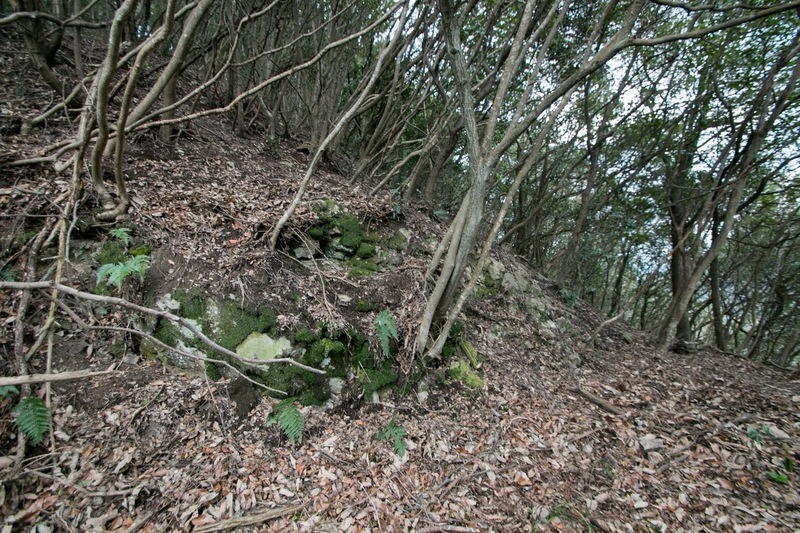 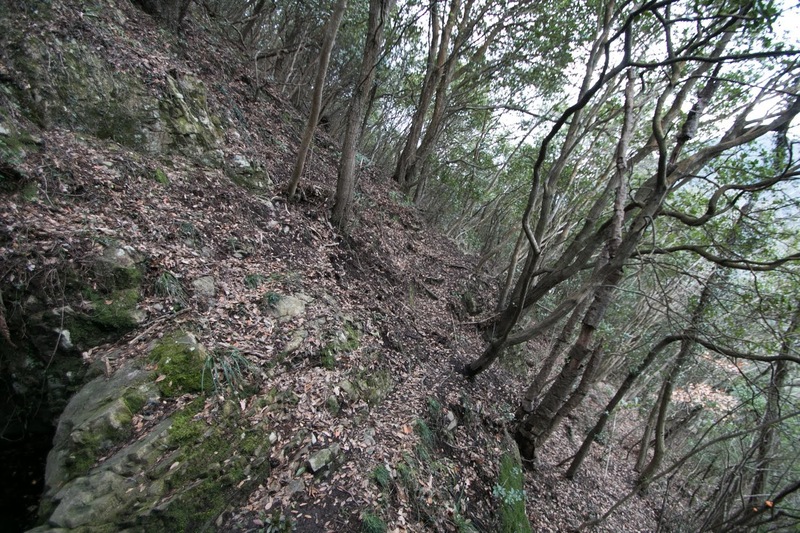 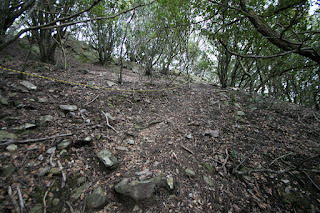 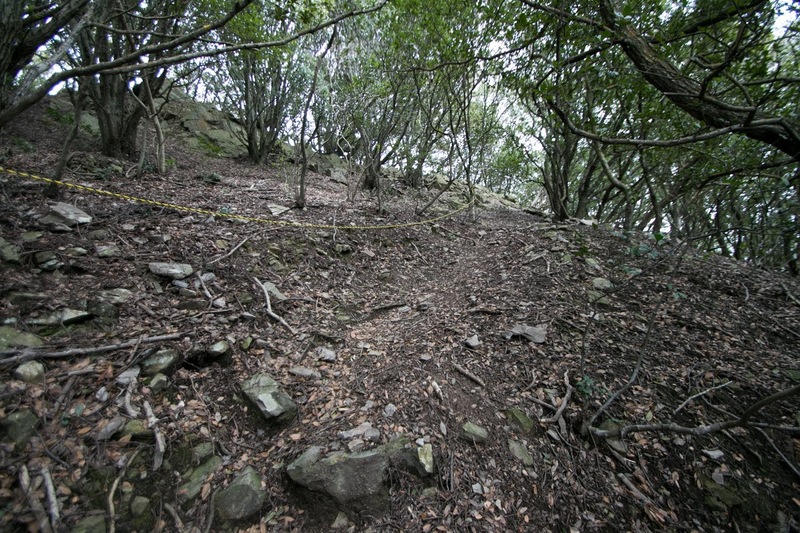 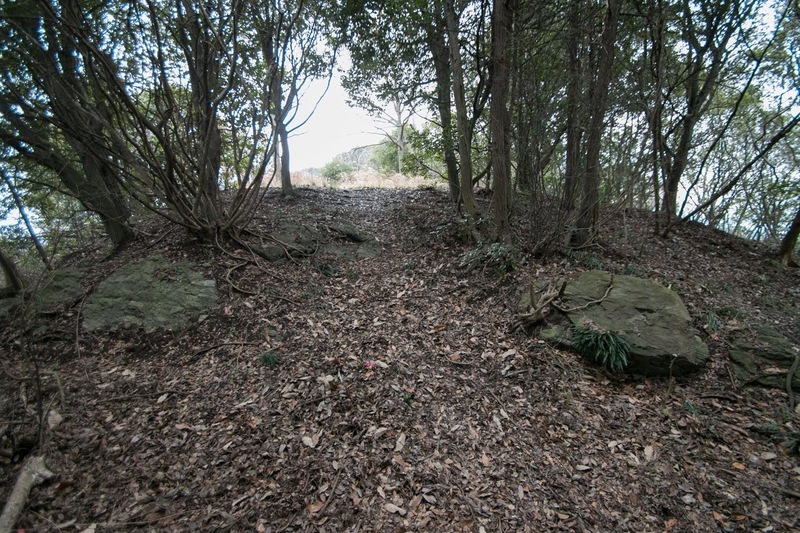 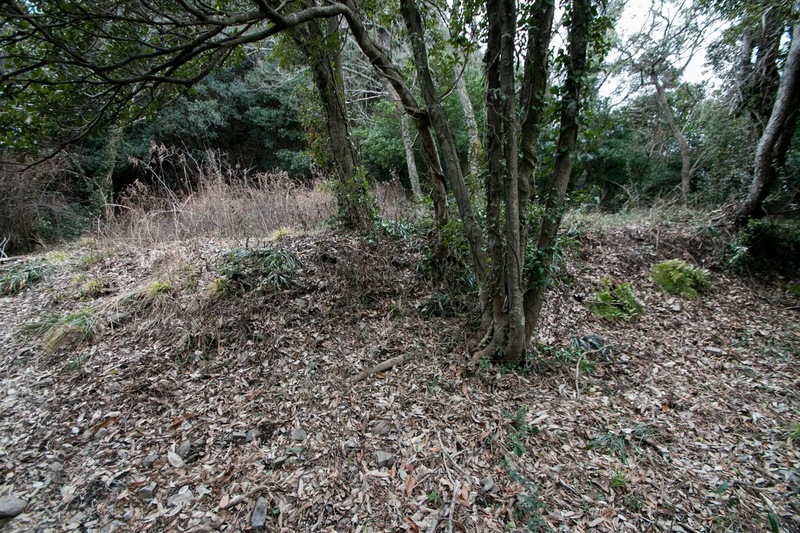 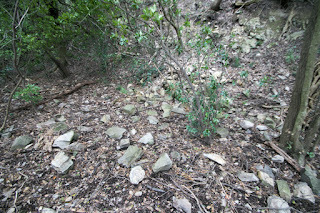 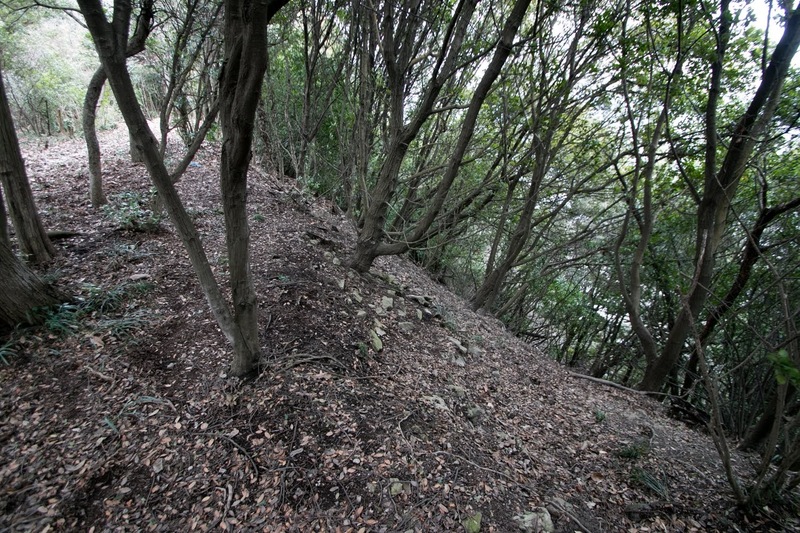 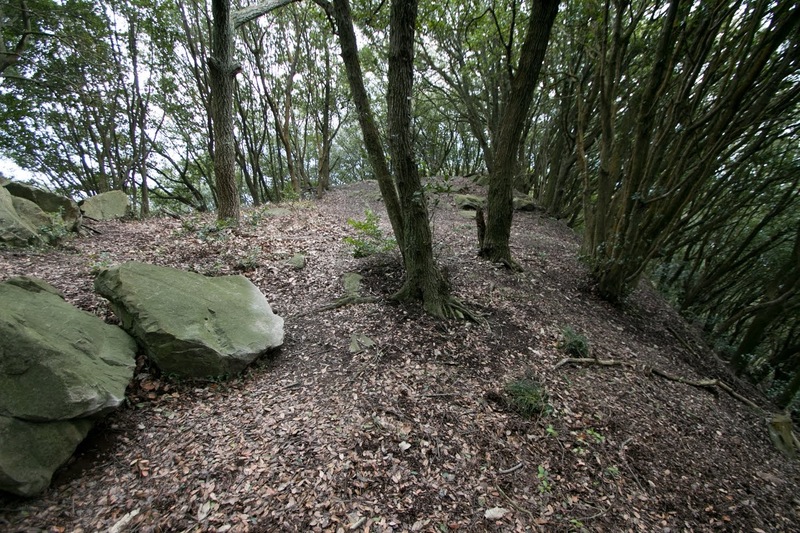 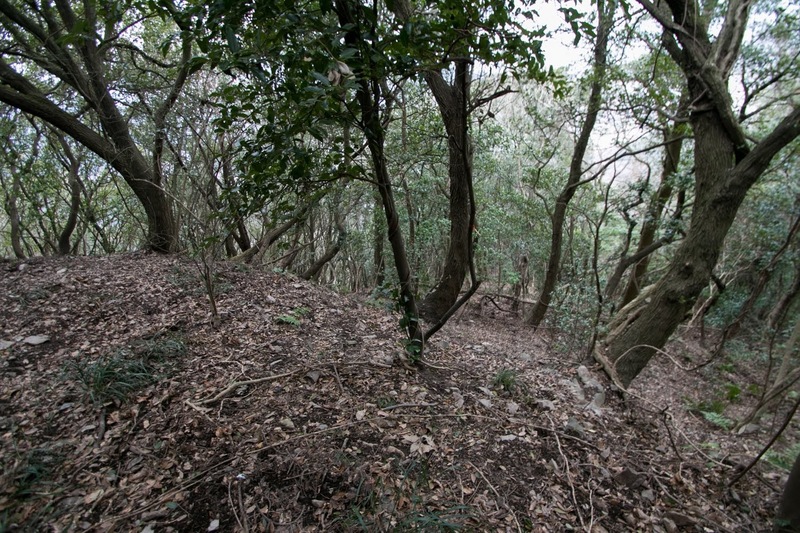 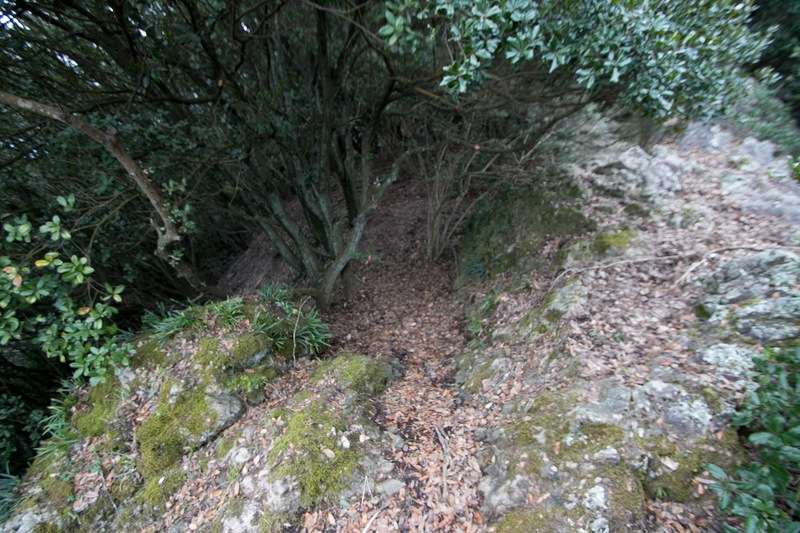 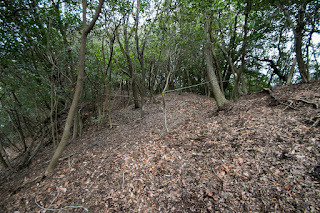 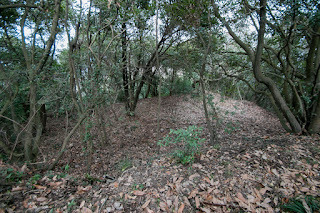 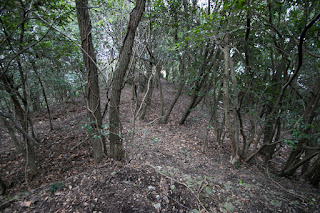 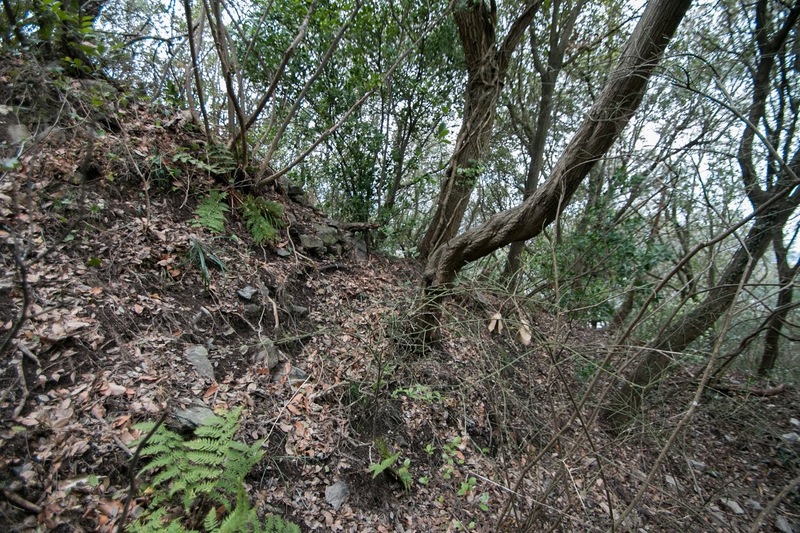 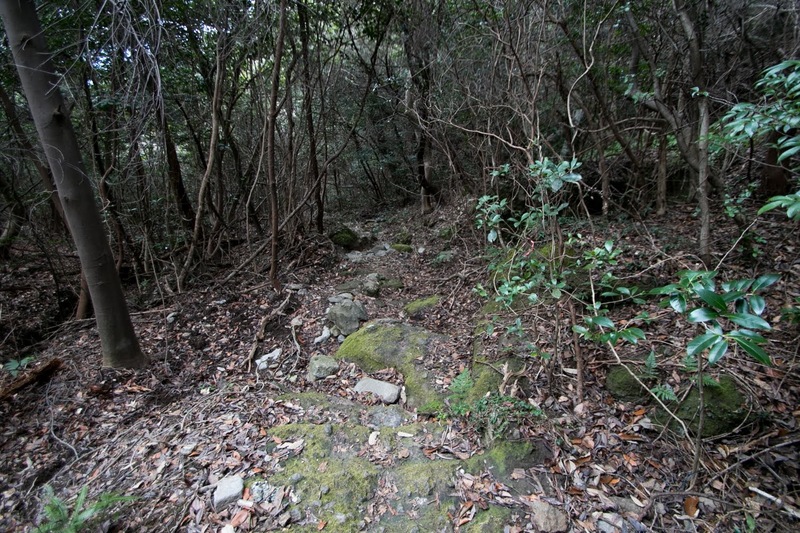 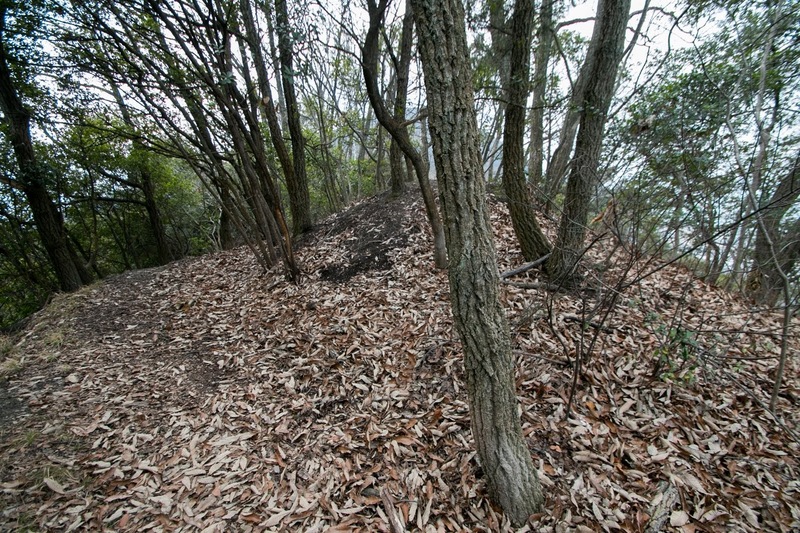 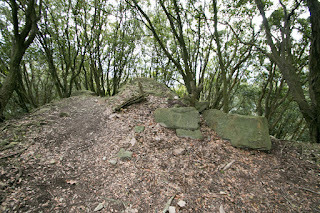 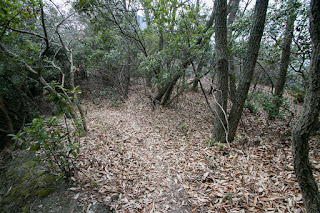 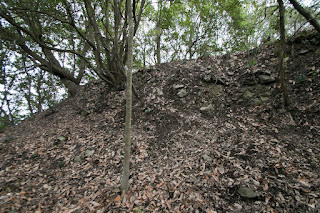 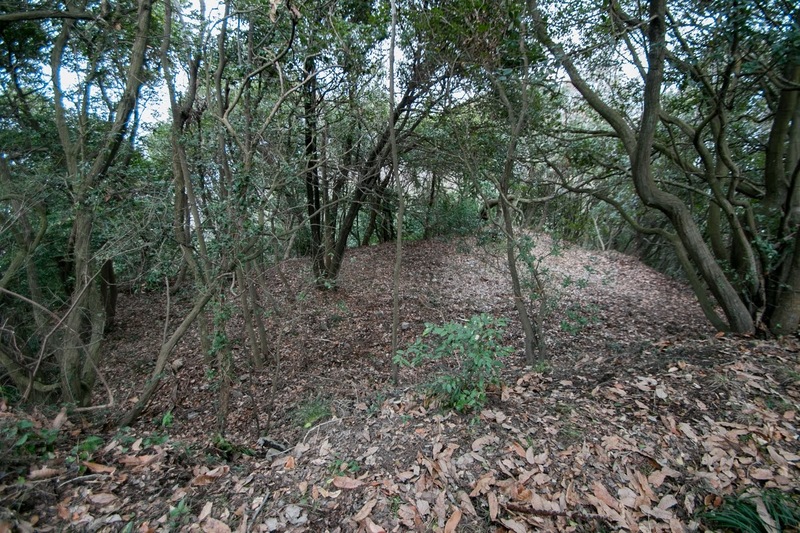 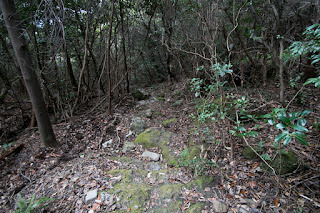 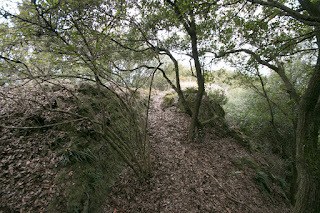 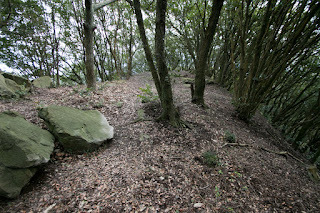 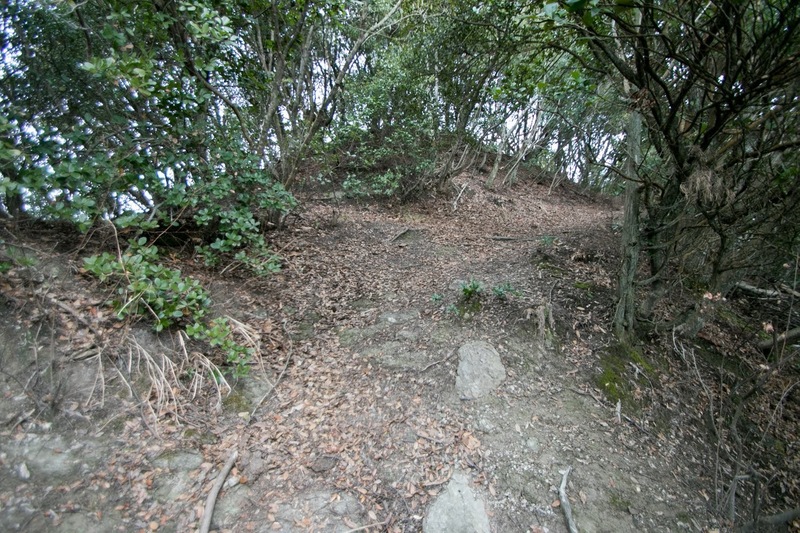 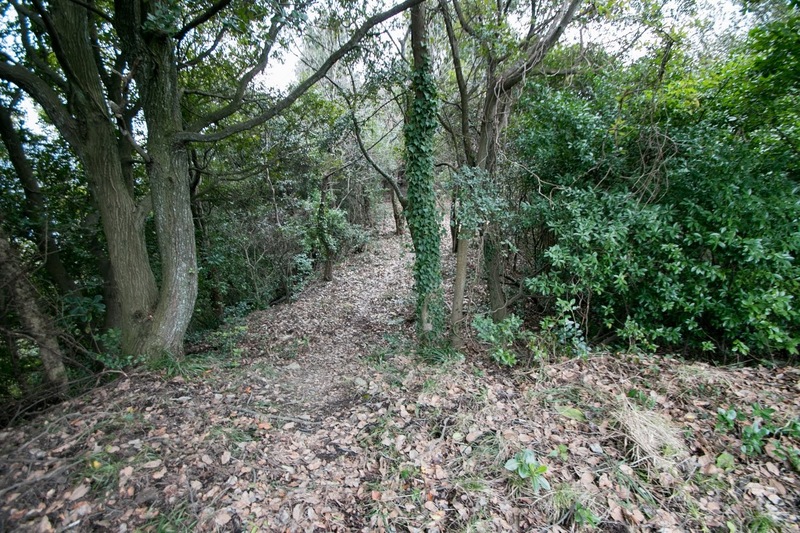 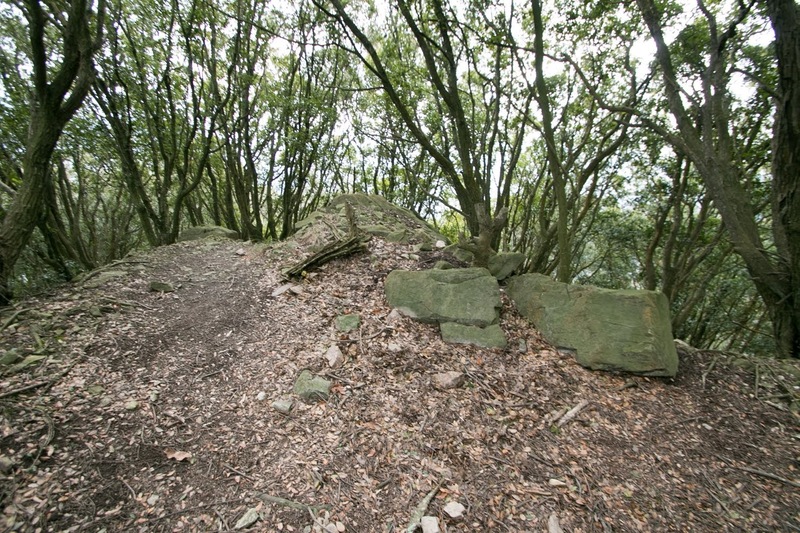 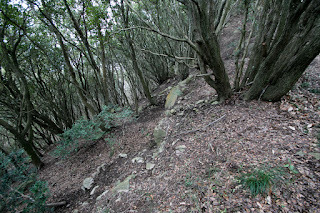 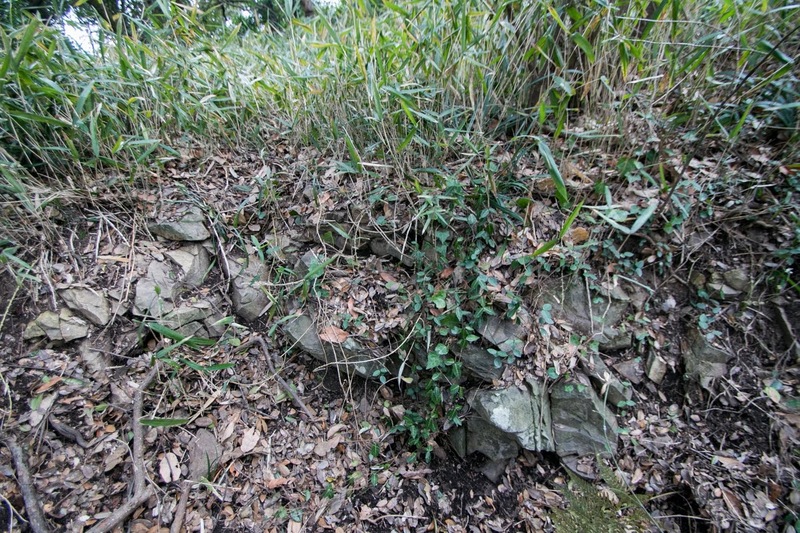 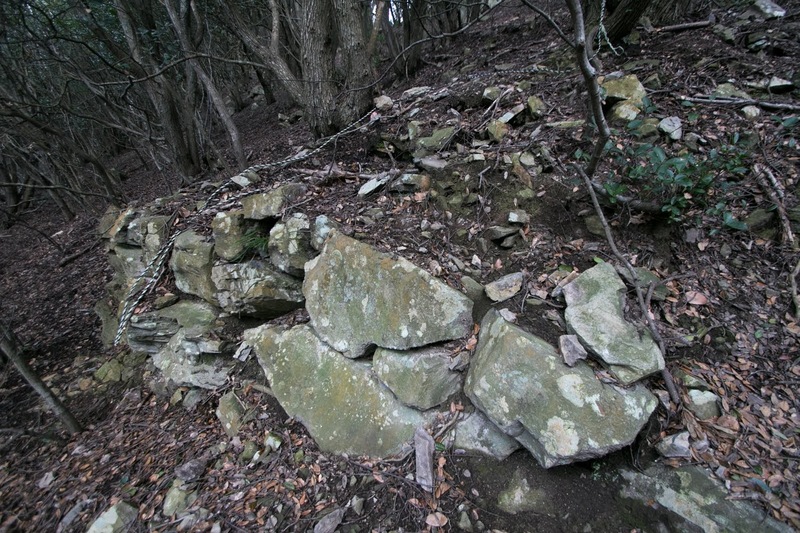 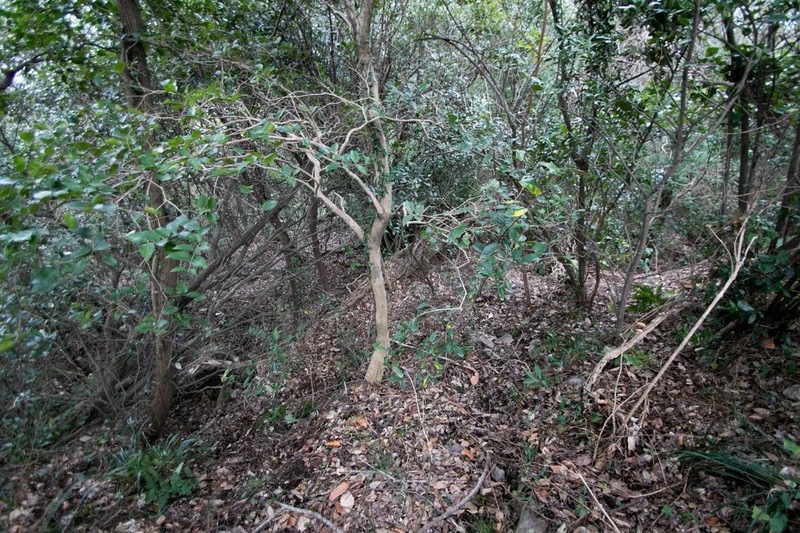 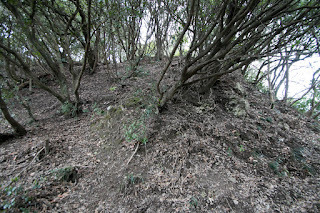 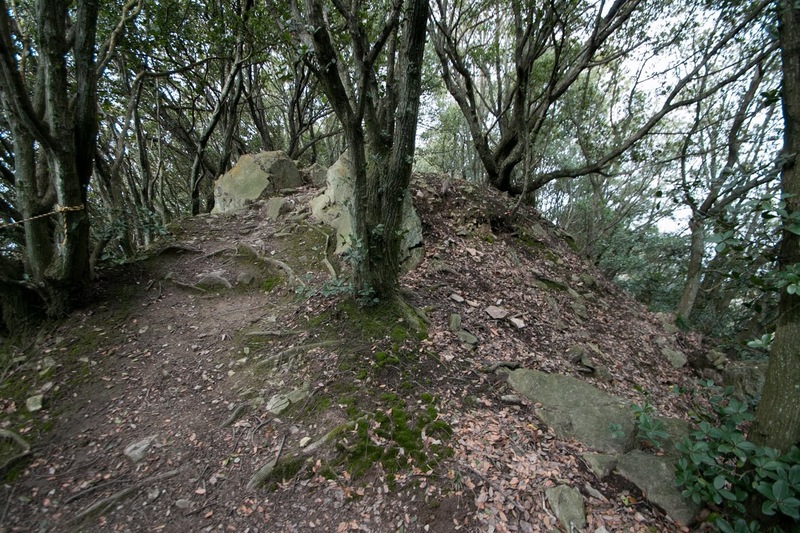 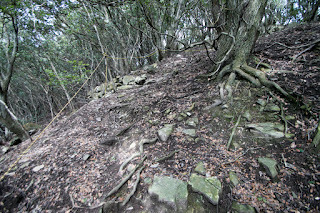 Because of this, just below of the south gate of central area, there is a line of stone wall which might be used as a defense wall for the enemy climbing up the slope. Ahead of this, there are several flat areas which might work as front forts for enemy. On the other hand, ahead of north edge of core areas, lines of terraces continue along with three ridges, one for northward and two for eastward. 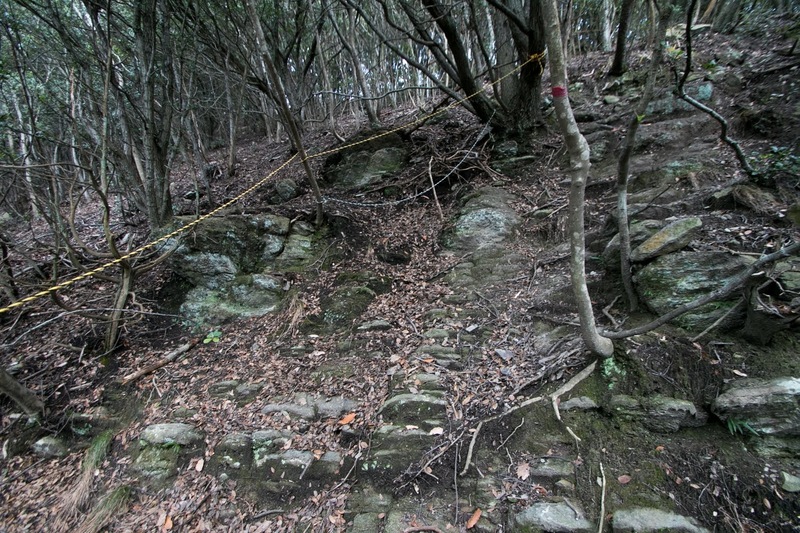 These terraces are also simple shapes just separated by straight slopes, but eastward line of terraces was destroyed by mining of rocks. Even though narrow, total length of the castle exceeds 800 meter and extraordinary large at the area, and showed the power of Kagawa clan. 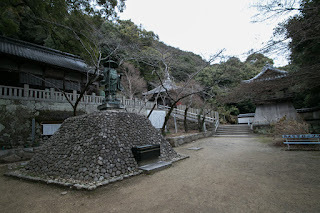 Around 1570, Miyoshi clan totally declined before the attack of central ruler Nobunaga Oda (1534-1582), and Kagawa clan raised against Nagaharu Miyoshi (1553-1577), an authoritarian leader of Miyoshi clan. 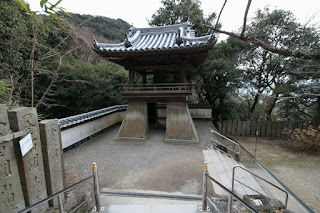 Kagawa clan broke Miyoshi army and kept independence, but at the same time Motochika Chosokabe (1539-1599), the warlord of Tosa province, started his campaign to unite Shikoku island. In 1577, Motochika Chosokabe entered into Sanuki province from his military headquarer Hakuchi castle. Kagawa clan tried to defend Chosokabe army but could not stop thus Yukikage Kagawa (1527-1600), the leader of Kagawa clan, subordinated to Chosokabe army. 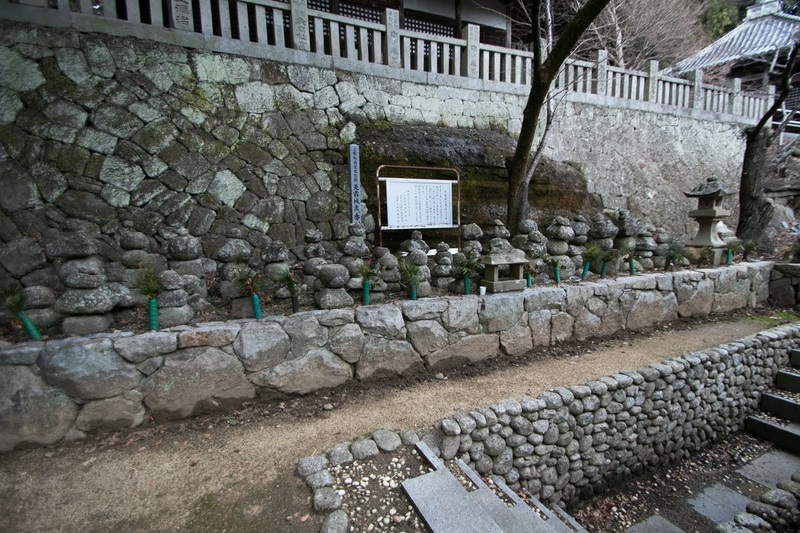 Kagawa clan adopted the son of Motochika as their leader and became an important retainer. Next several years Kagawa clan contributed to the expansion of Chosokabe clan at Sanuki province, and by 1584 Motochika Chosokabe grasped most part of Shikoku island. 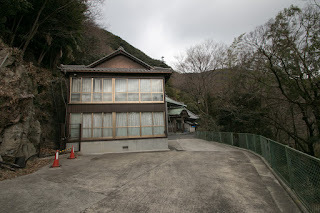 If this situation continued, Yukikaga might retire and round the pilgrim road as a priest. But situation did not allow it as central ruler Hideyoshi Toyotomi (1537-1598) sent large army to subjugate Chosokabe clan in 1585. 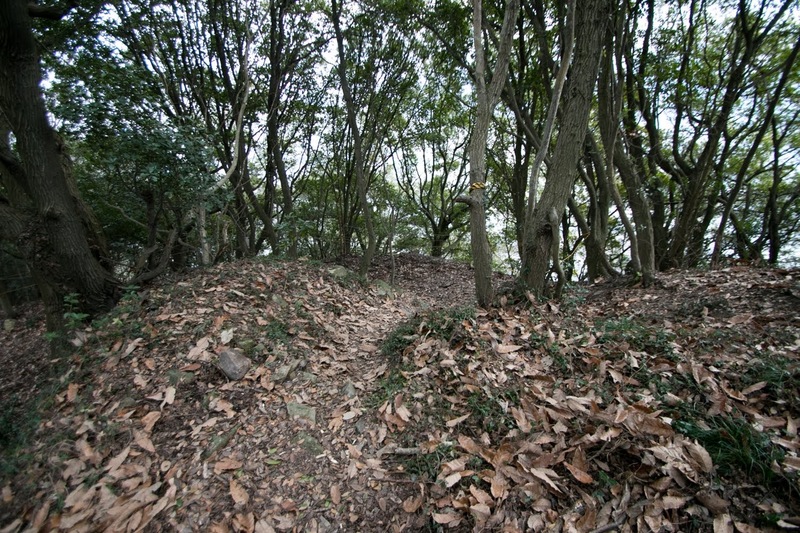 Being overwhelmed by Toyotomi army, Chosokabe army could not make organized resistance and surrendered to Hideyoshi after two month battle. 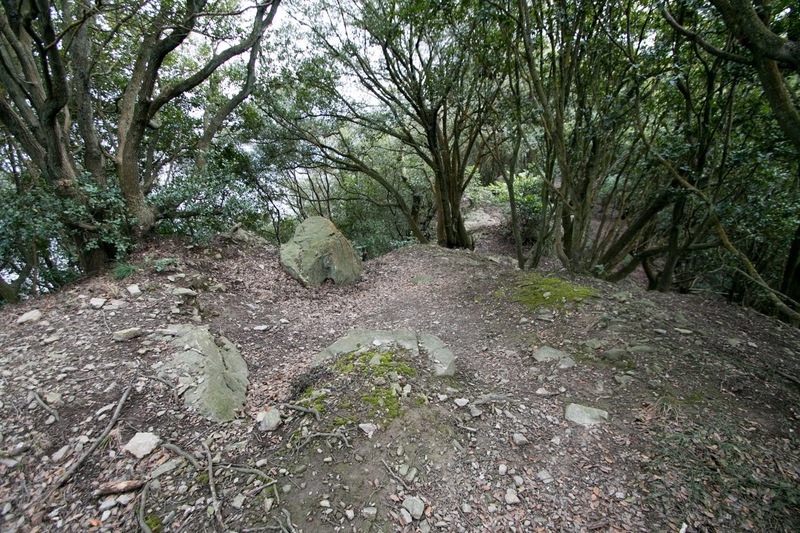 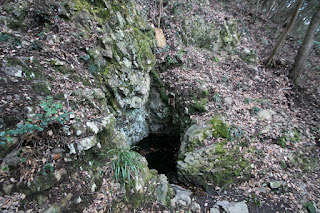 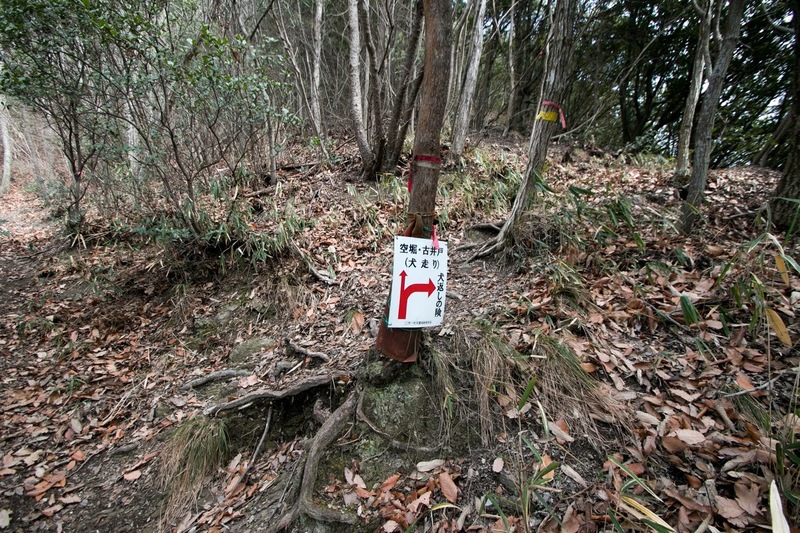 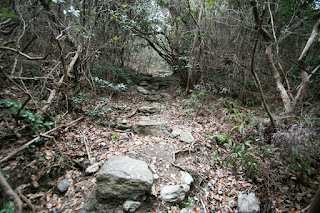 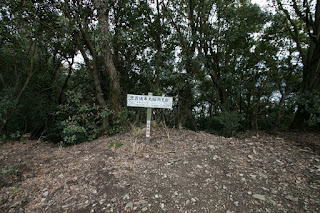 Territory of Chosokabe clan was decreased only to Tosa province, and Kagawa clan lost Amagiri castle. Yukikage Kagawa moved to Tosa province and became a retainer of Motochika, and new lord Hidehisa Sengoku (1552-1614) abolished Amagiri castle. 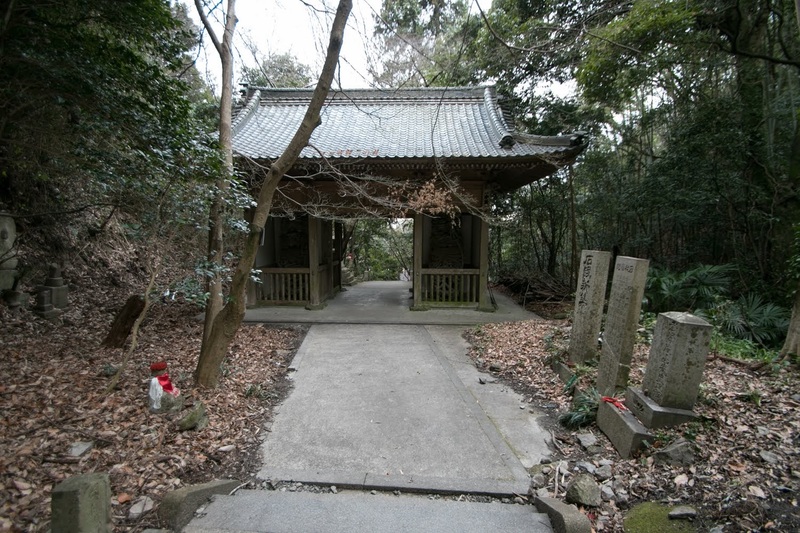 Motochika Chosokabe became the feudal lord under Toyotomi government, but suffered severe defeat at the battle of Hetsugigawa against Shimazu clan in 1587 and lost its successor Nobuchika Chosokabe (1565-1587). 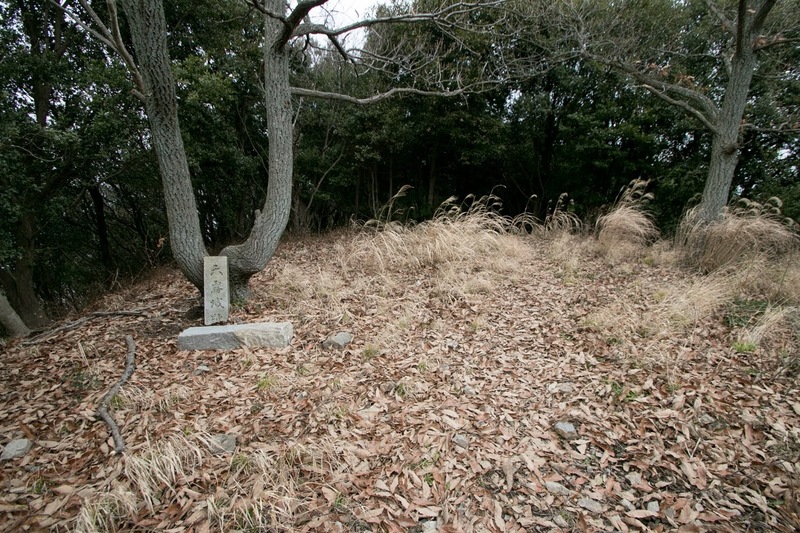 Adopted son from Chosokabe clan died being involved internal conflict for successor, and Chosokabe clan itself ruined after the battle of Sekigahara in 1600. 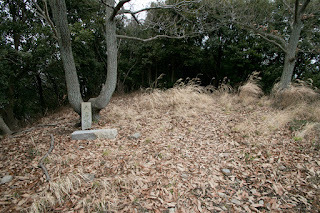 At this time Kagawa clan also disappeared into the history. 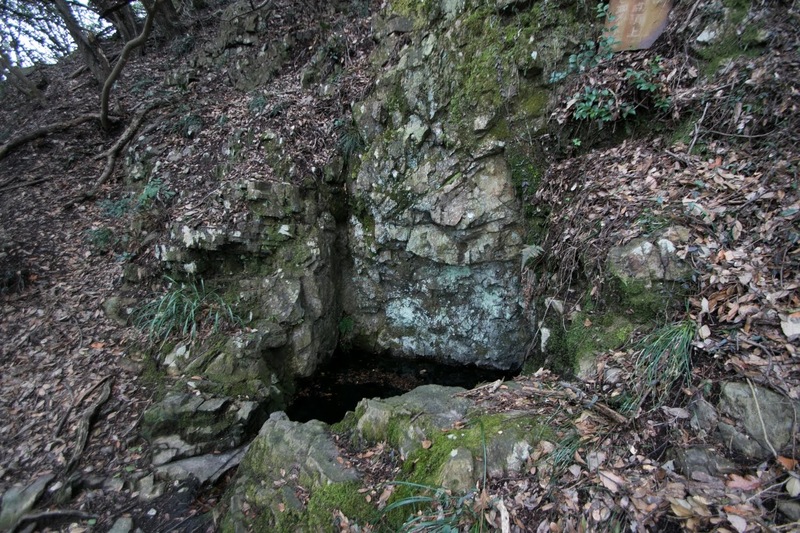 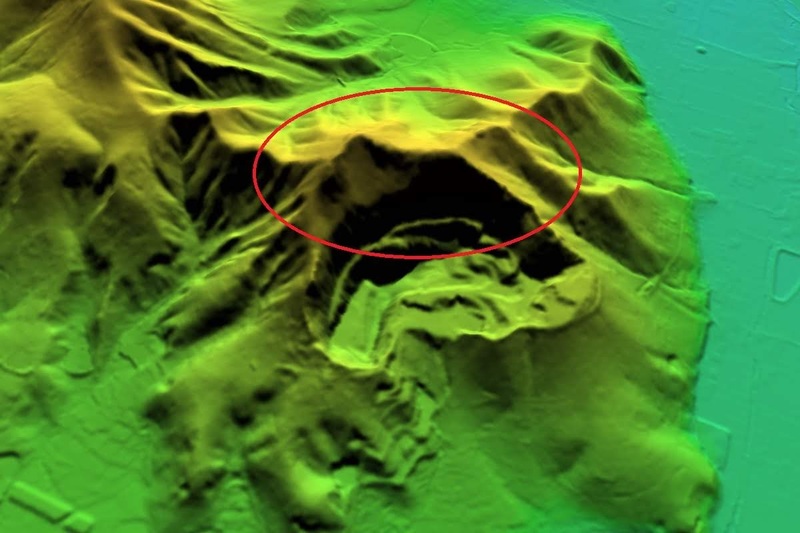 Now all building was lost but structure of core part still remain around the peak, except for destructed part by rock mining. Iyadani-temple is one of the major temples of pilgrim road and many people visit, but as it needs 30 minutes extra walk, castle site is quite quiet. 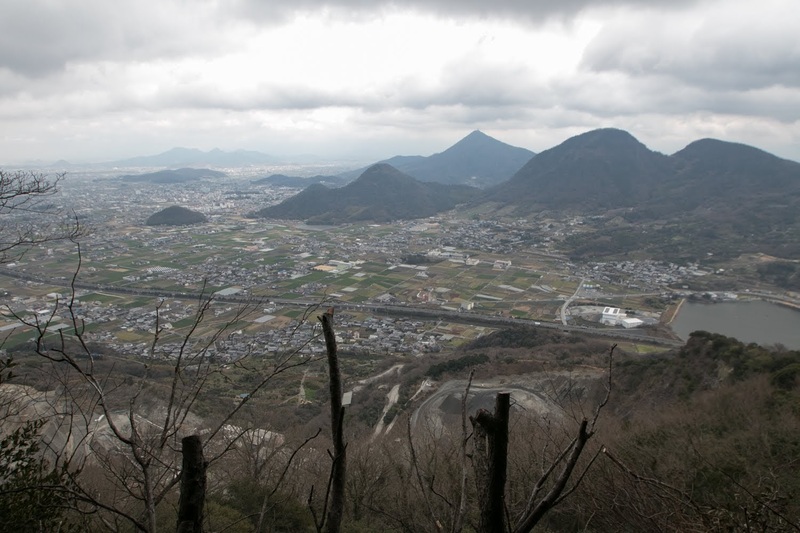 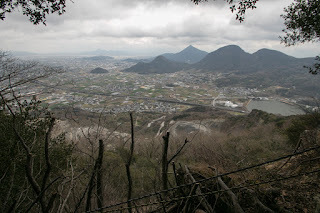 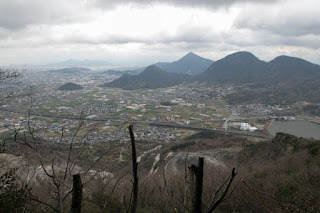 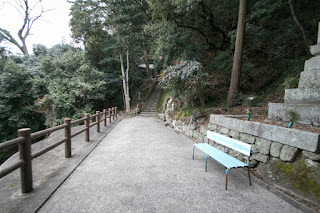 As pilgrim road passes the saddle point of Iyadani-yama mountain and Amagiri-yama mountain, Amagiri castle formerly looks down whole territory of Kagawa clan now watches passing pilgrims. 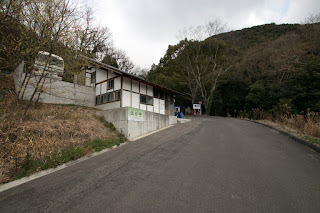 Bus from JR Shikoku Yosan-sen line Takuma station or Mino station to Iyadani-tera temple. 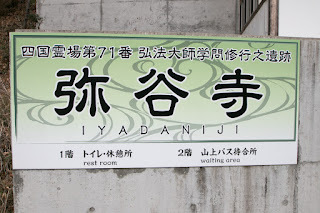 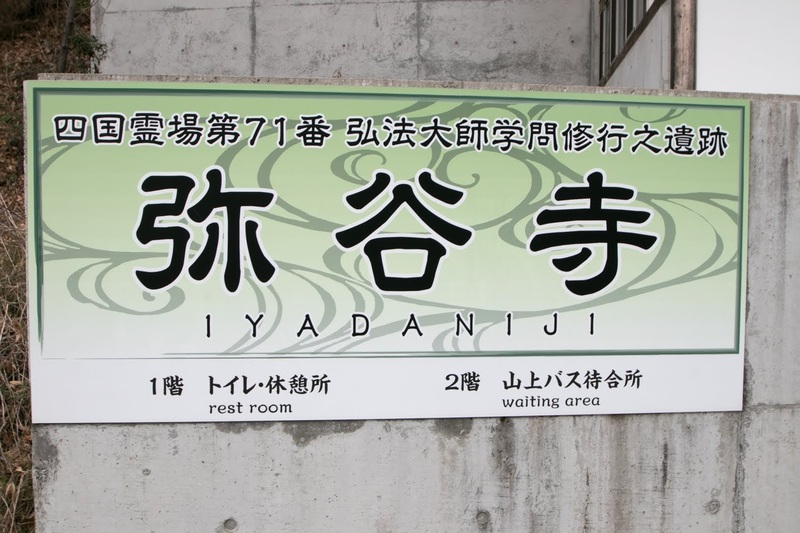 30 minutes drive from Takamatsu Jidoshado Mitoyo-Tossaka interchange to parking of Iyadani-tera temple. 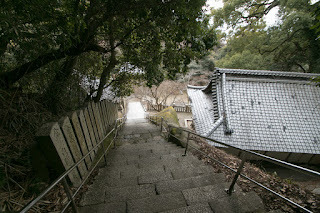 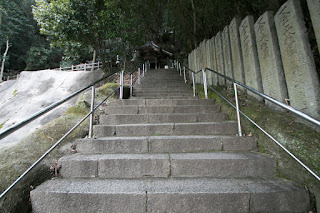 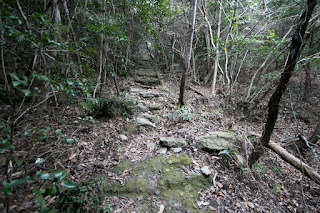 Climbing road to castle starts from inside of temple.